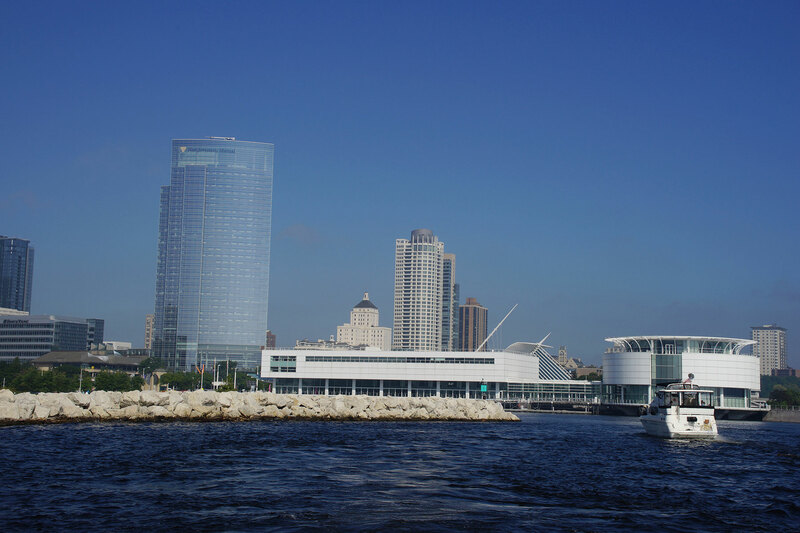 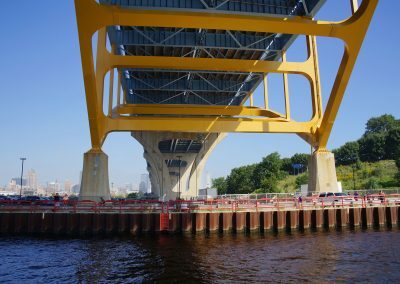 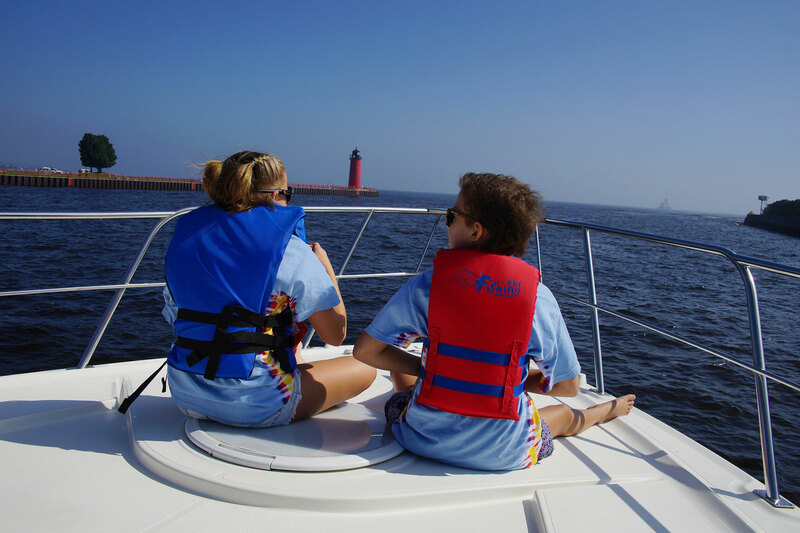 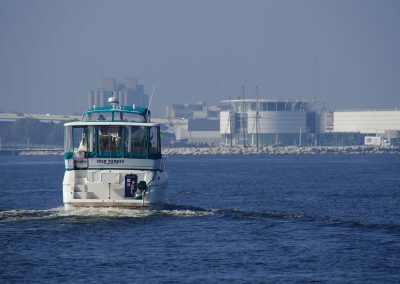 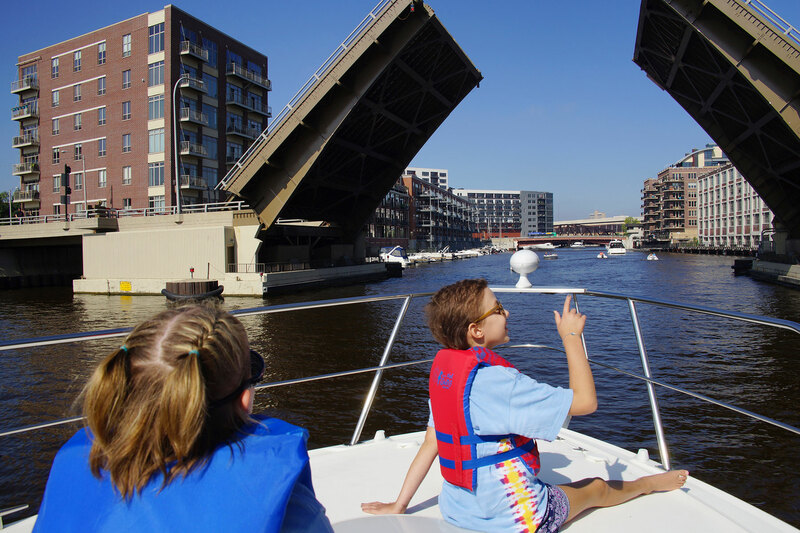 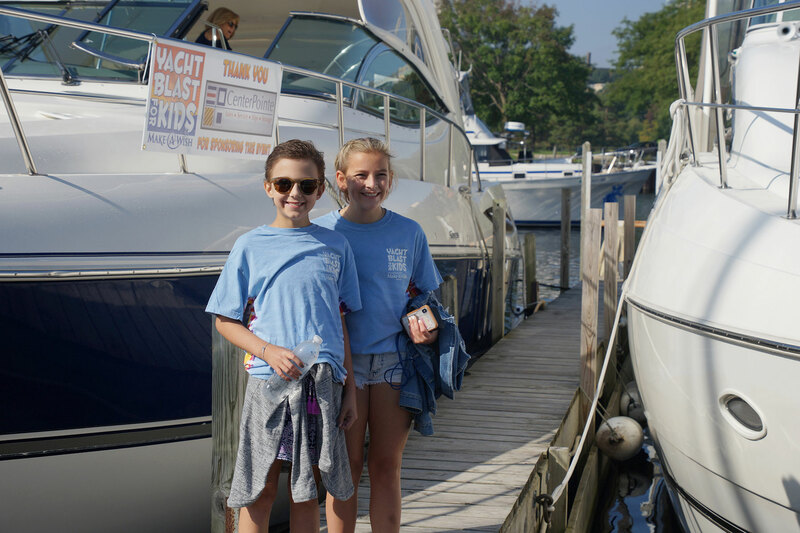 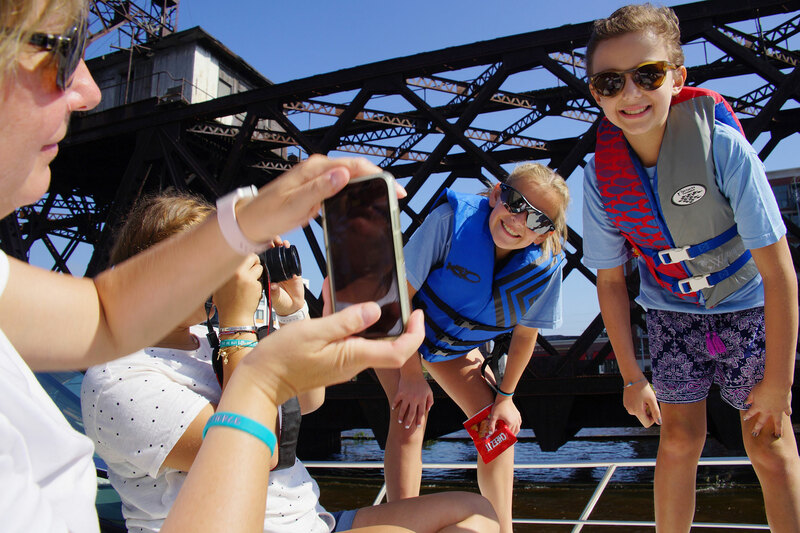 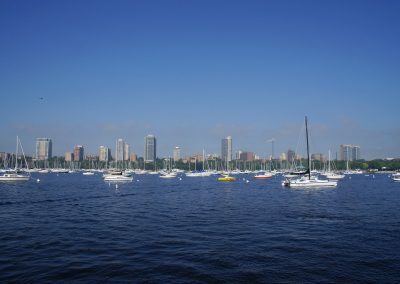 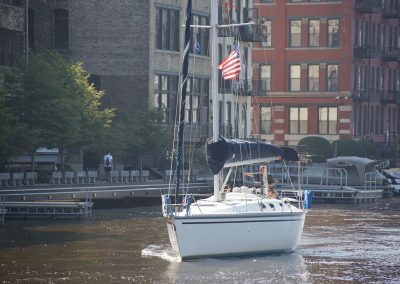 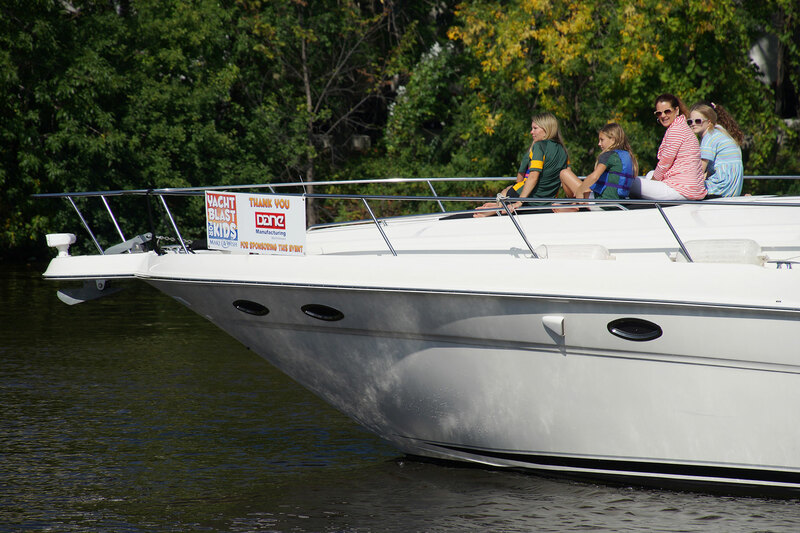 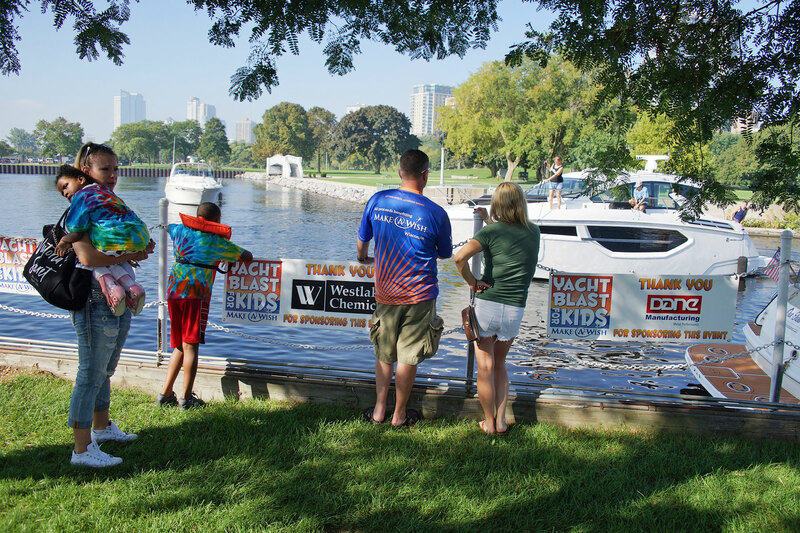 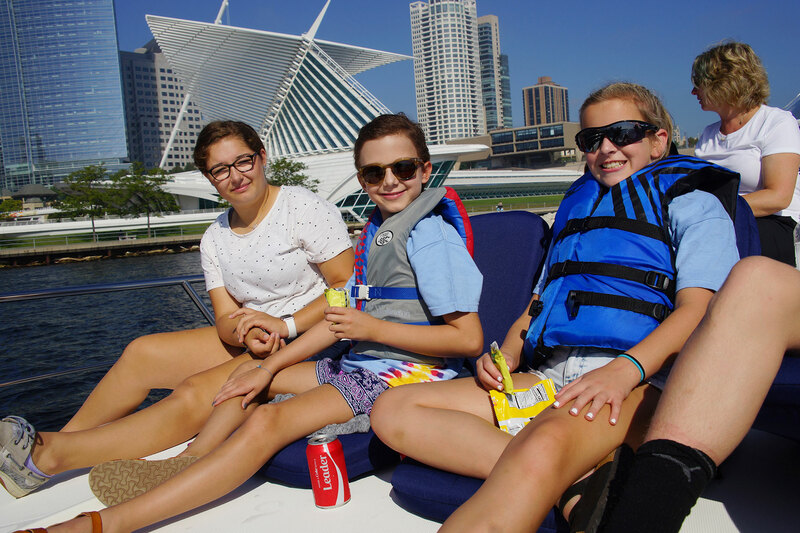 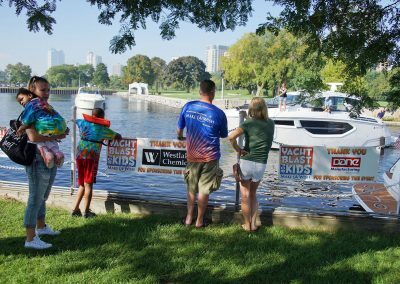 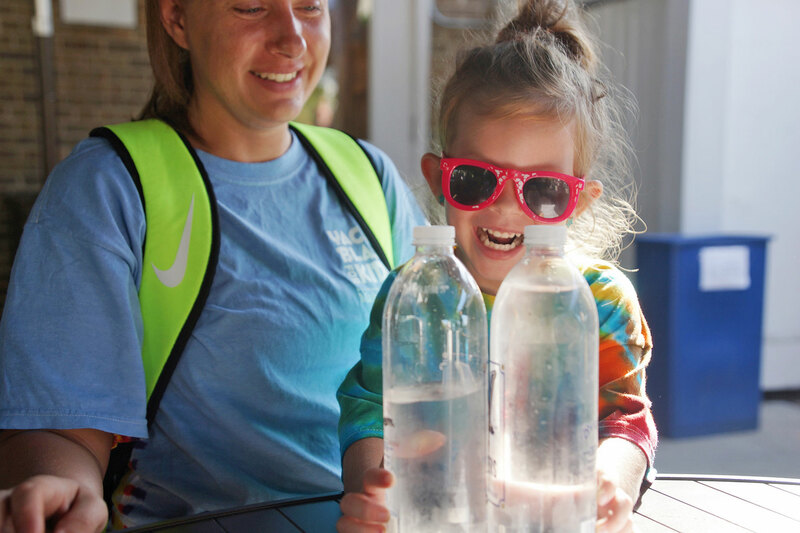 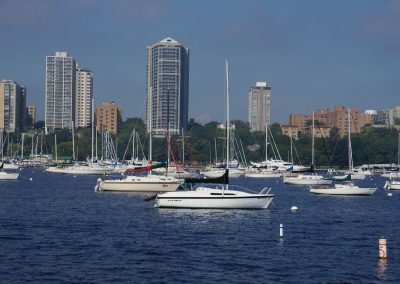 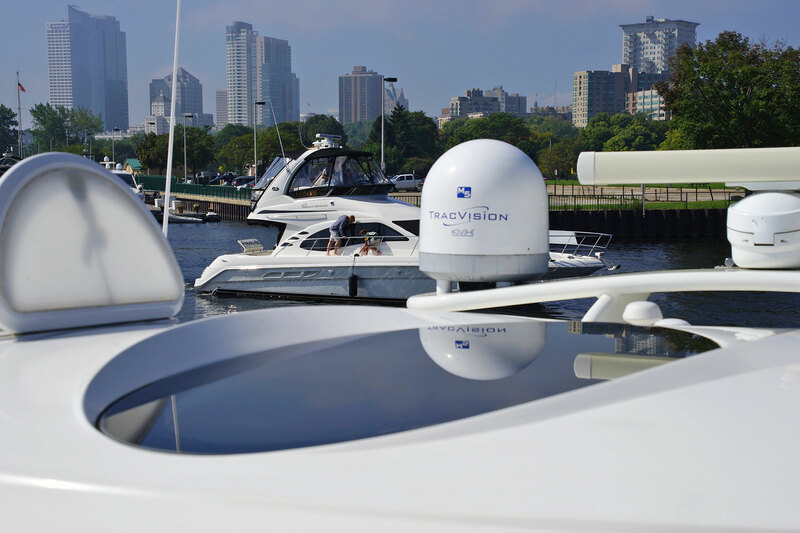 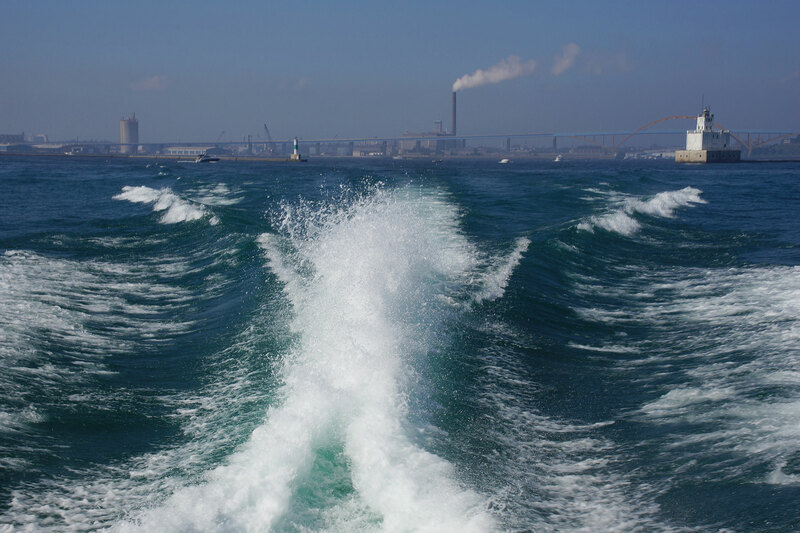 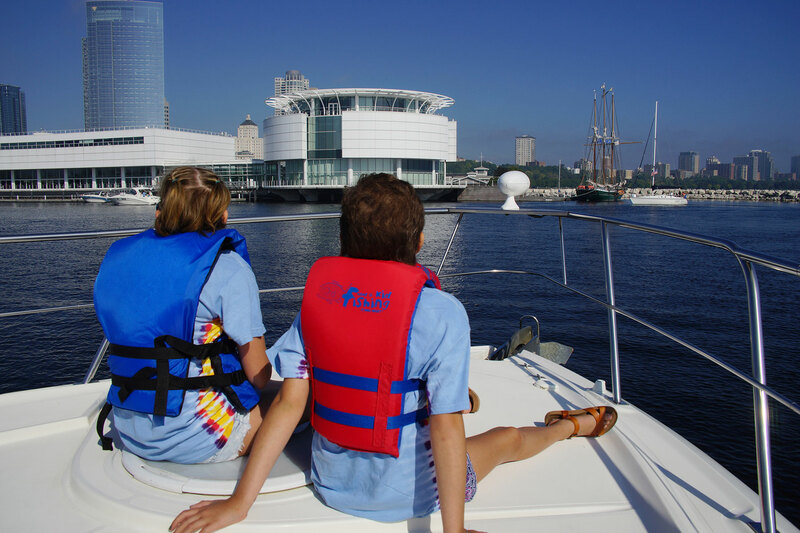 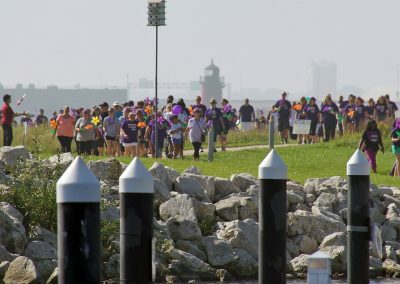 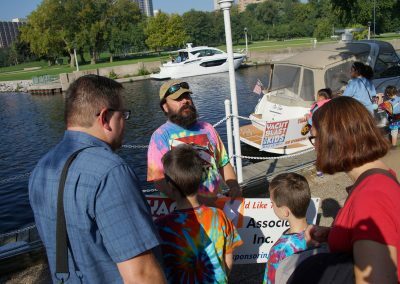 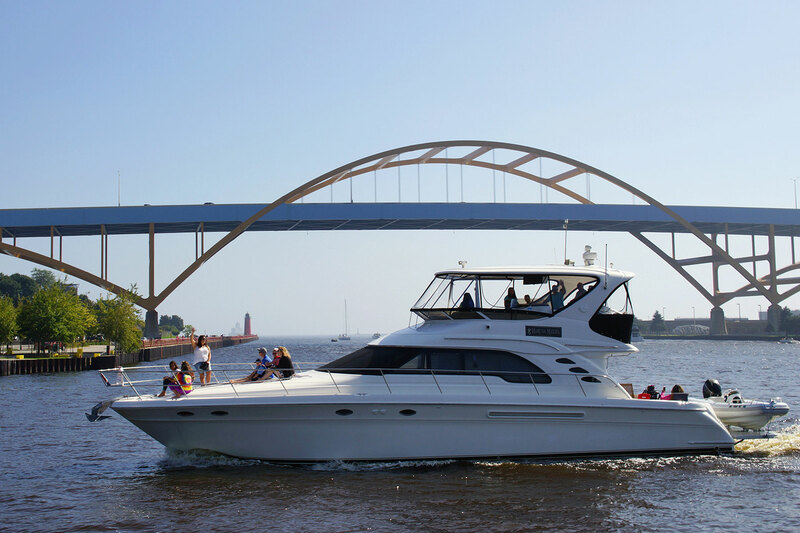 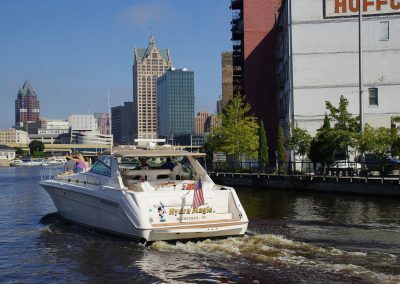 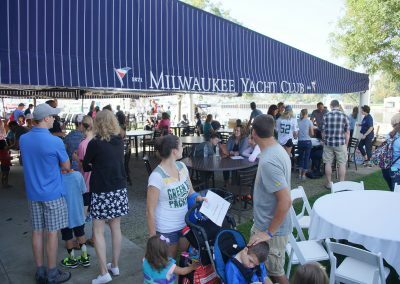 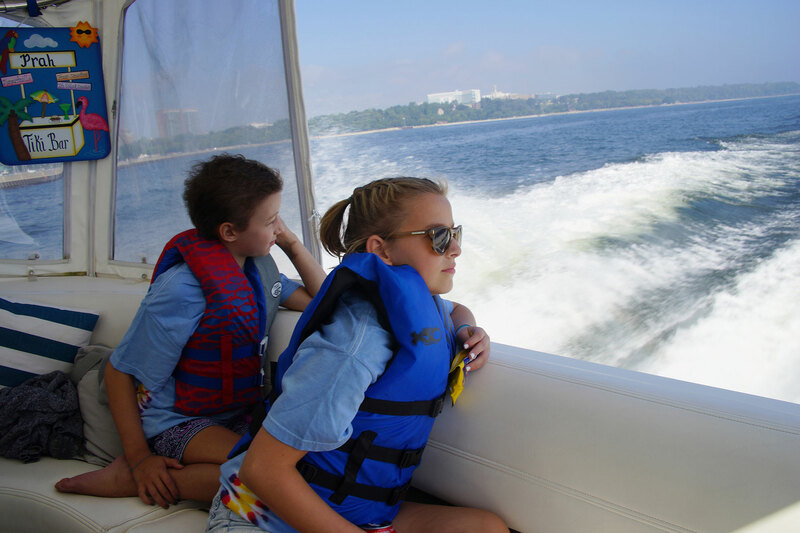 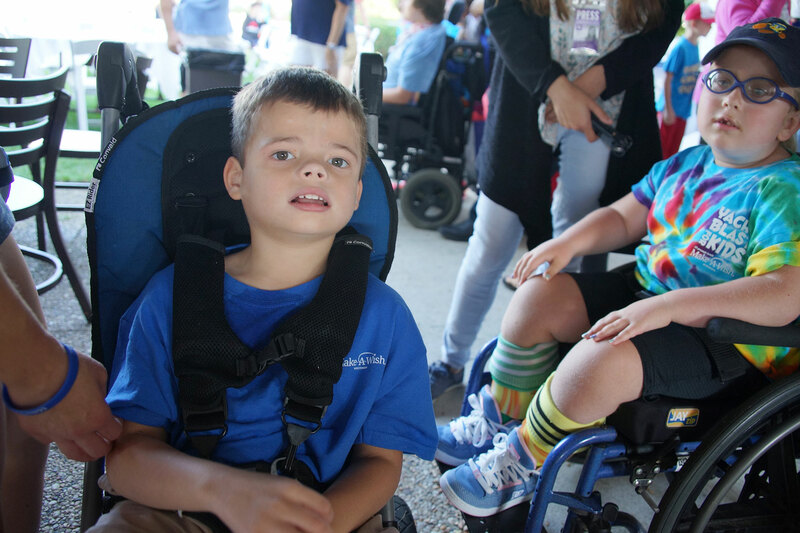 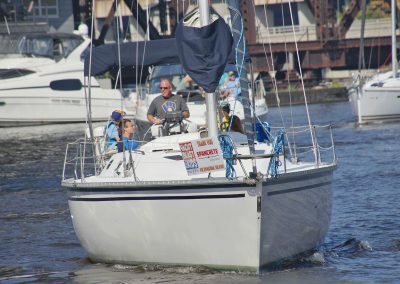 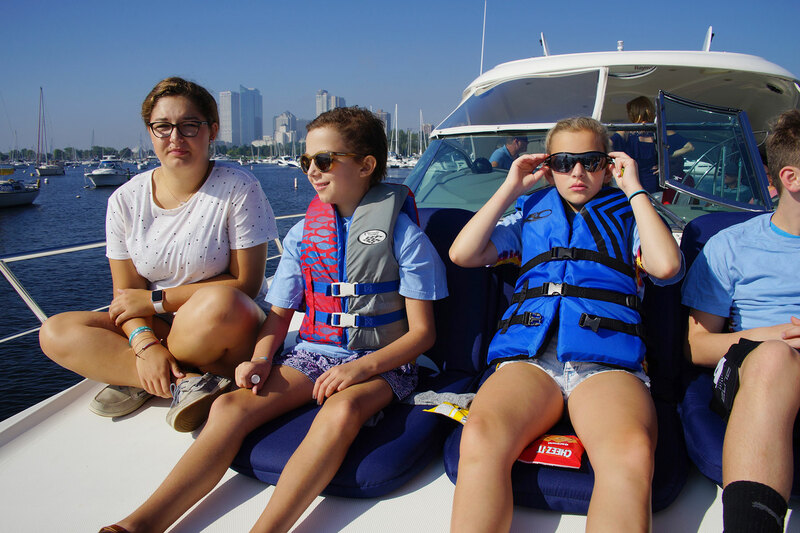 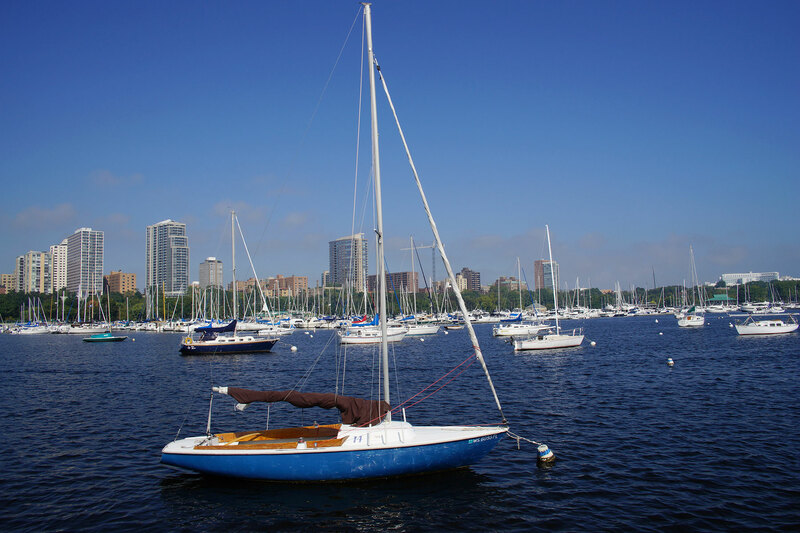 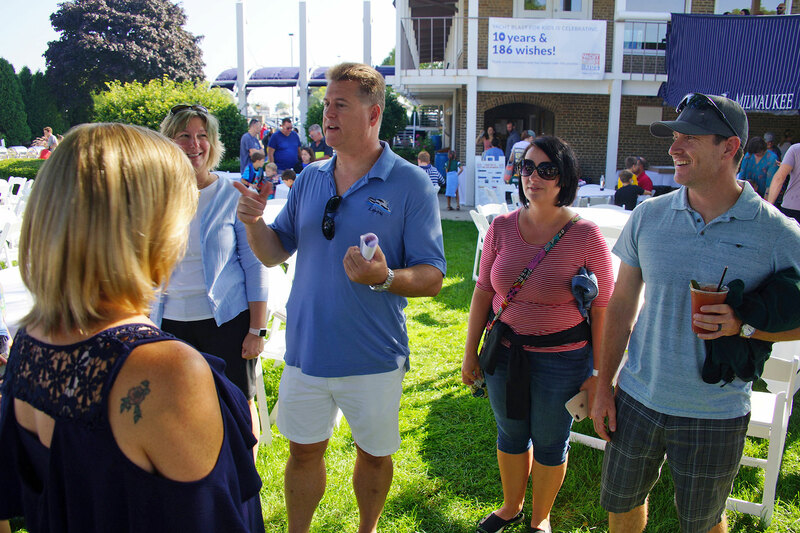 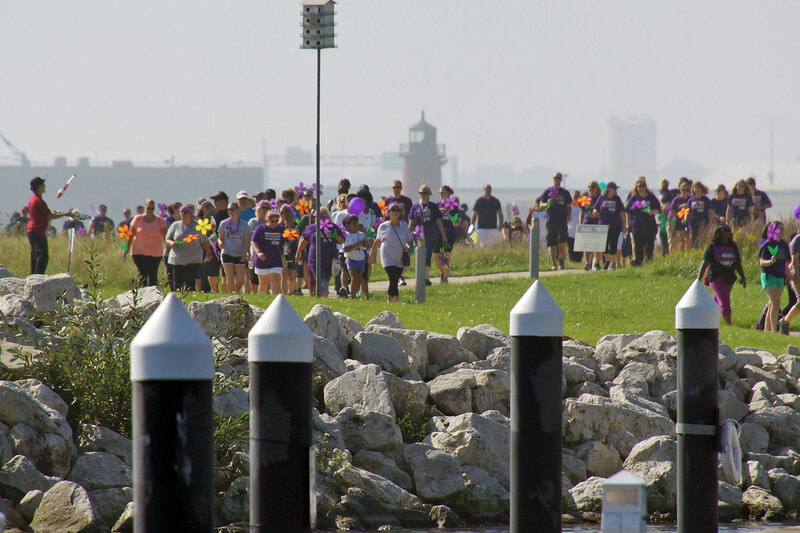 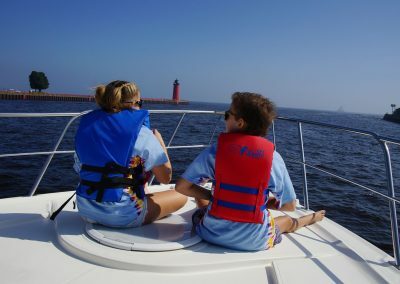 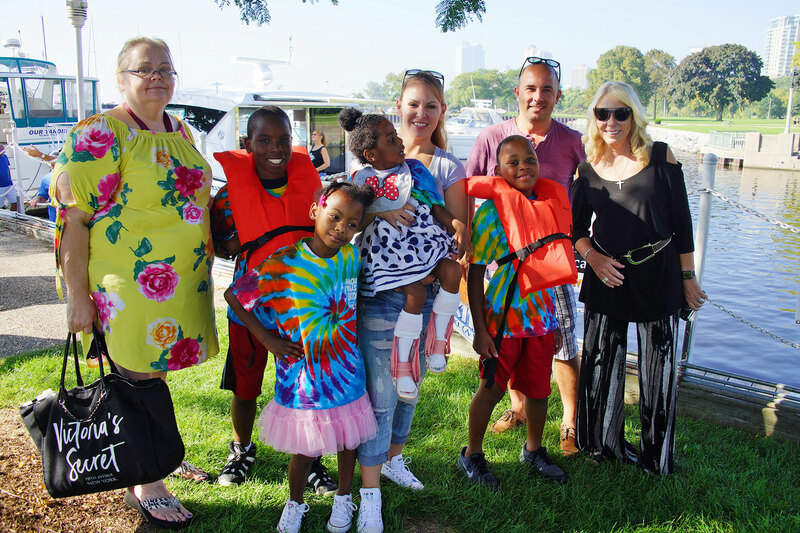 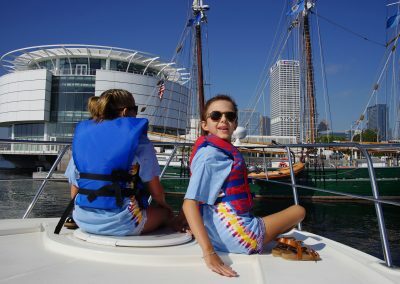 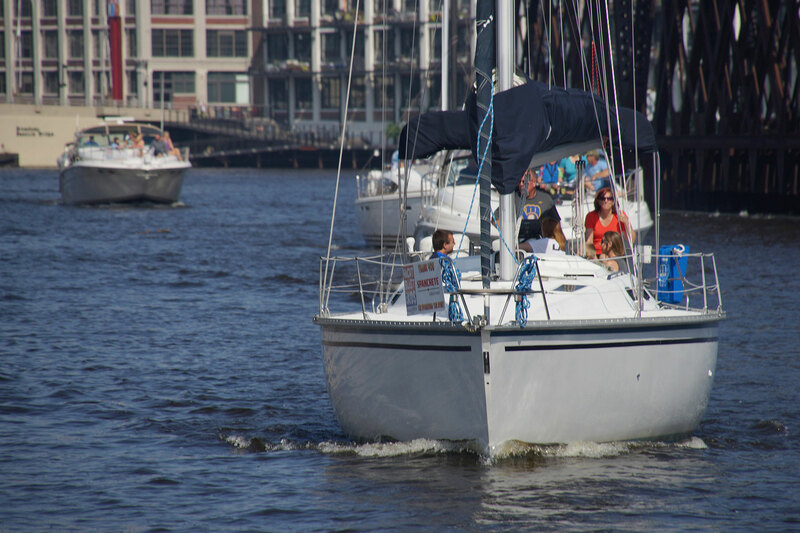 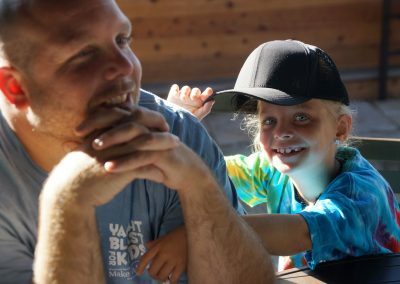 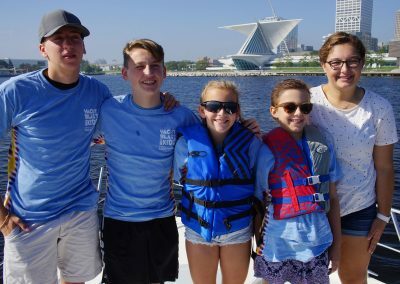 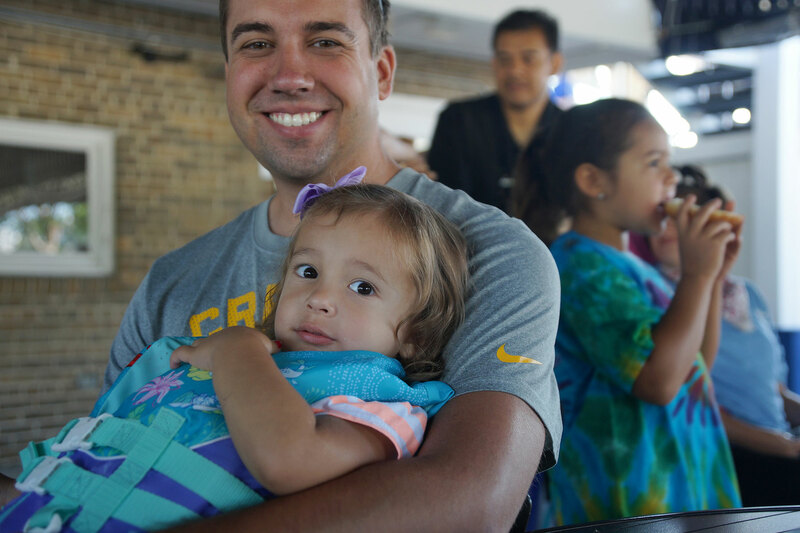 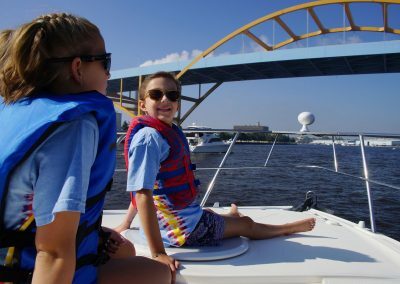 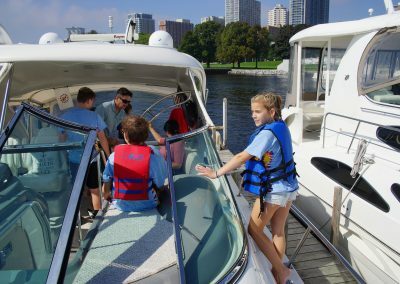 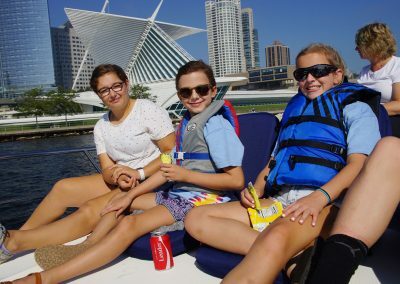 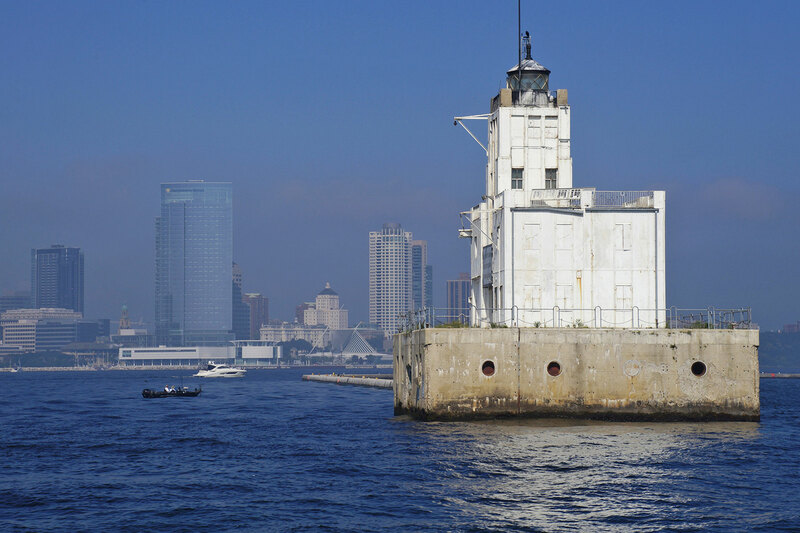 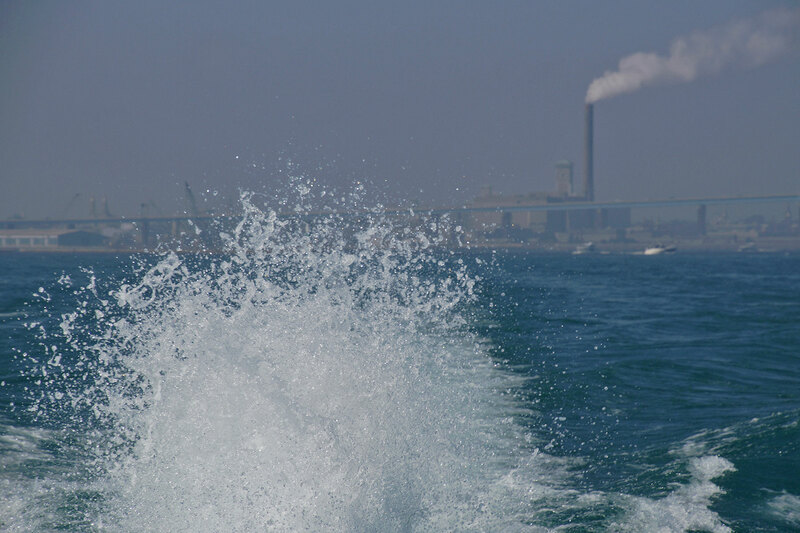 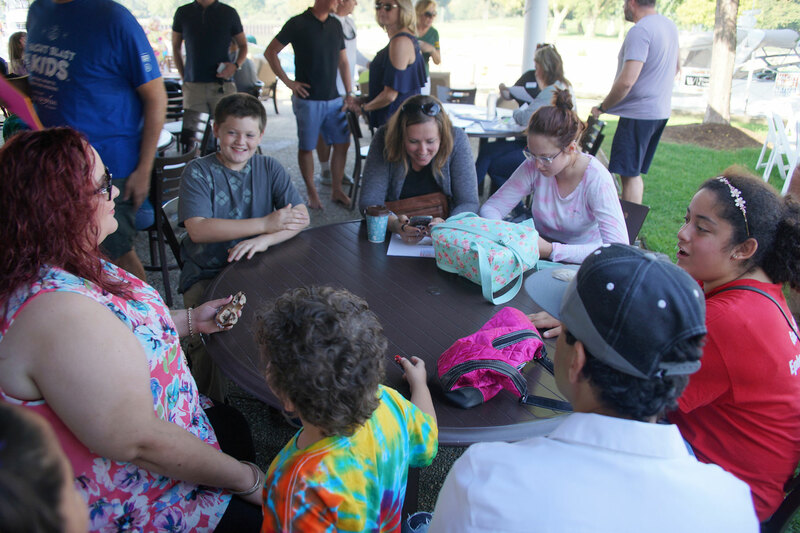 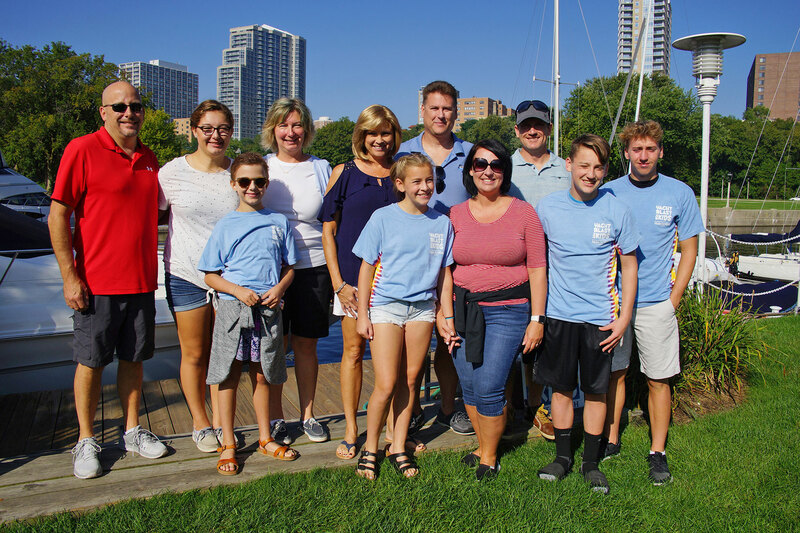 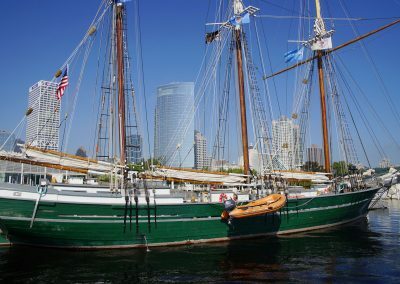 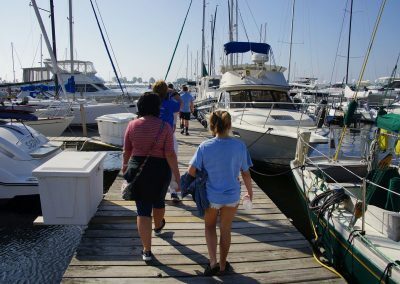 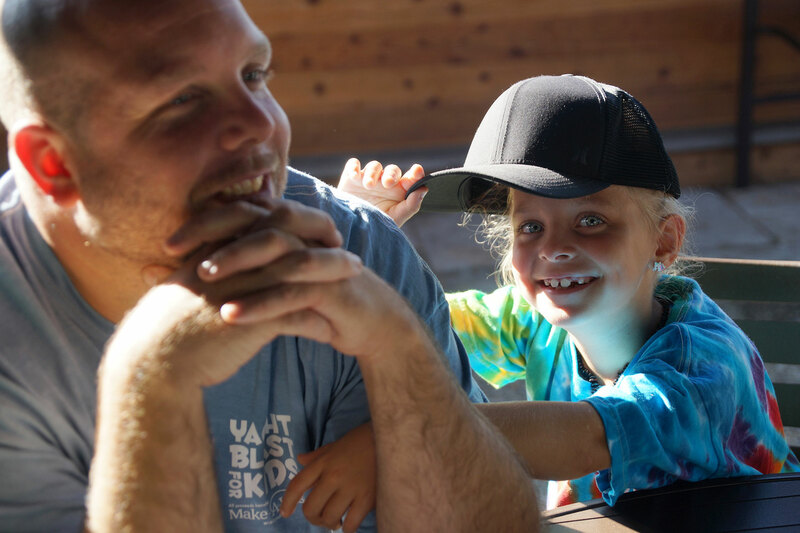 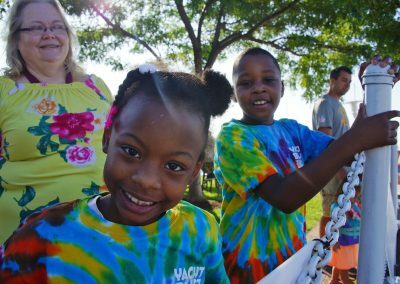 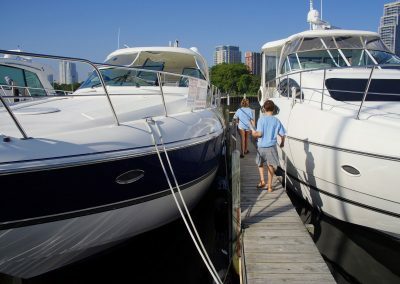 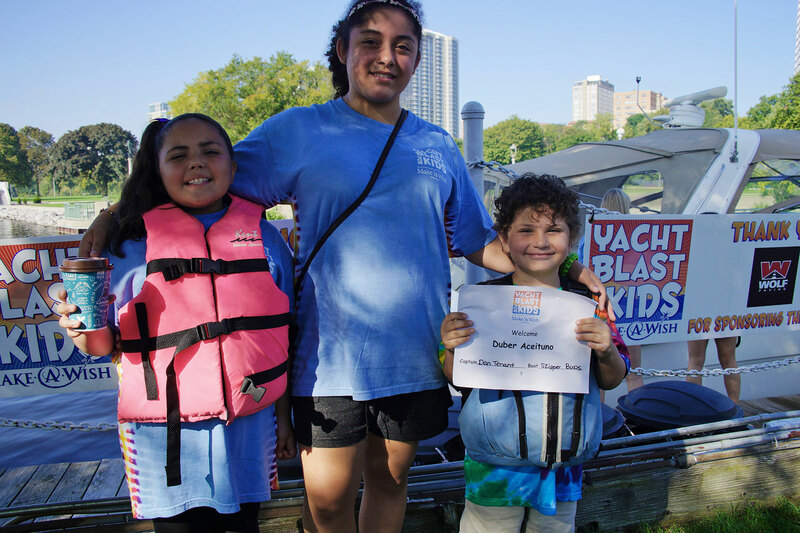 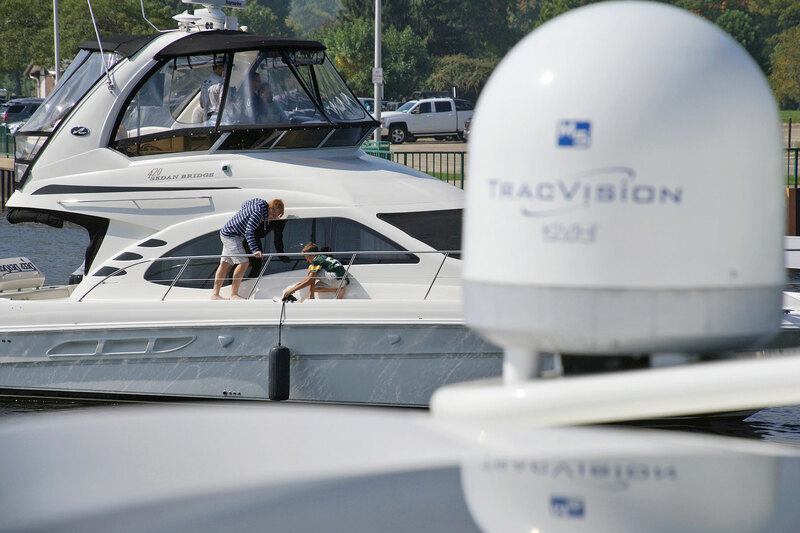 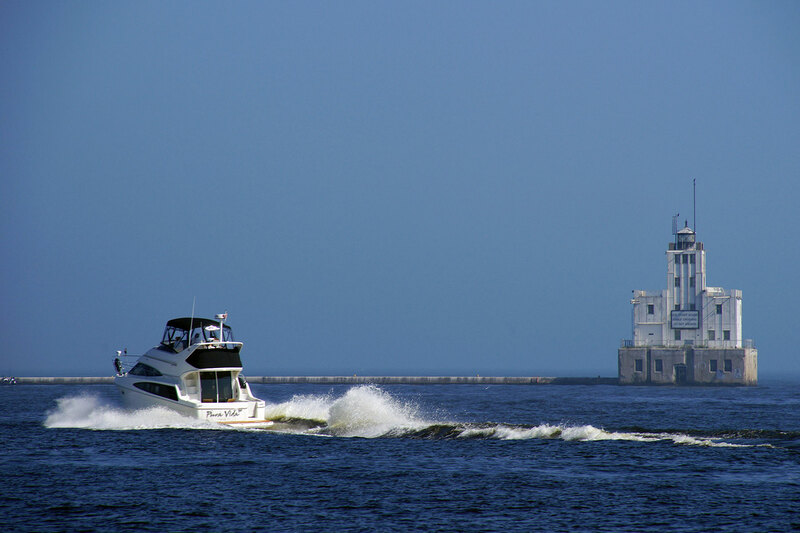 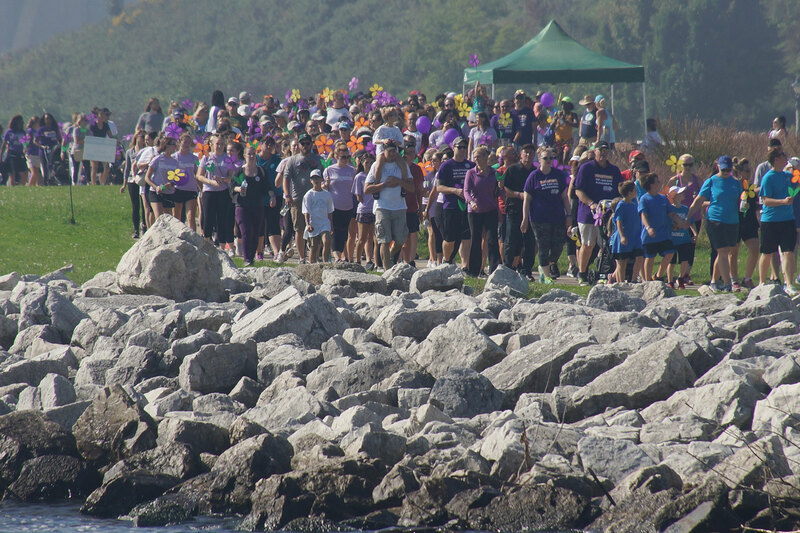 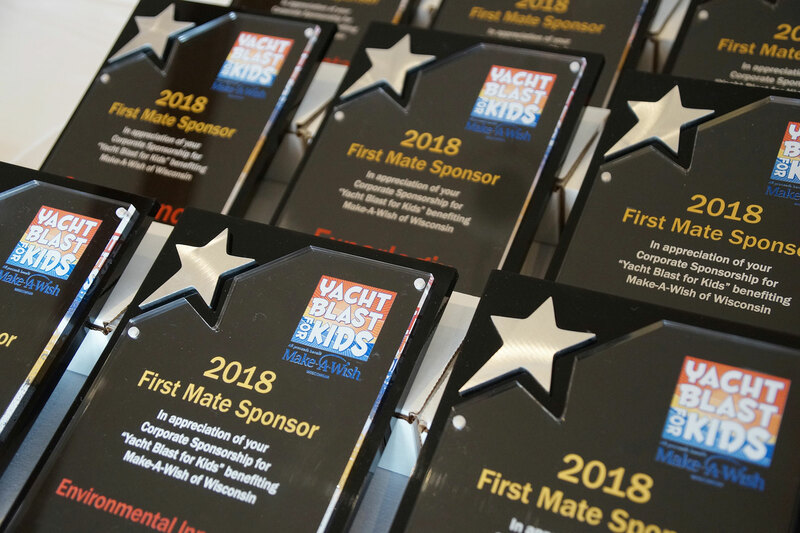 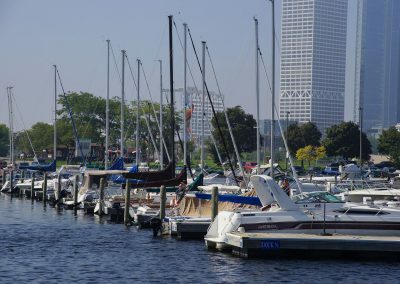 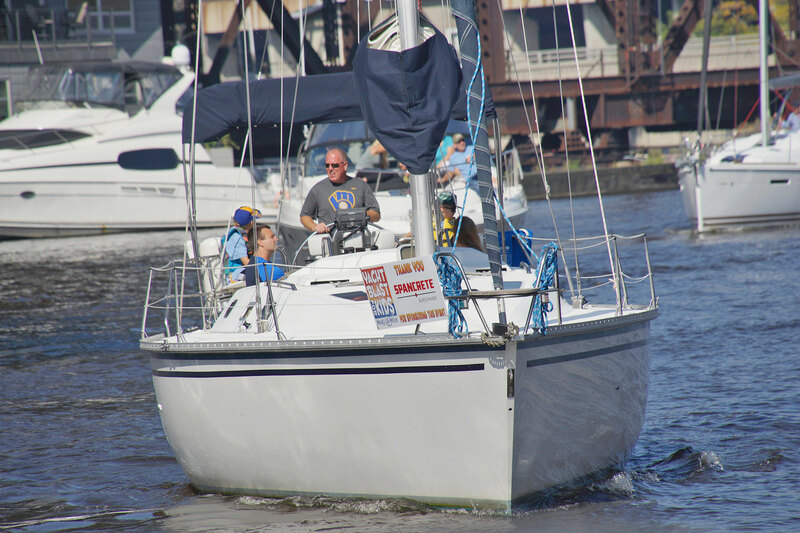 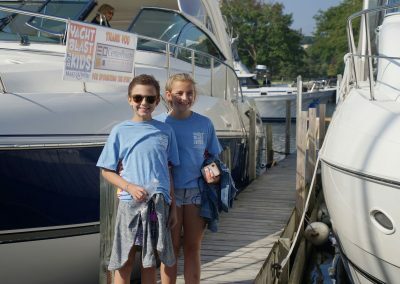 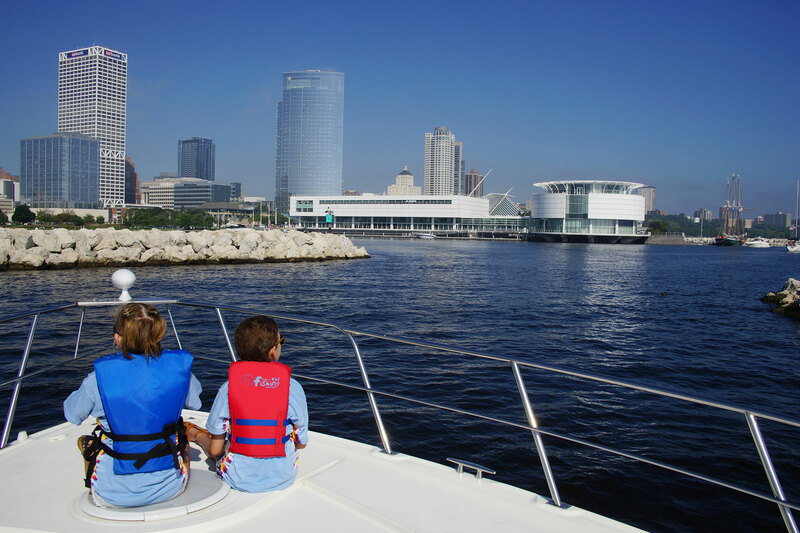 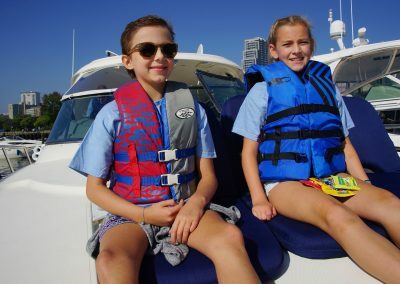 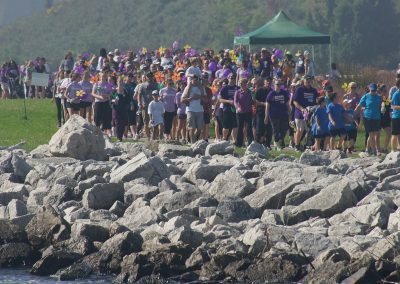 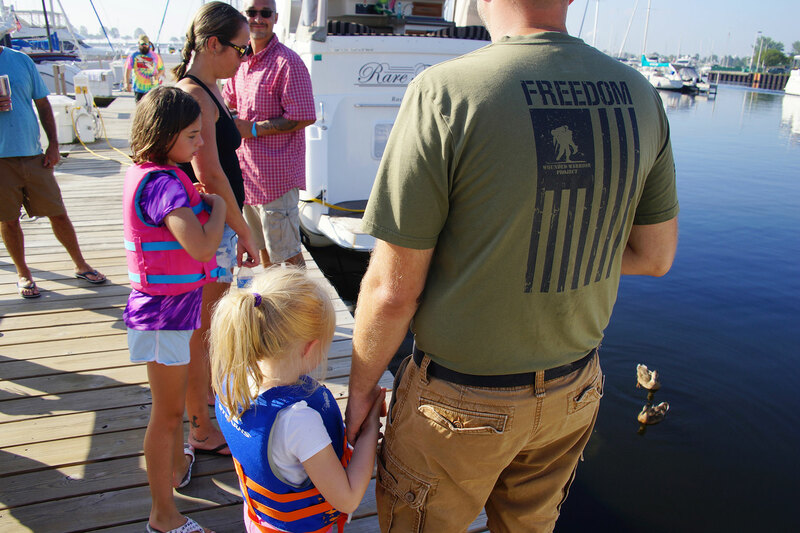 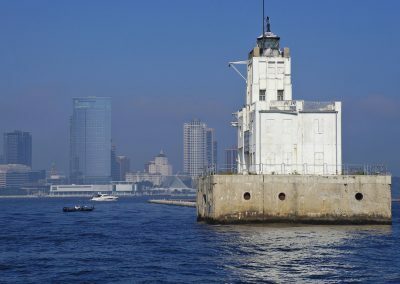 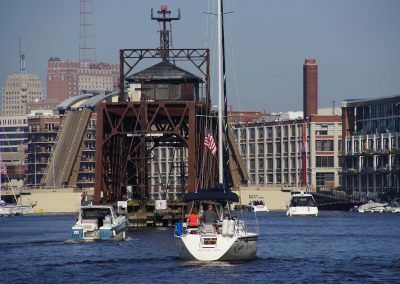 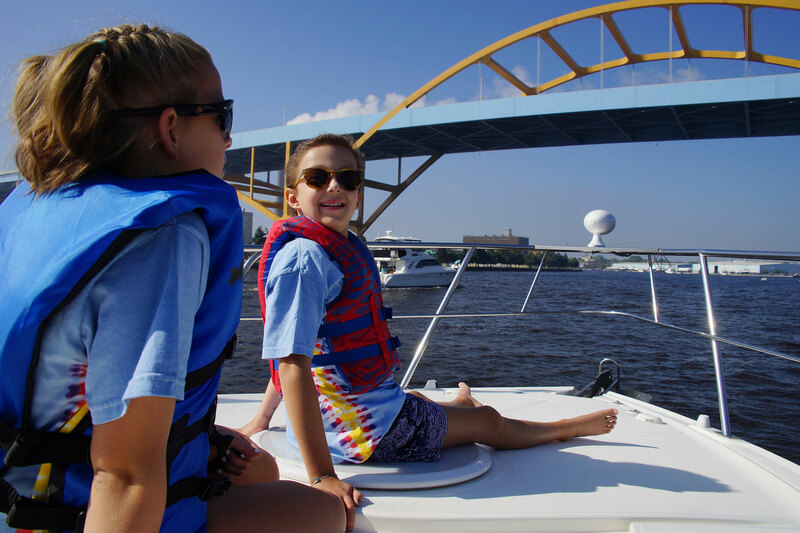 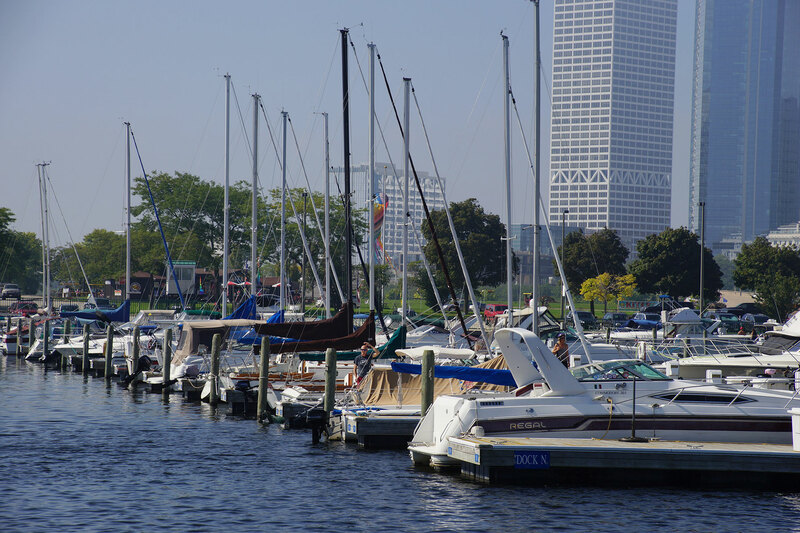 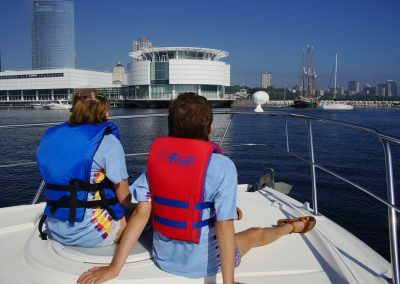 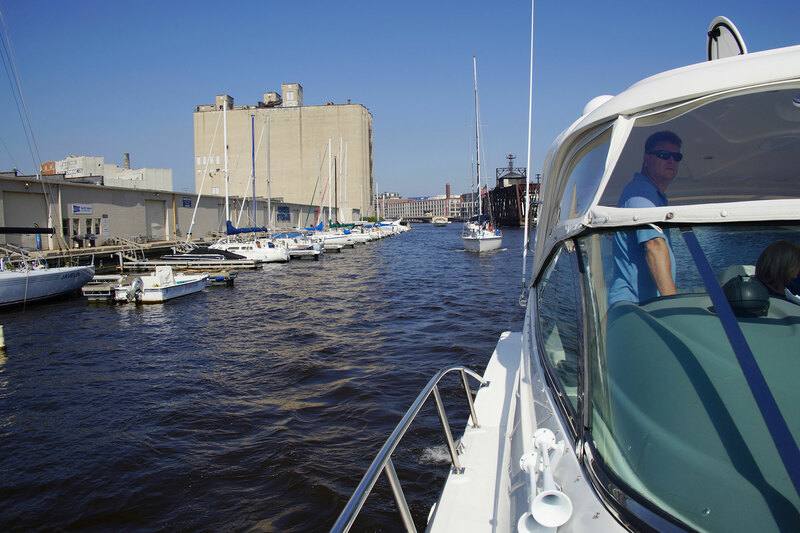 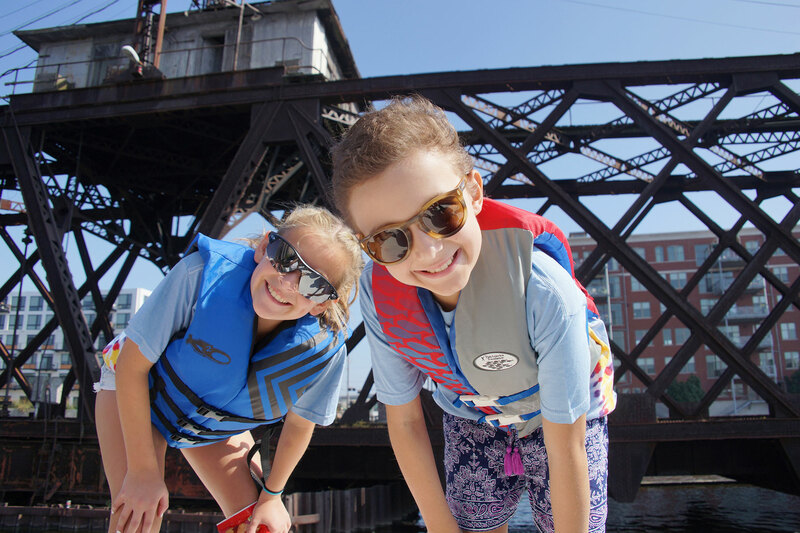 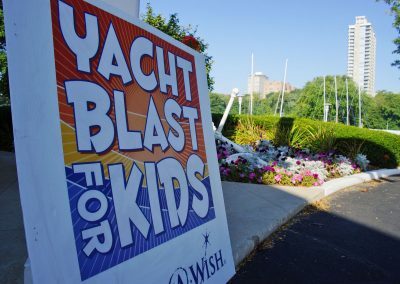 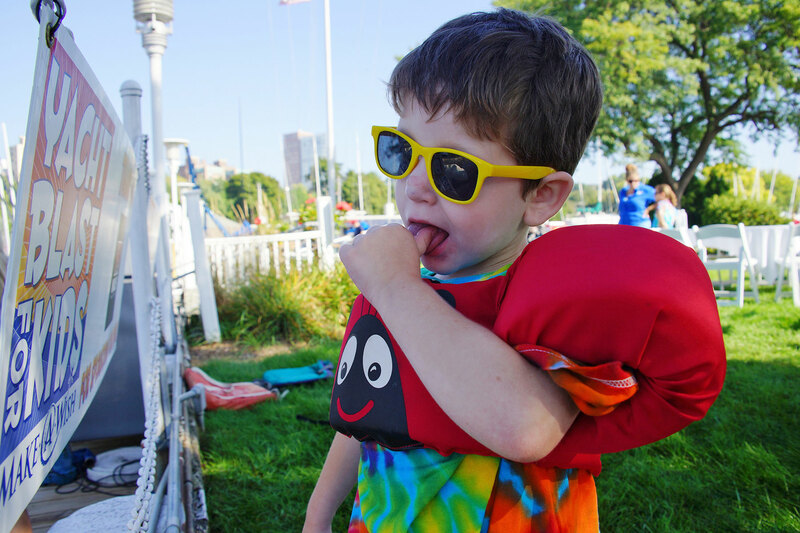 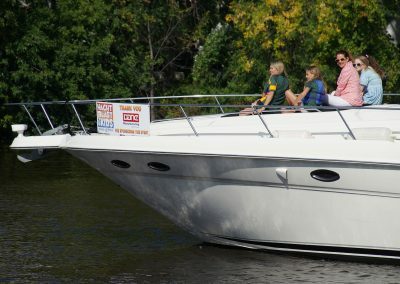 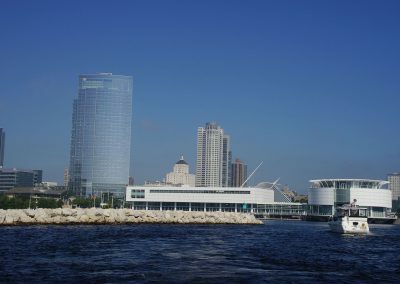 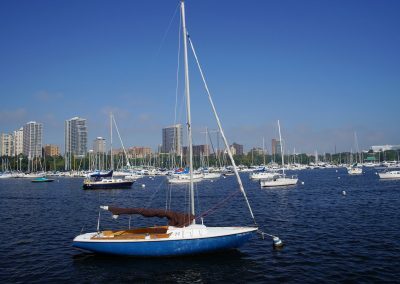 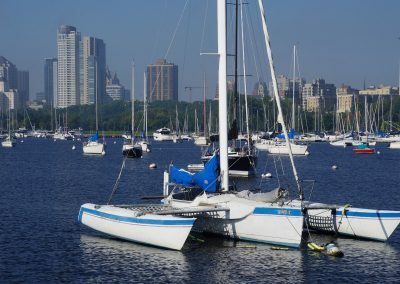 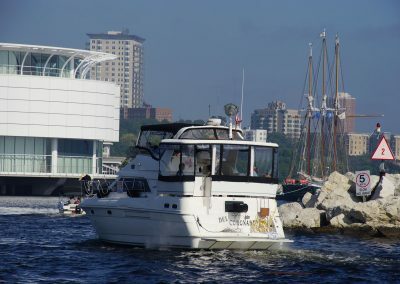 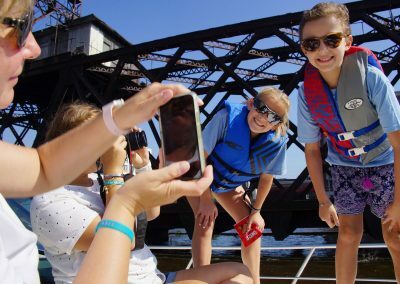 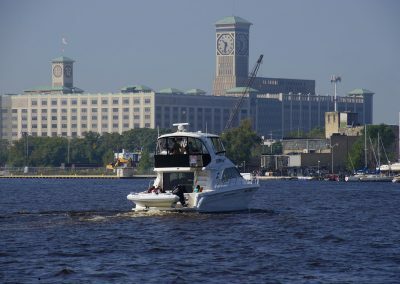 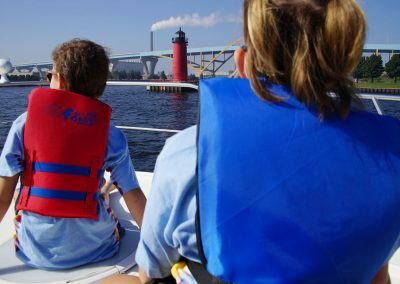 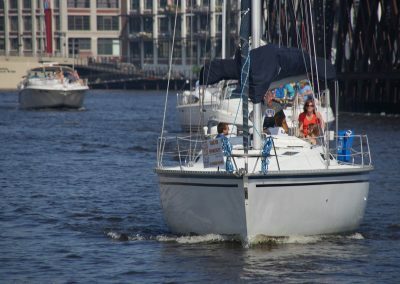 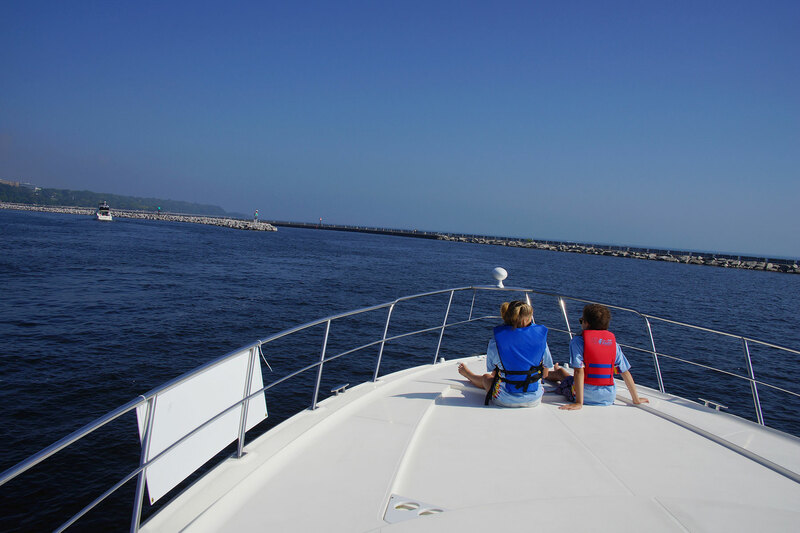 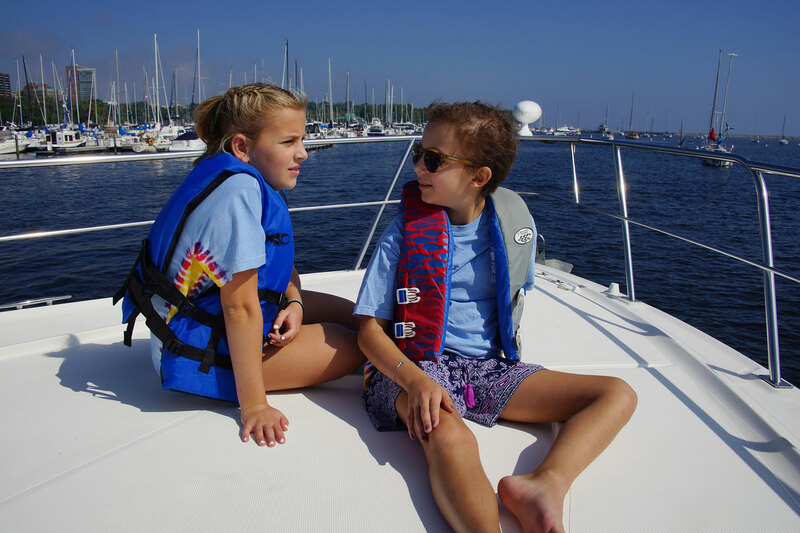 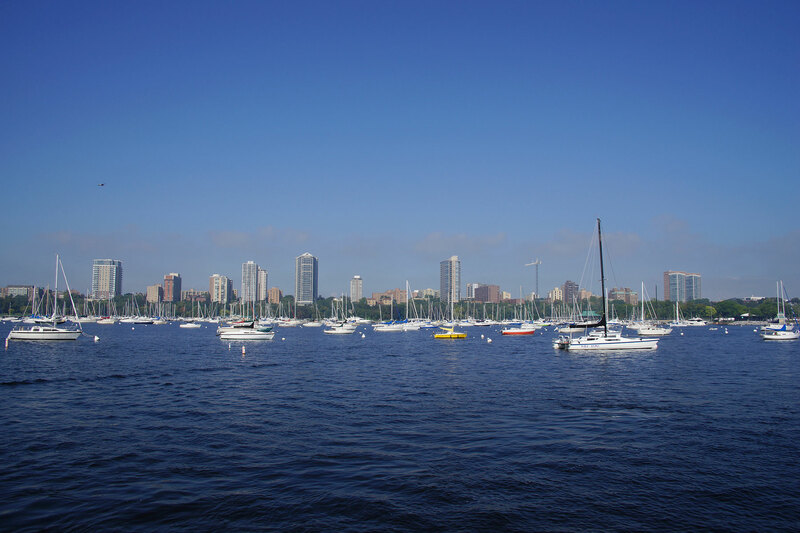 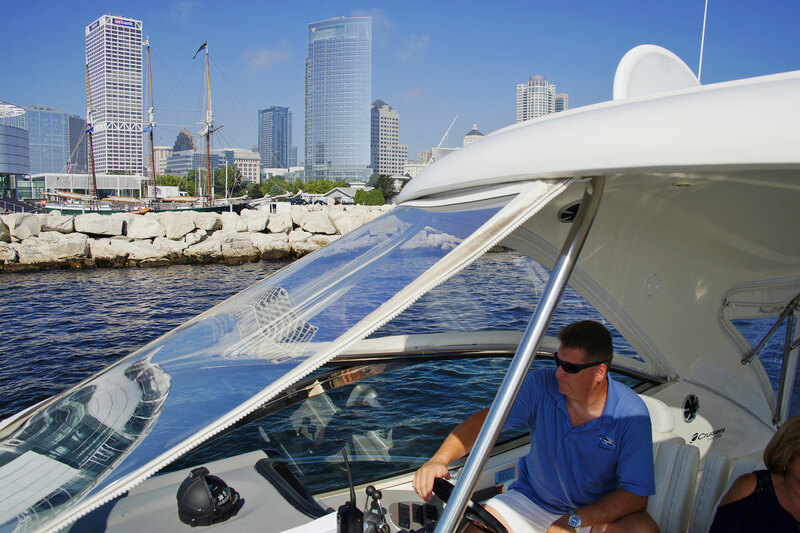 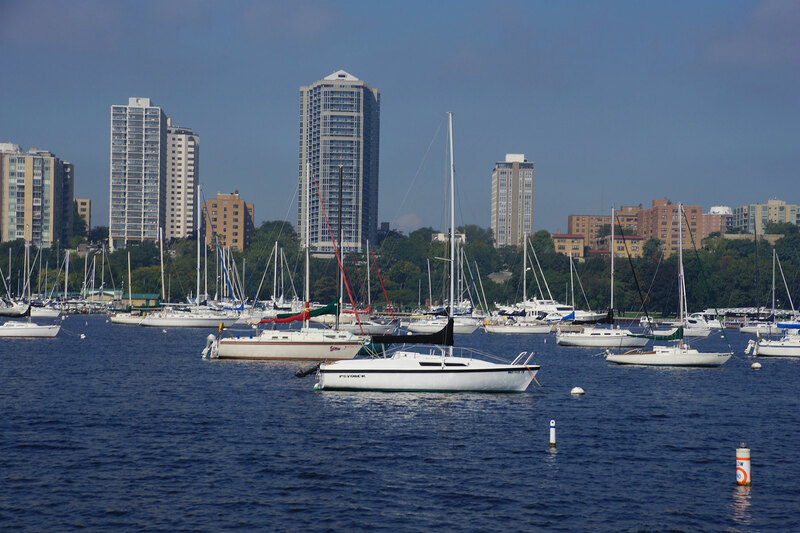 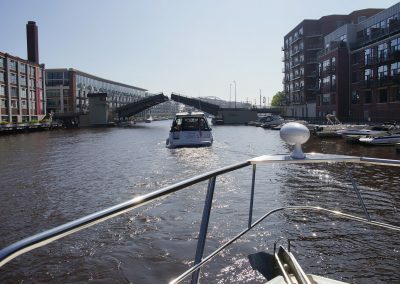 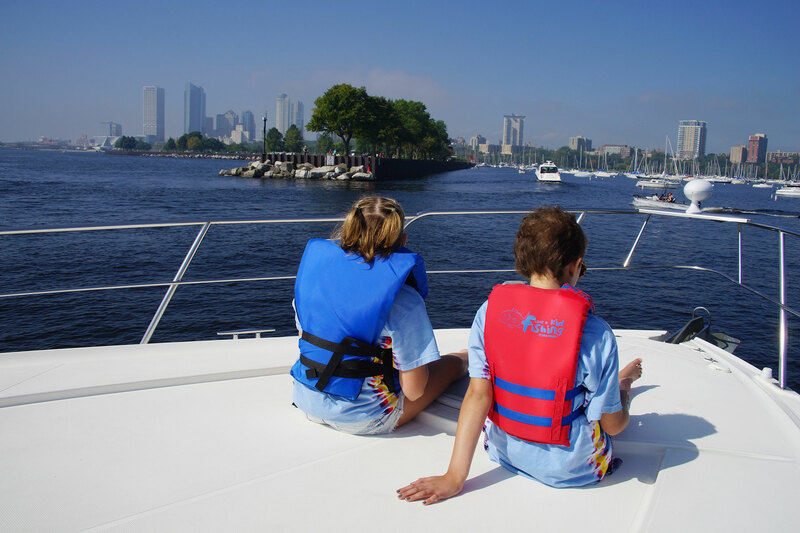 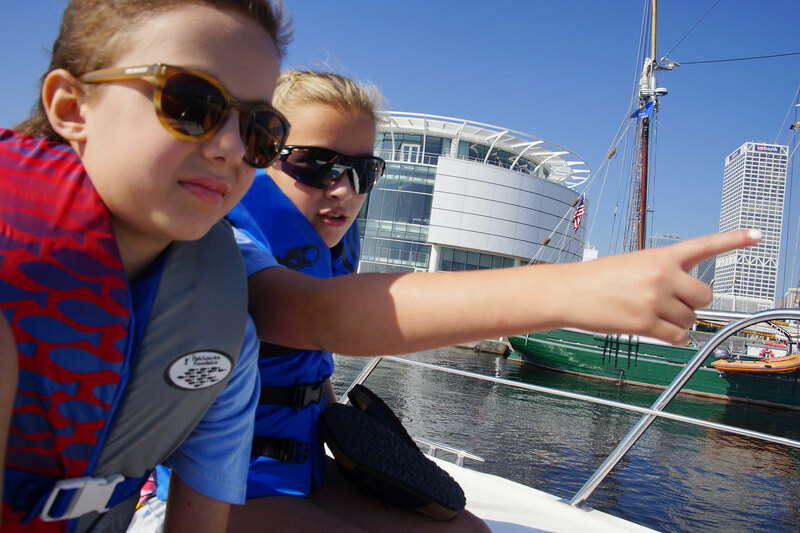 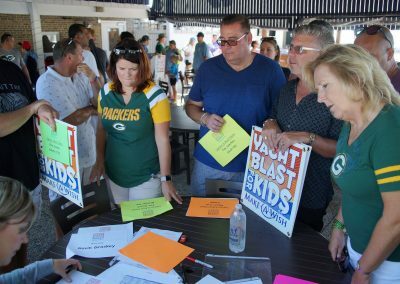 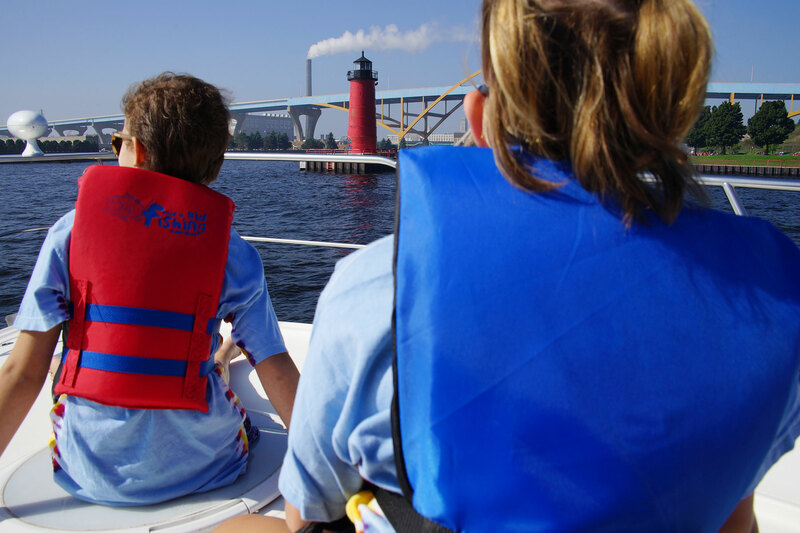 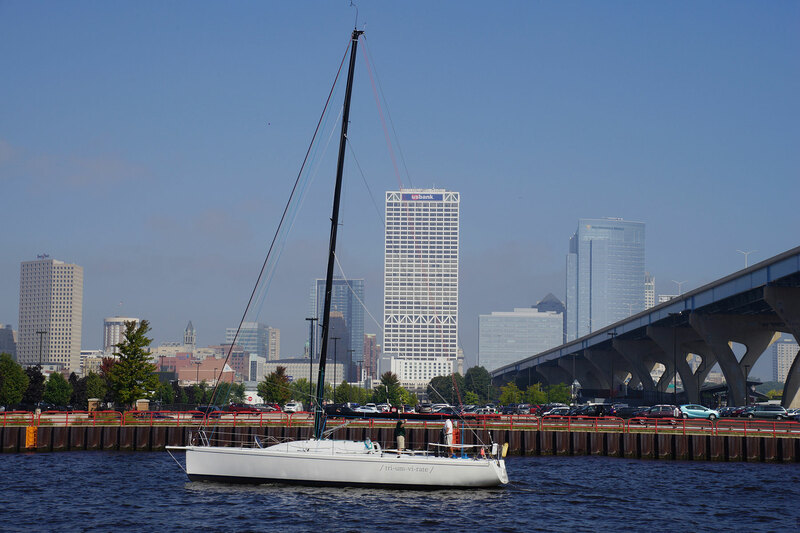 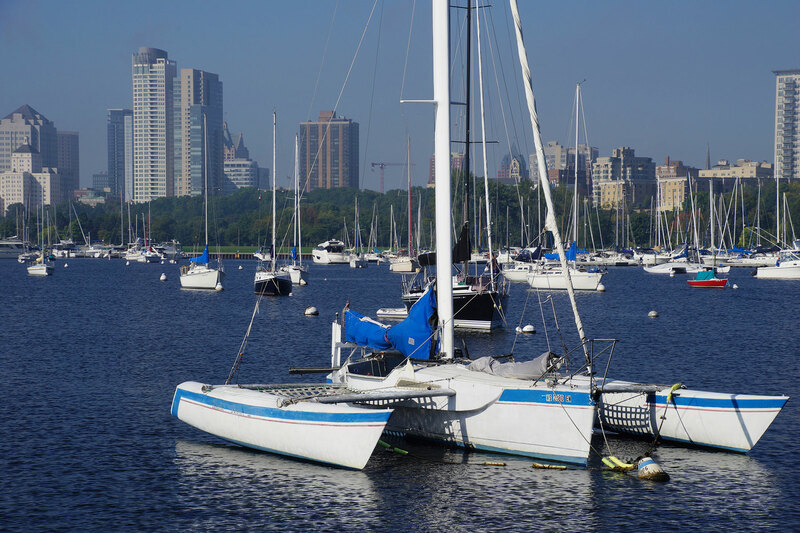 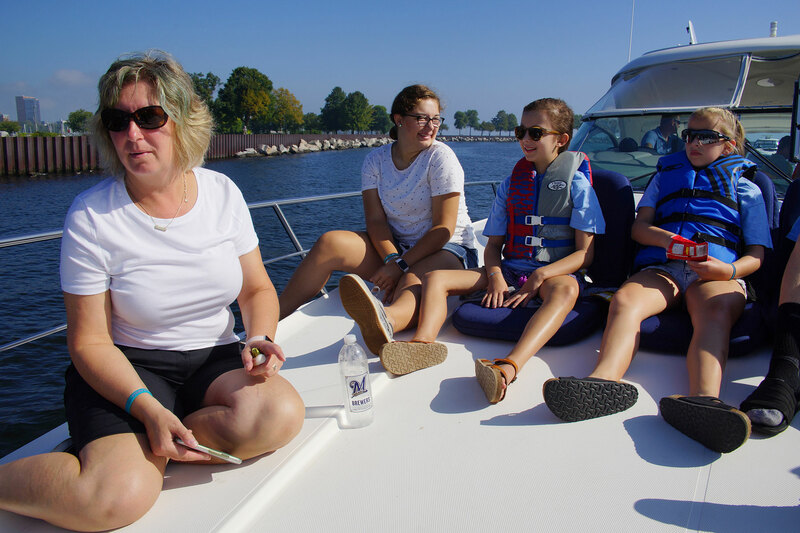 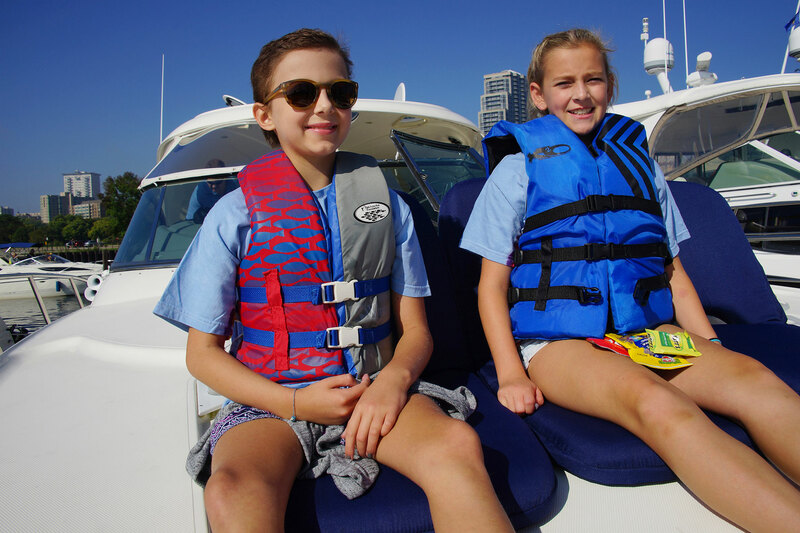 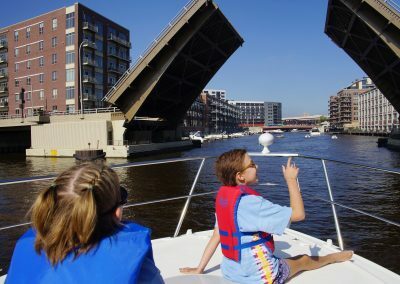 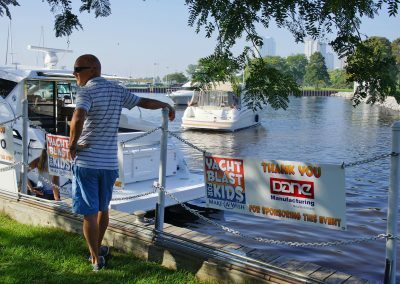 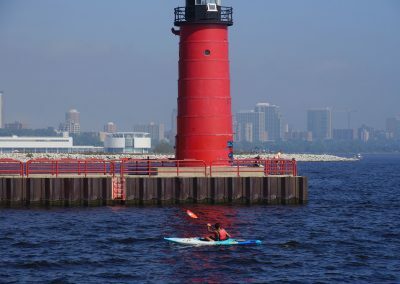 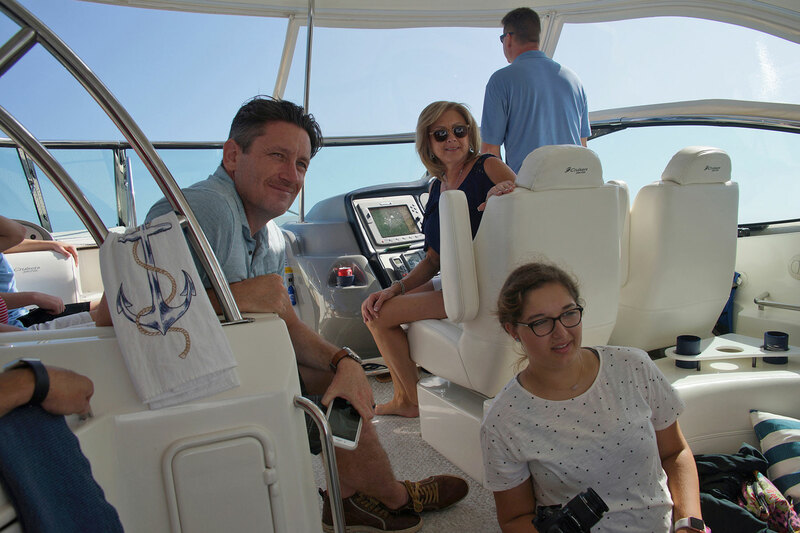 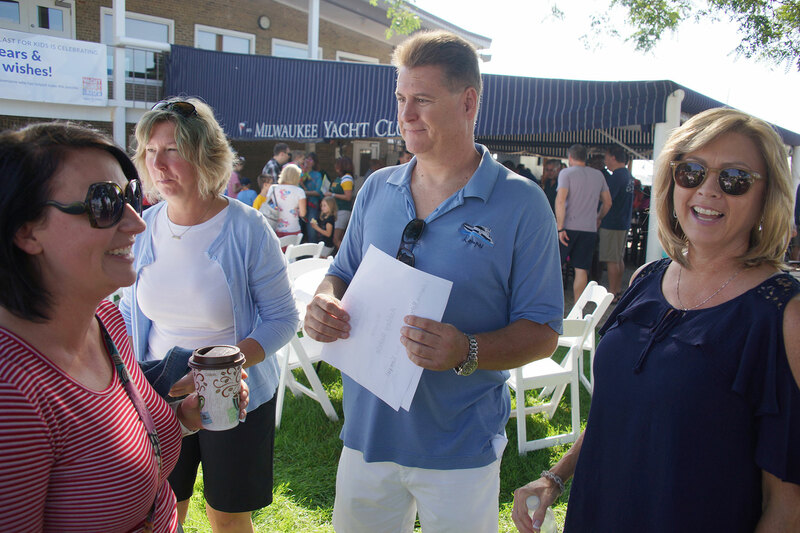 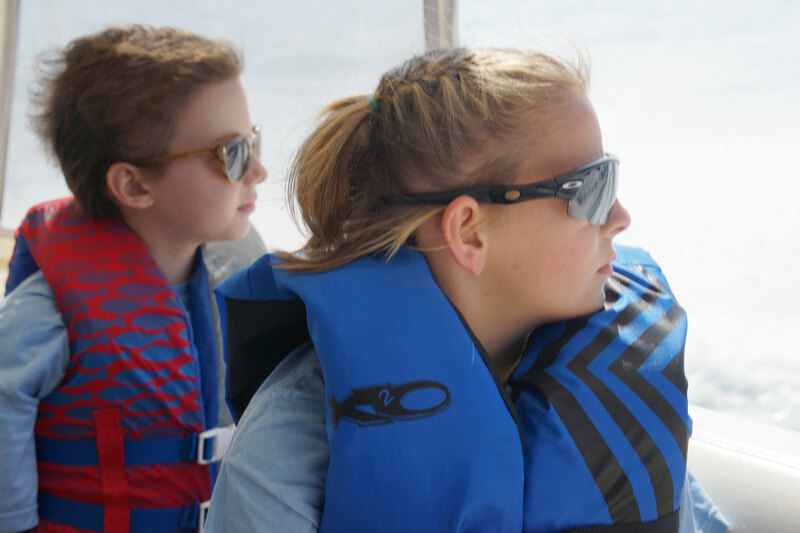 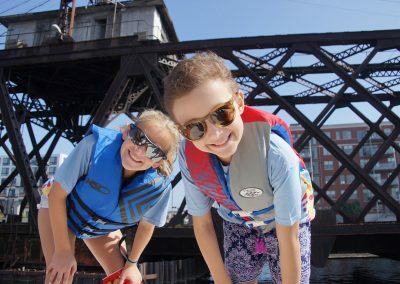 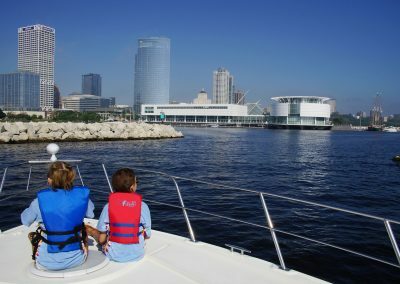 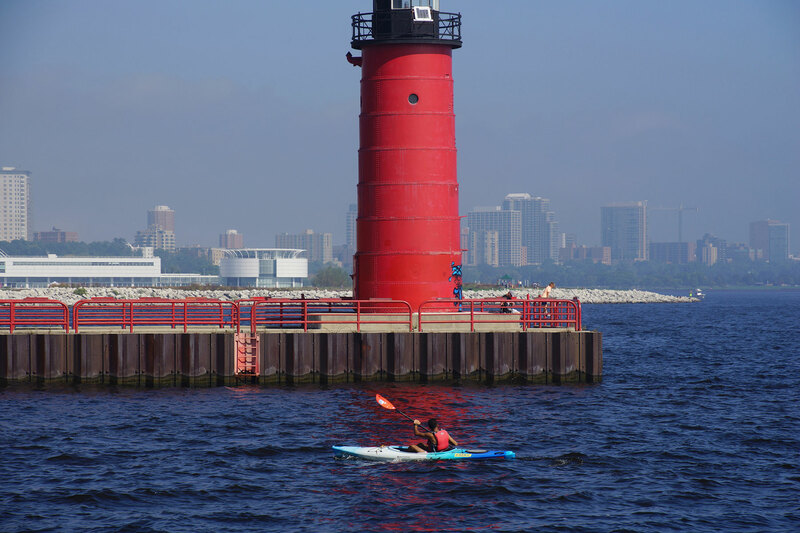 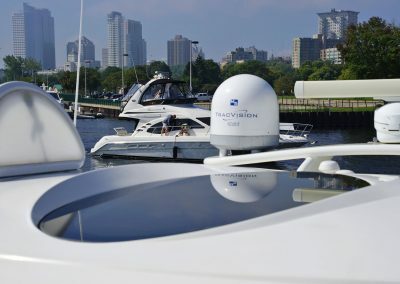 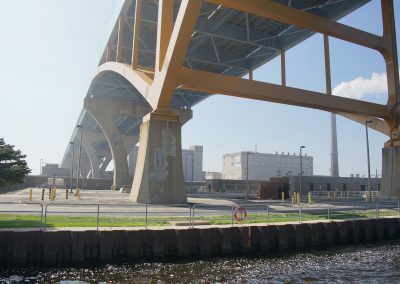 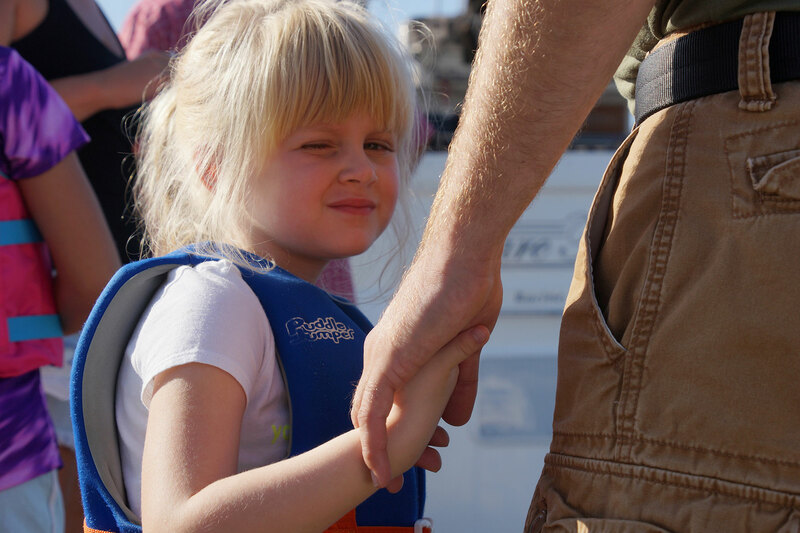 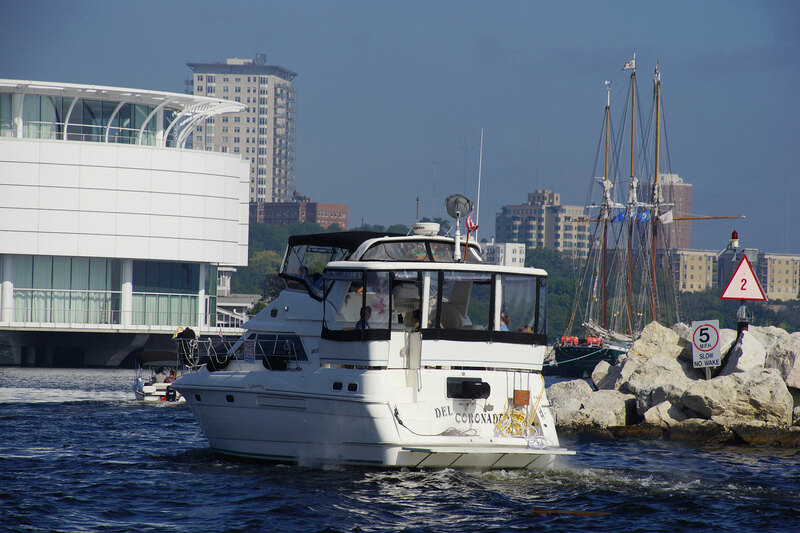 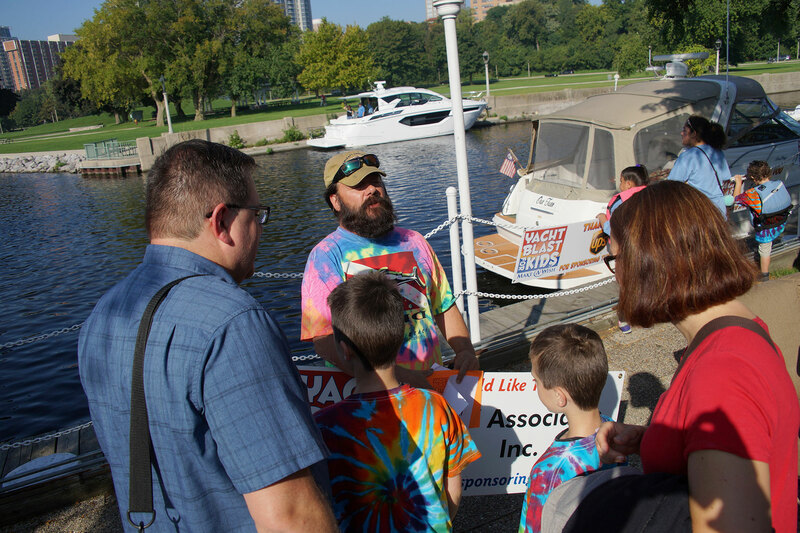 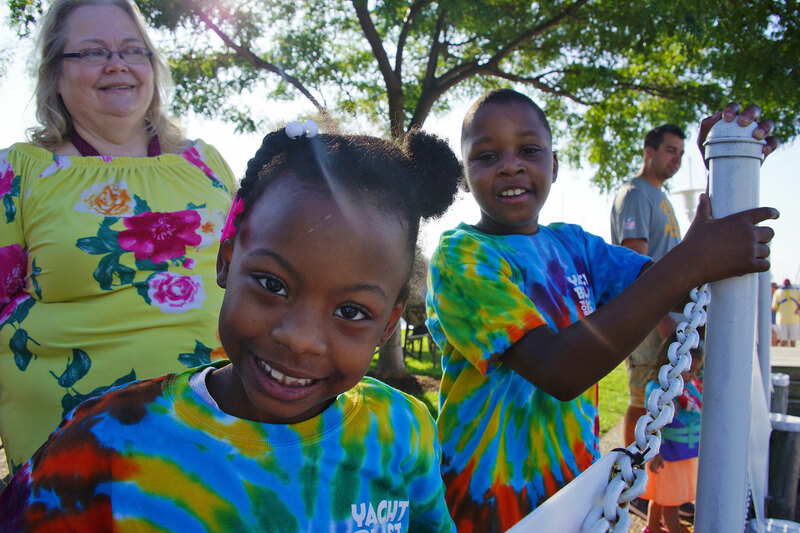 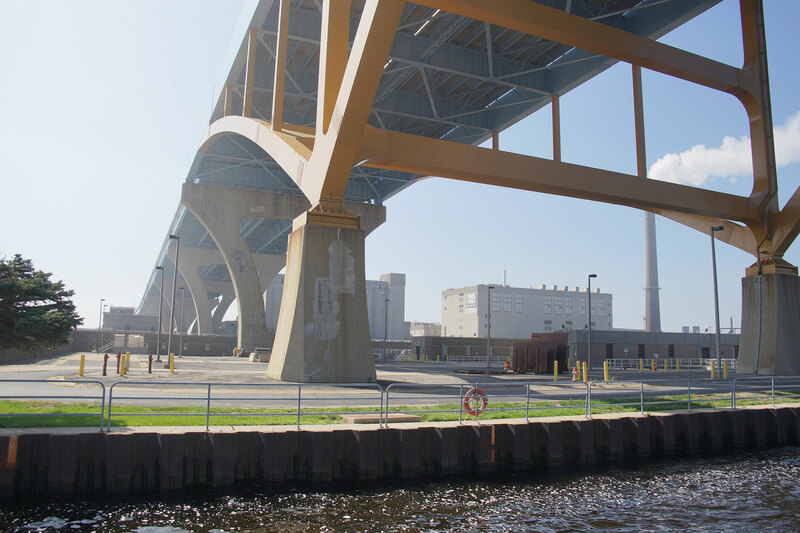 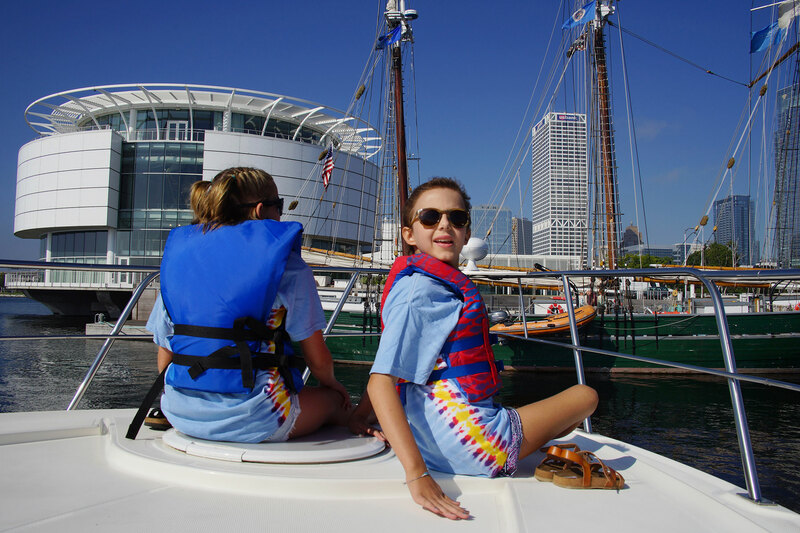 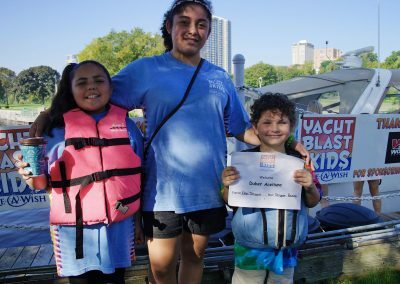 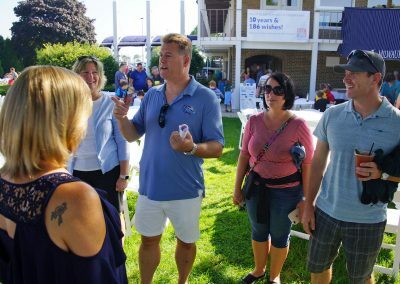 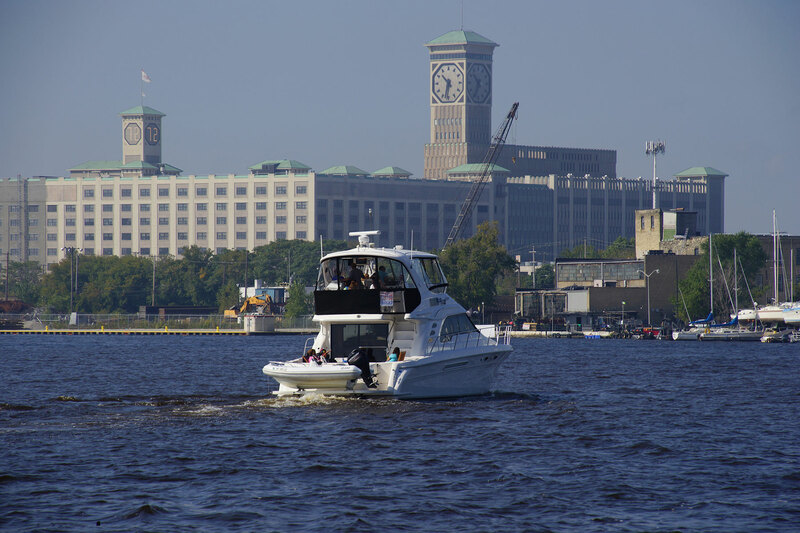 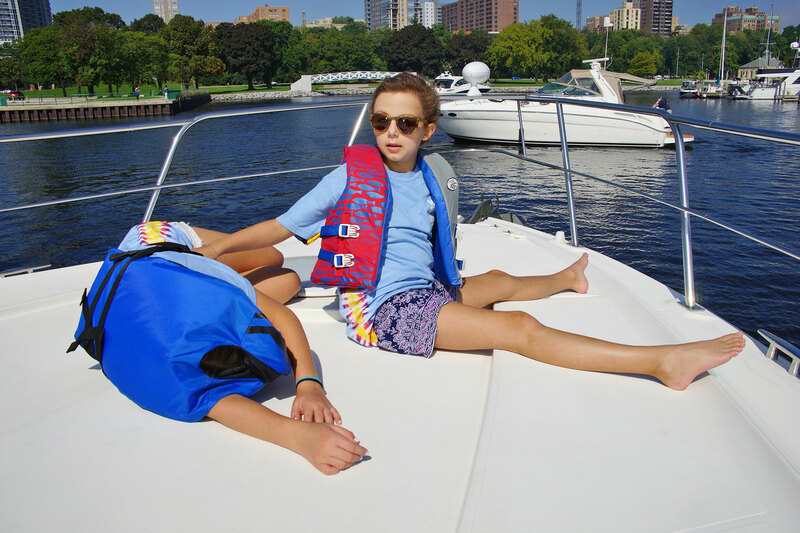 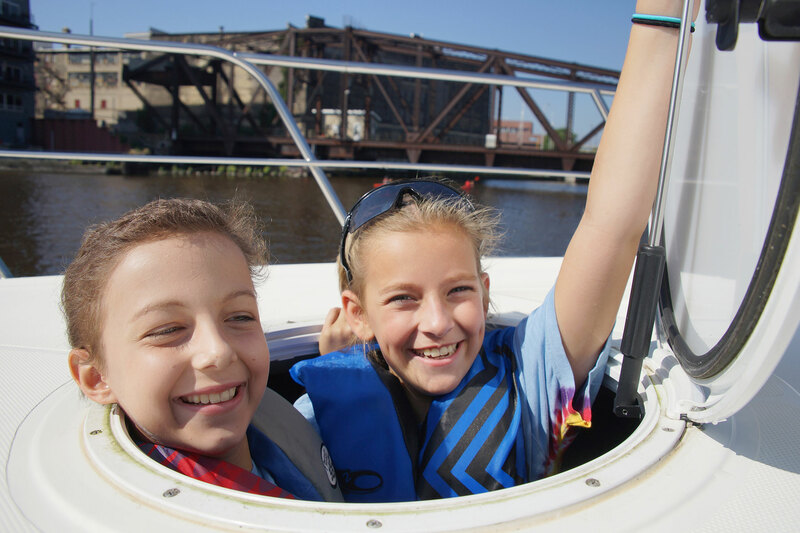 The 10th annual Yacht Blast for Kids was held on September 16 at the Milwaukee Yacht Club, giving Make-A-Wish children and their families the opportunity to spend a fun-filled morning riding on Lake Michigan and the Milwaukee River. 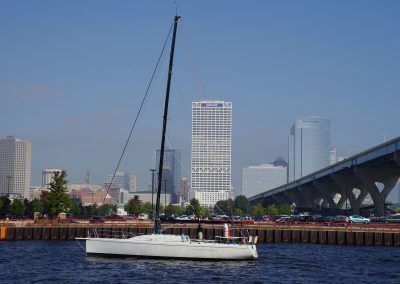 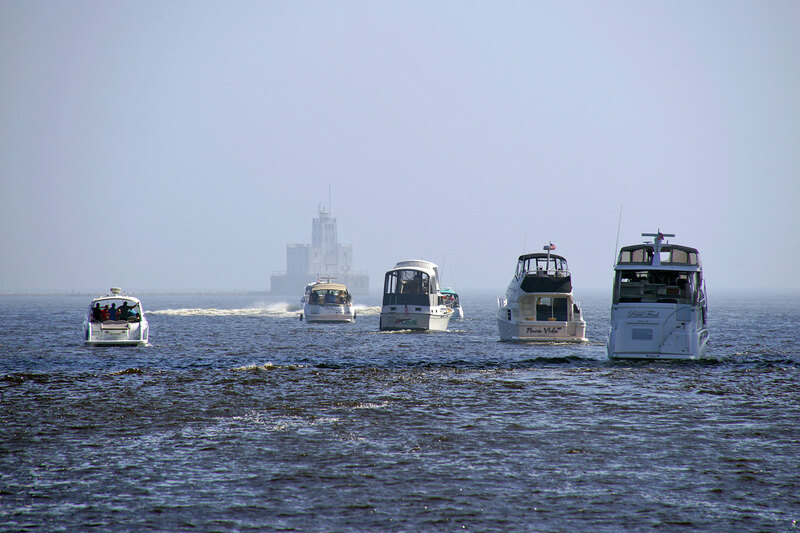 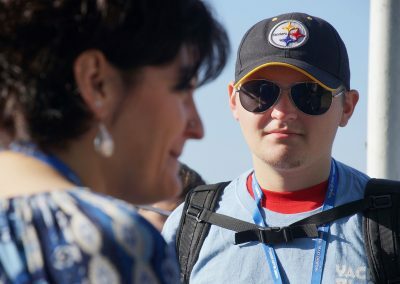 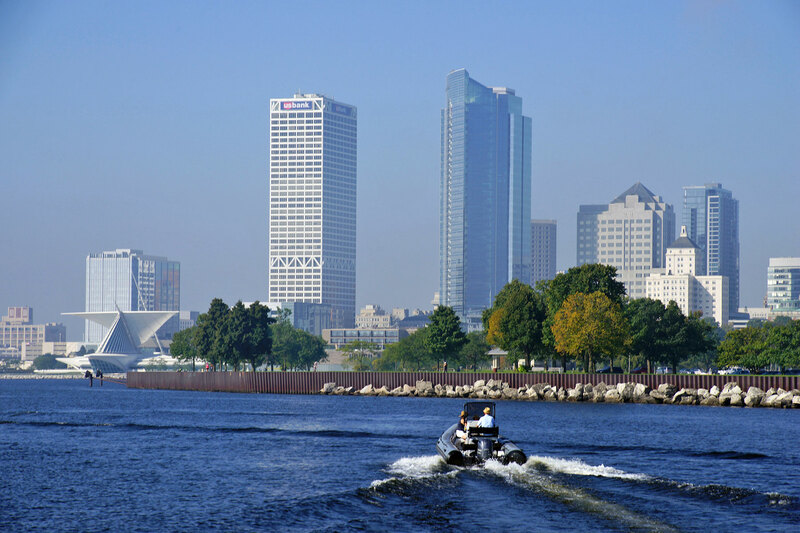 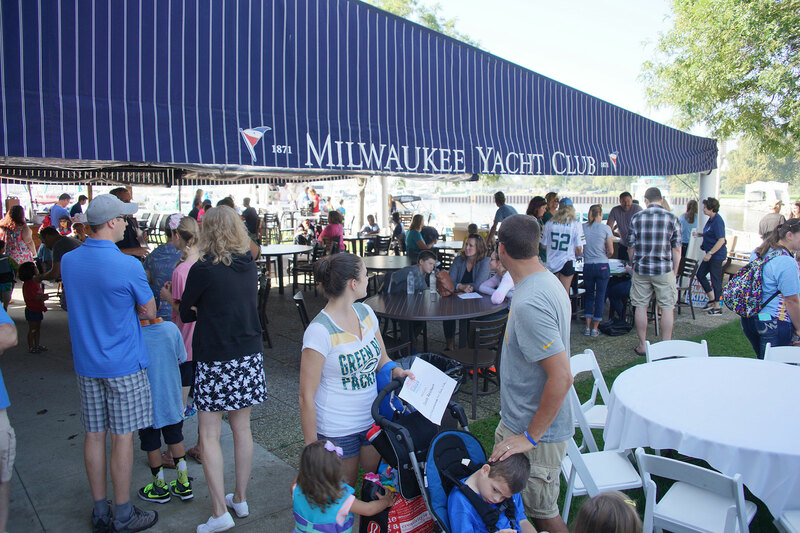 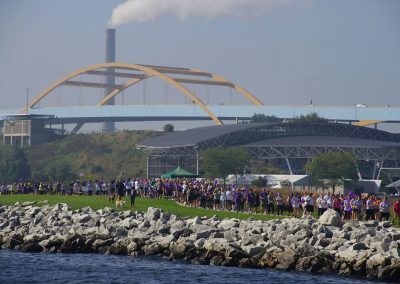 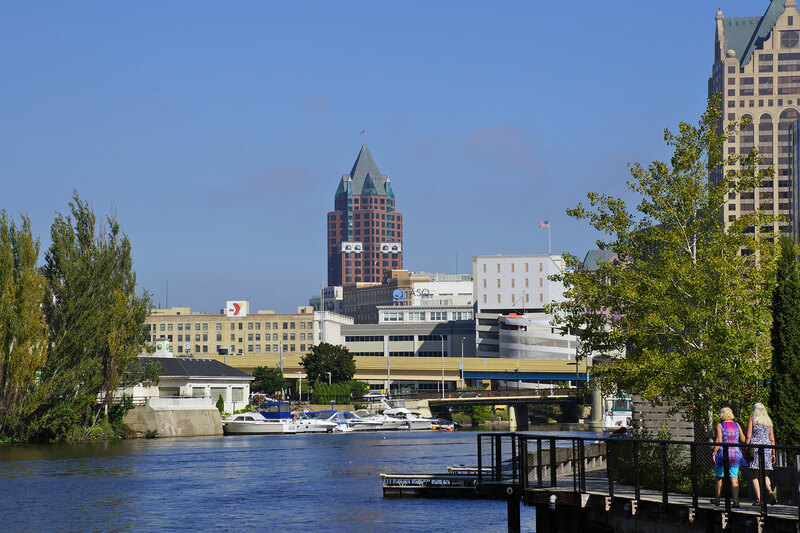 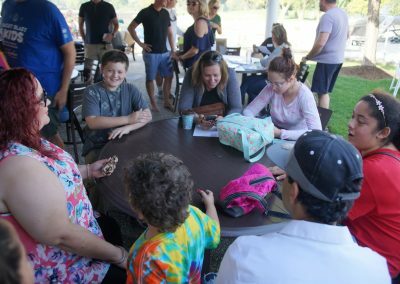 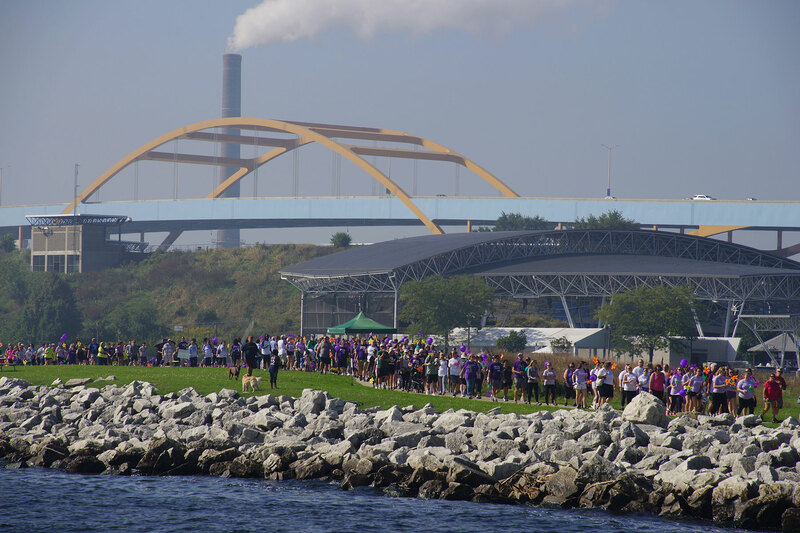 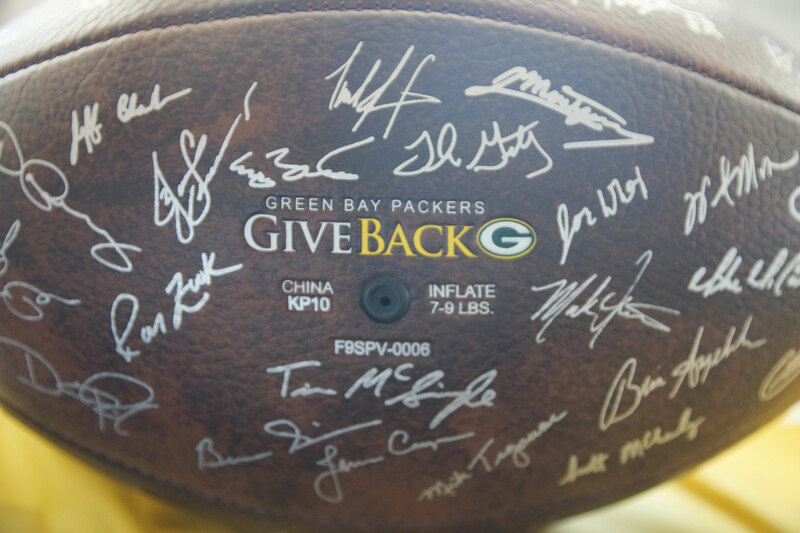 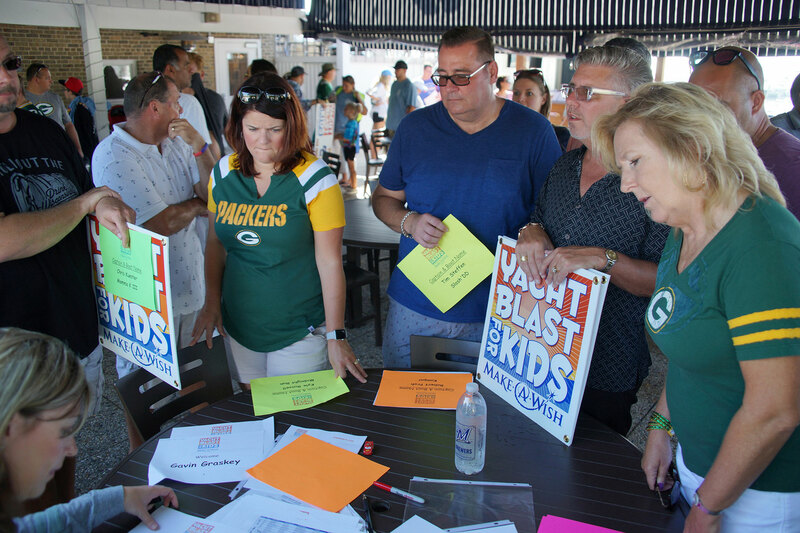 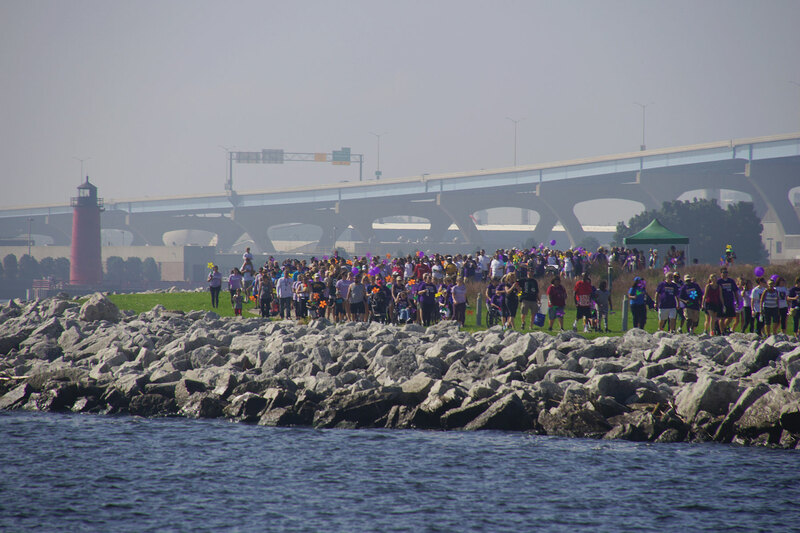 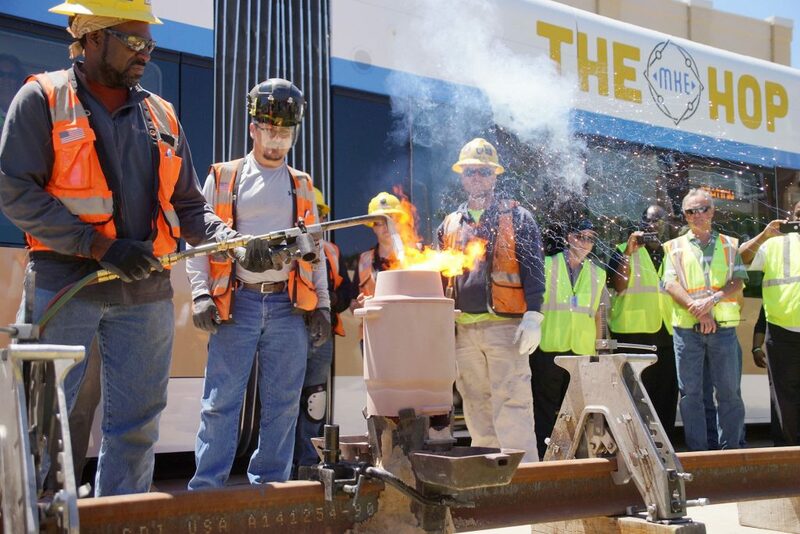 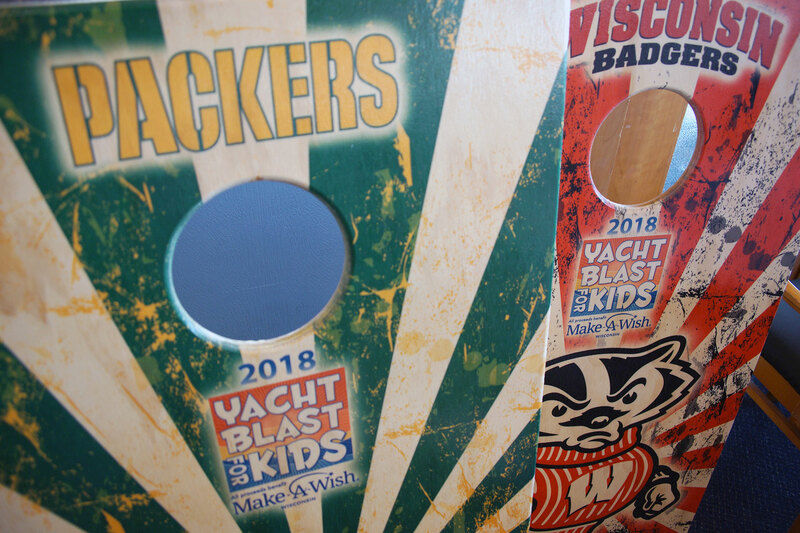 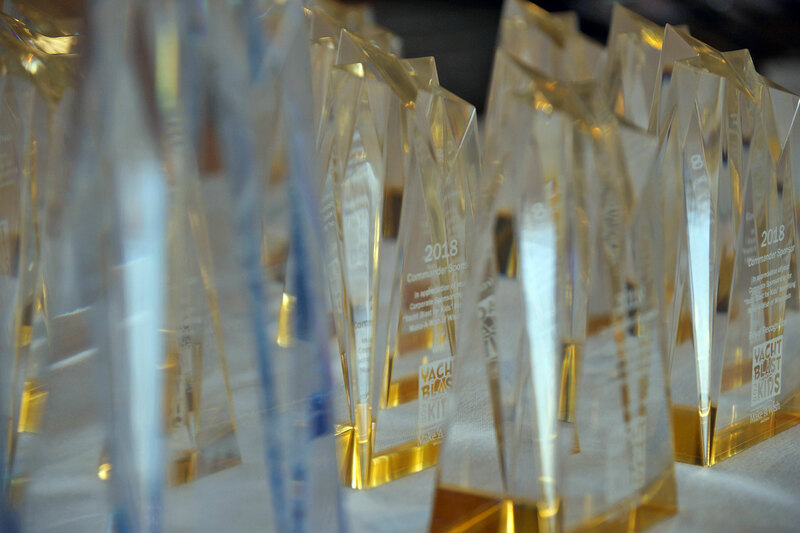 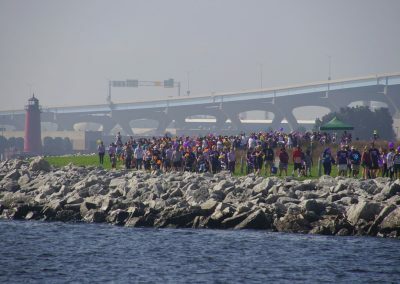 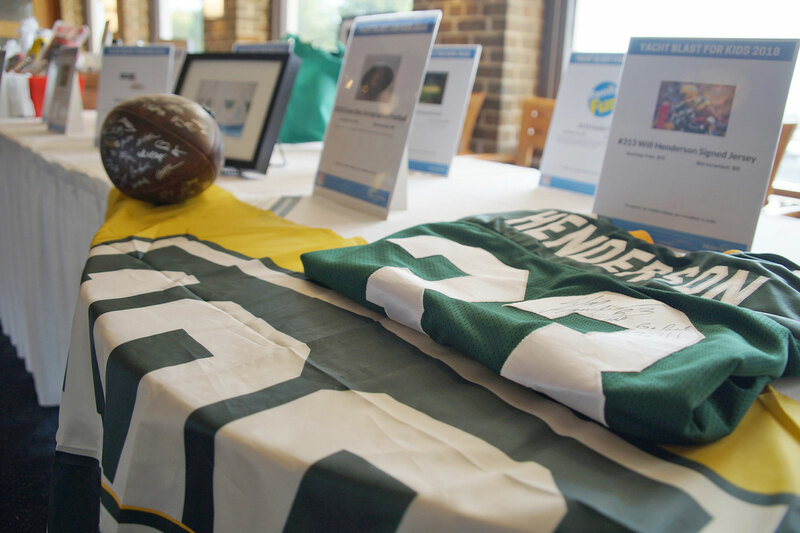 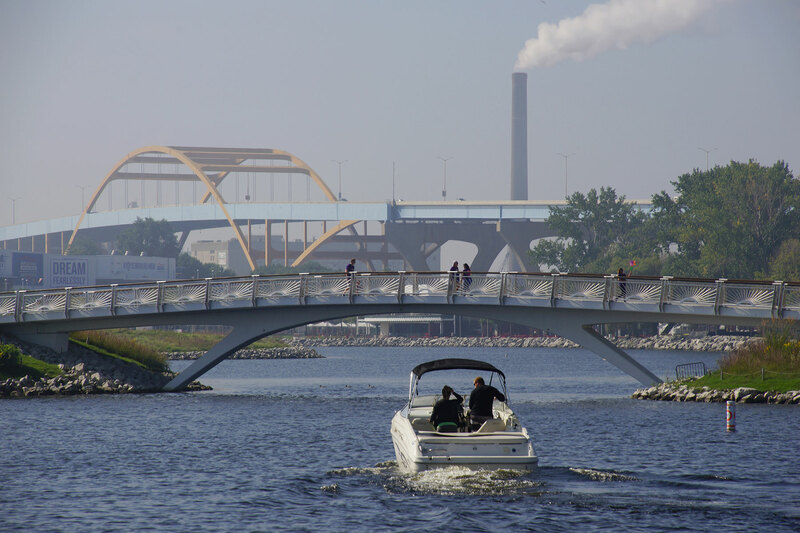 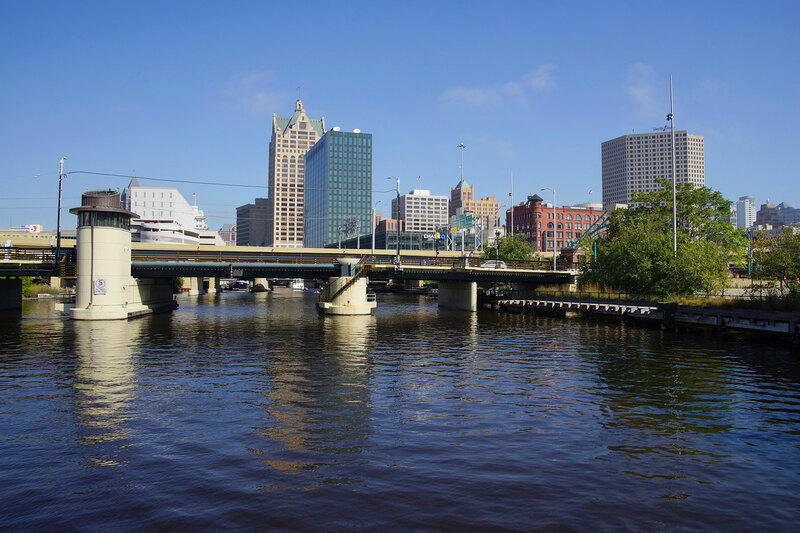 In addition to the boat excursions for the wish kids, the day also featured live music, food, a Packers game, and a silent auction with proceeds supporting Make-A-Wish’s grant wishing efforts. 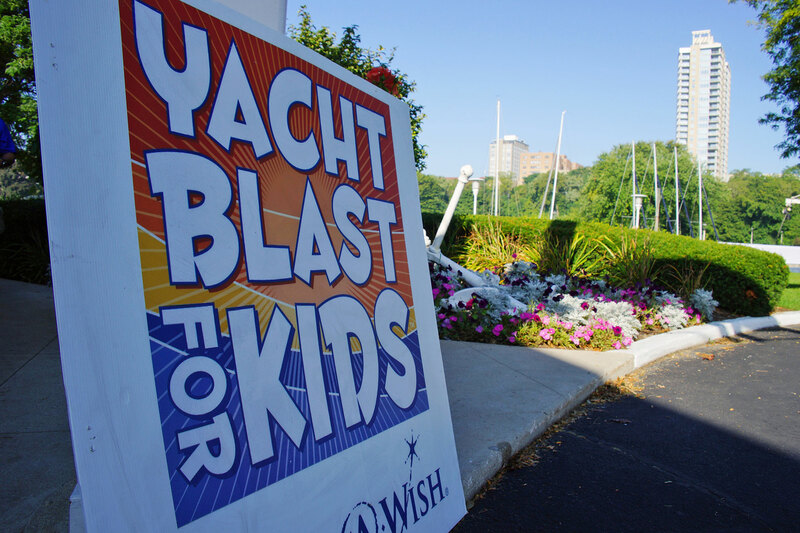 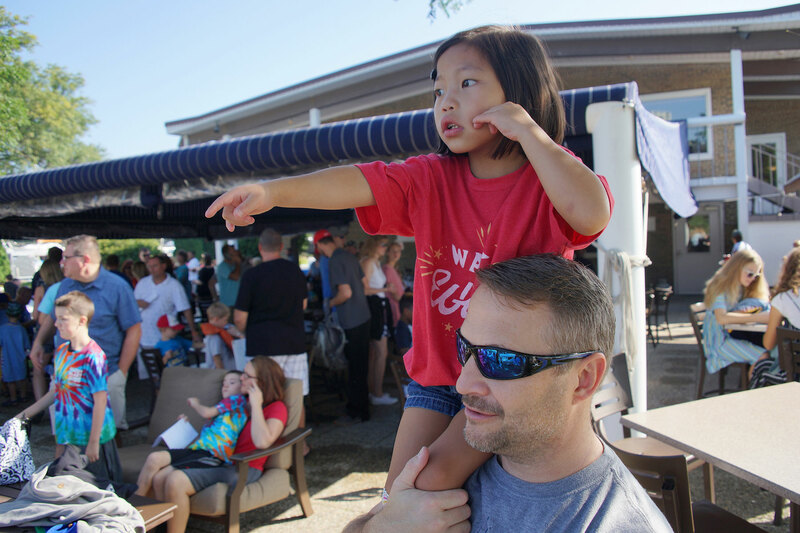 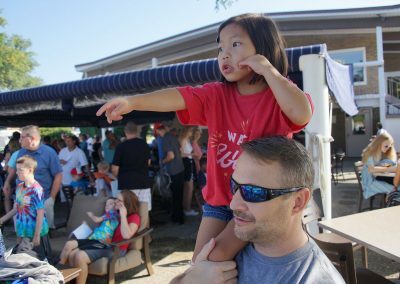 “Make-A-Wish is an incredible organization, and we are proud to be a supporter to help the children and families enjoy their day,” said Craig Foust, event coordinator of the 2018 Yacht Blast for Kids. 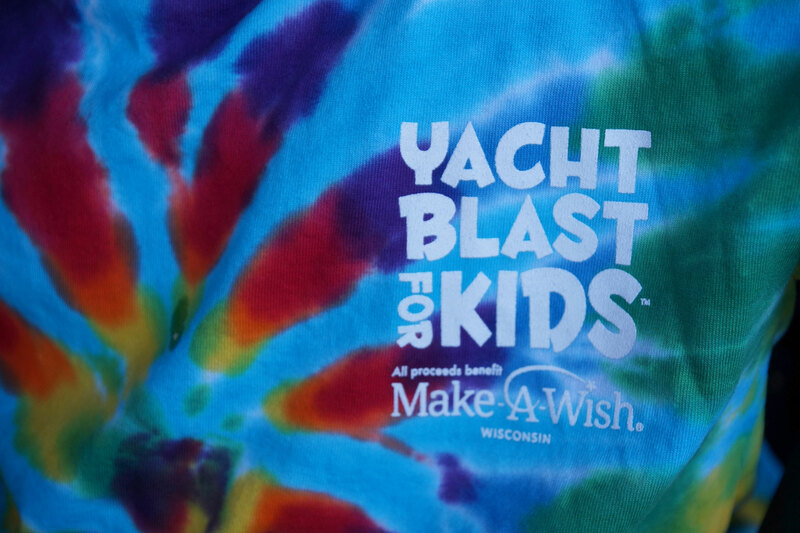 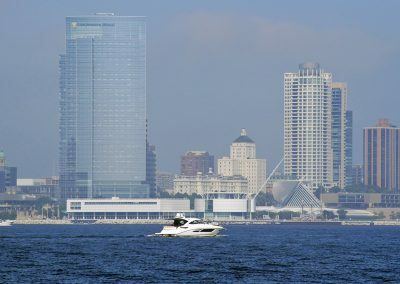 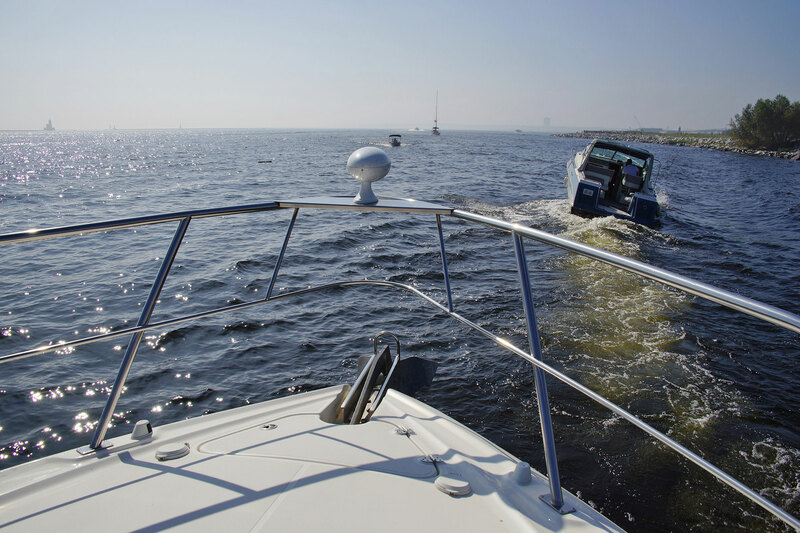 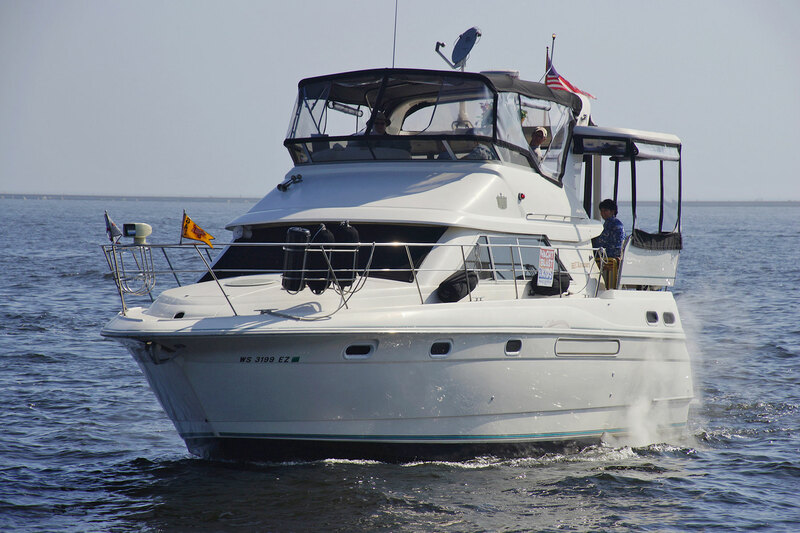 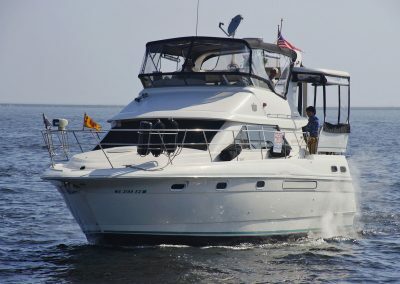 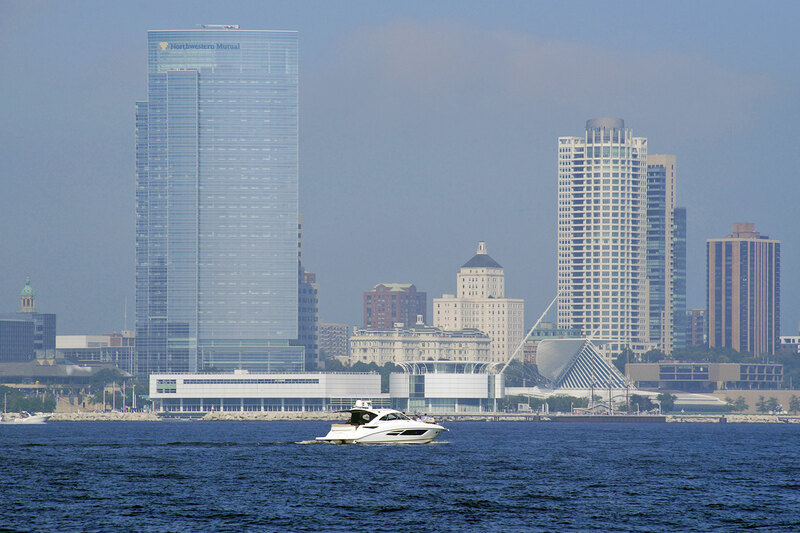 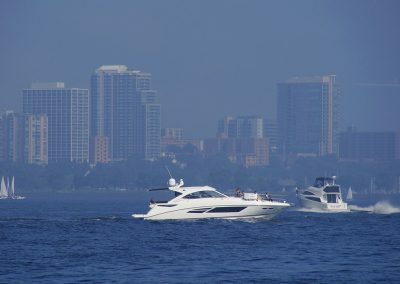 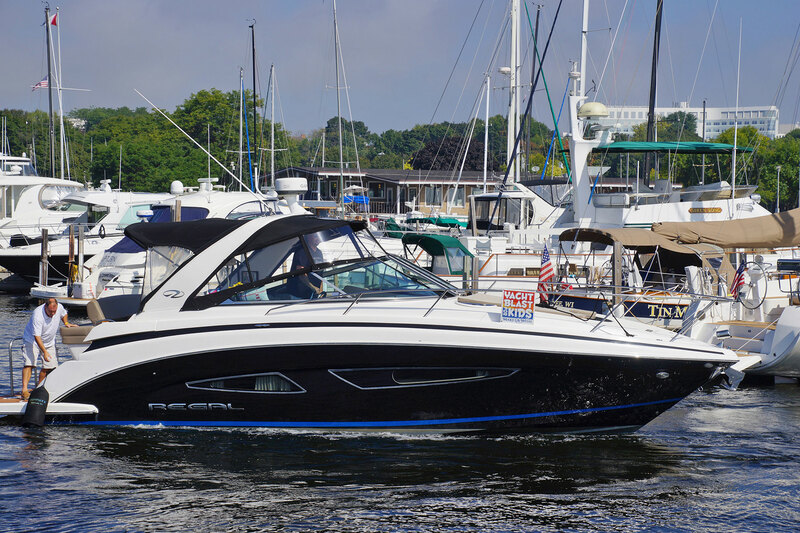 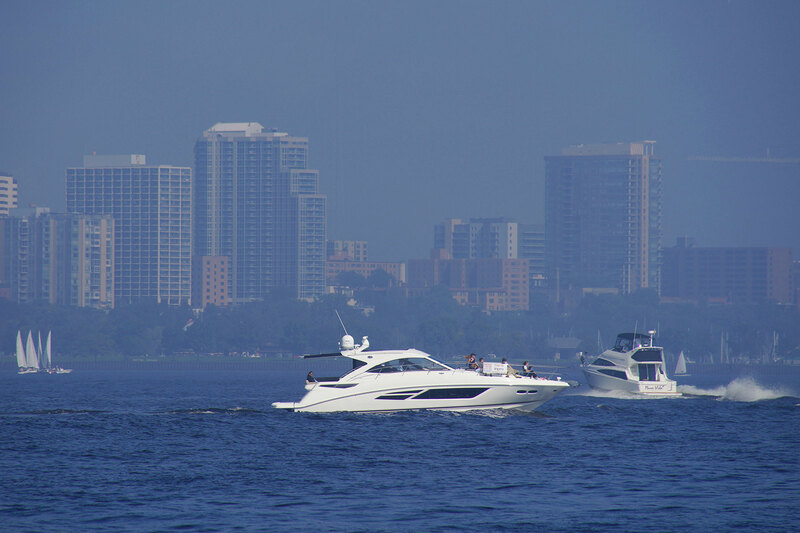 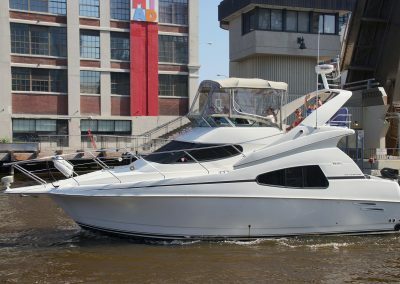 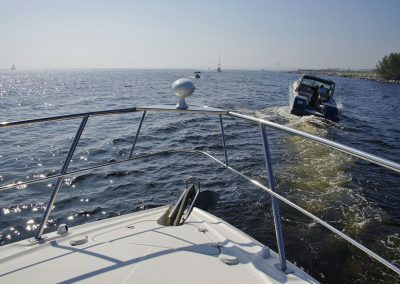 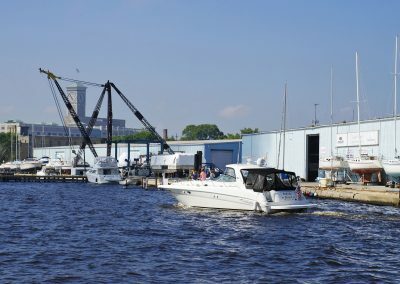 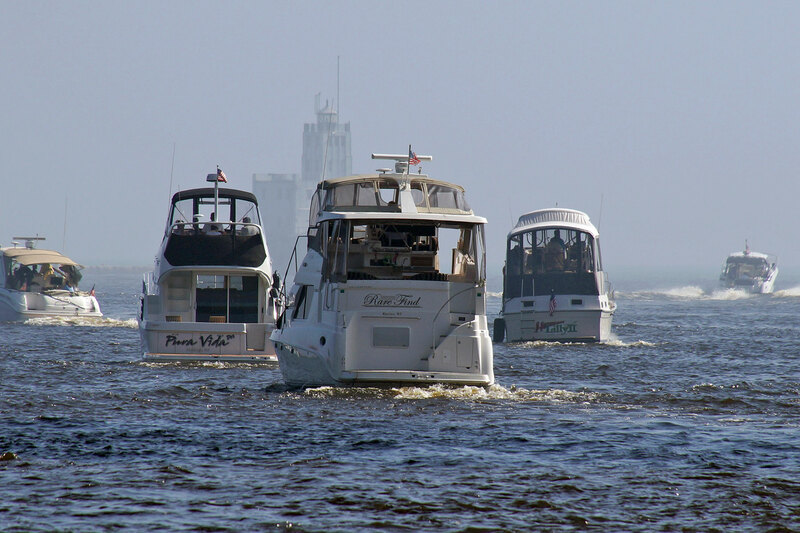 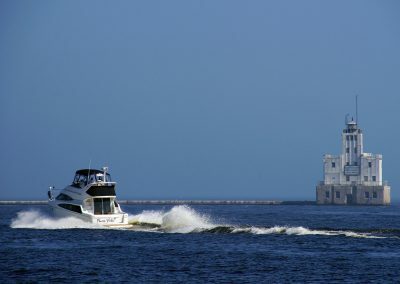 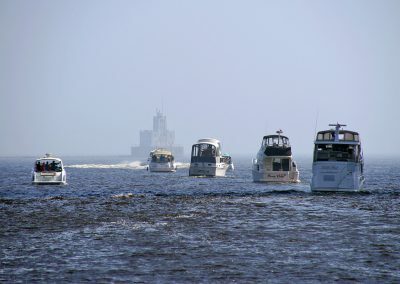 Yacht Blast was founded in 2009 when Milwaukee businessman, Glen Kennedy, was boating in Florida. 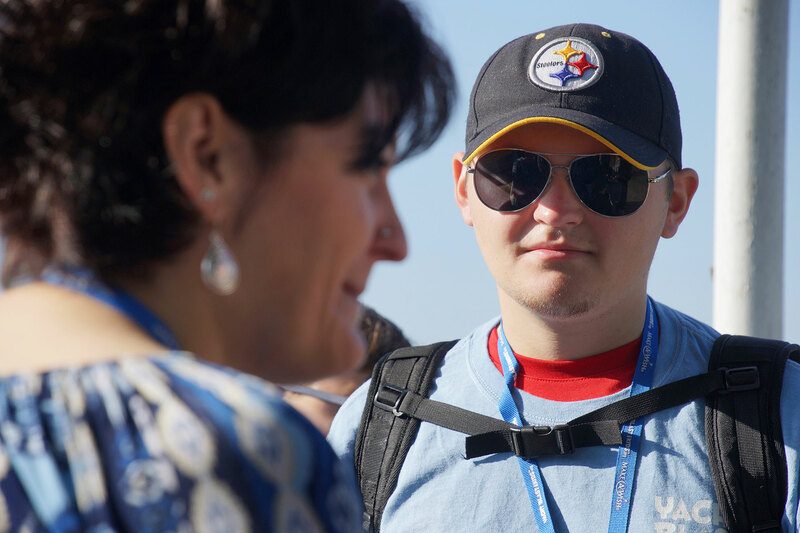 He met a child and his family that were receiving a wish from the Make-A-Wish Foundation. 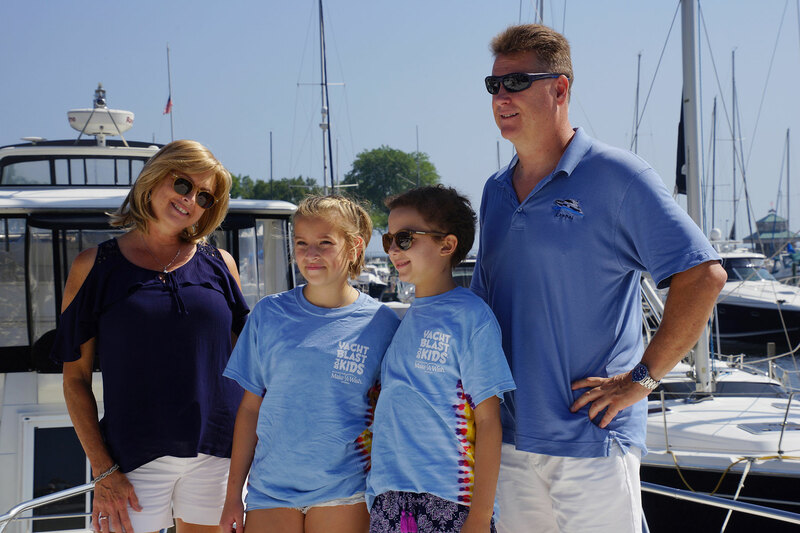 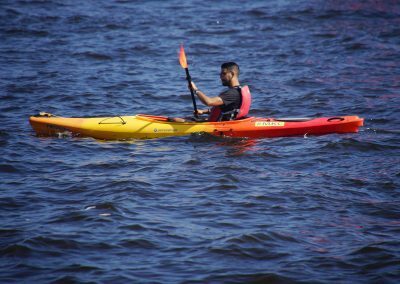 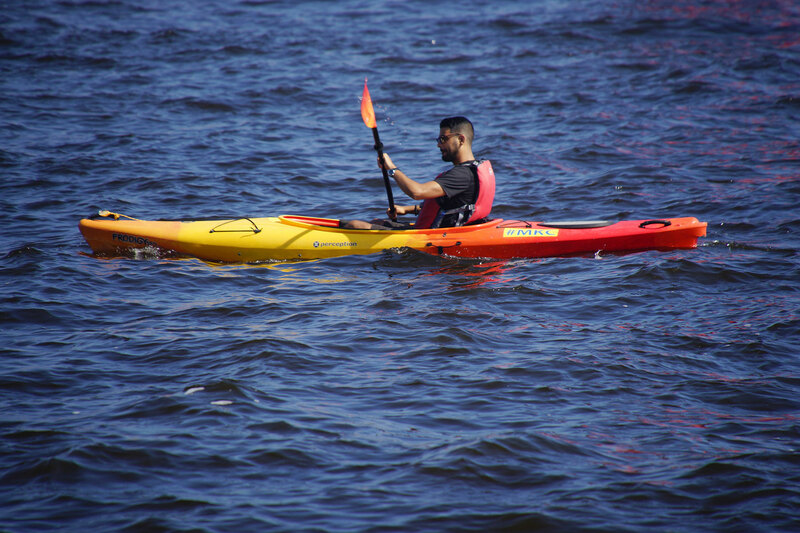 After that experience, he was inspired to provide children who were battling life-threatening medical conditions a day on the water. 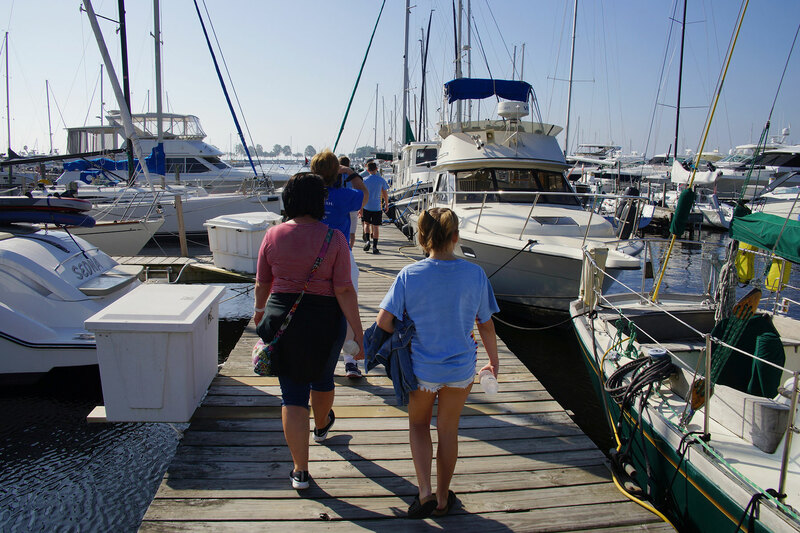 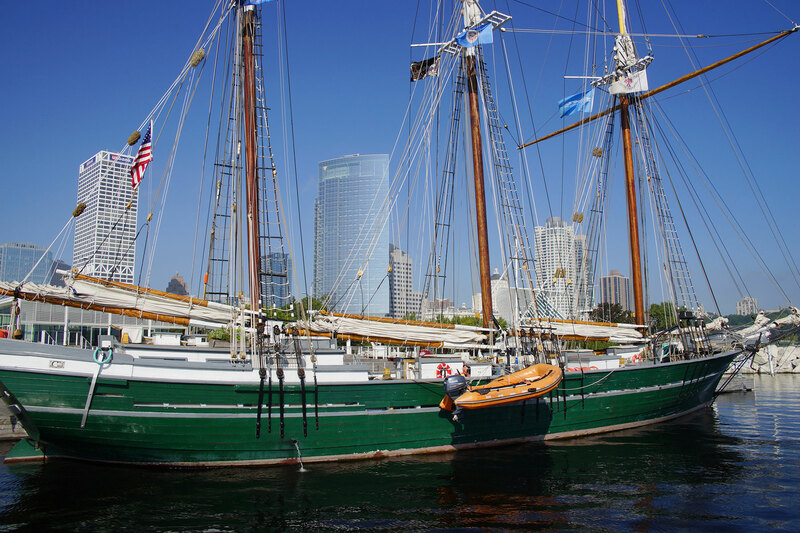 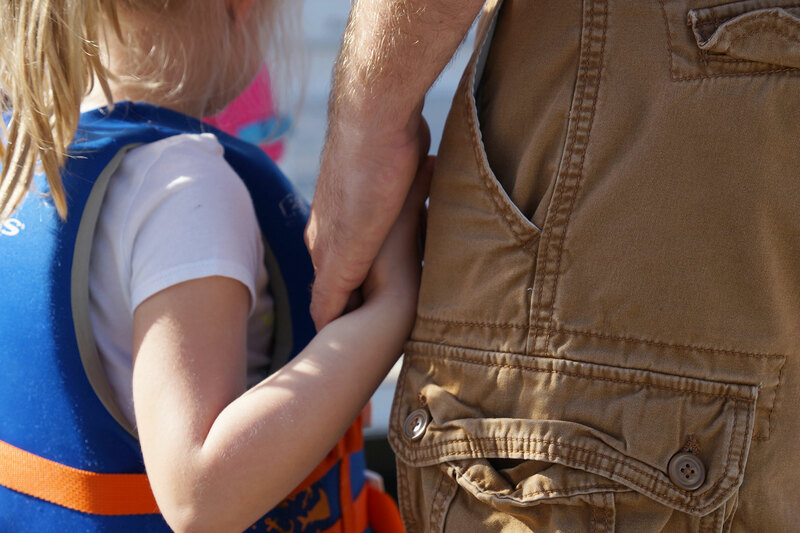 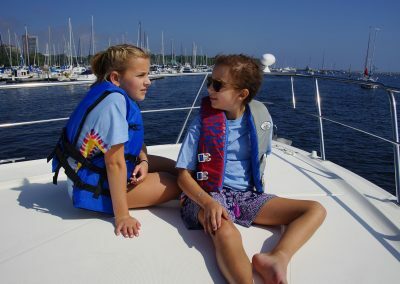 The yacht voyage was not only meant for the children, but also for their families who are affected as caregivers. 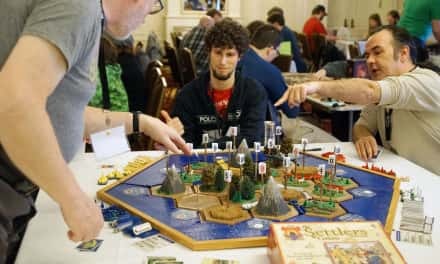 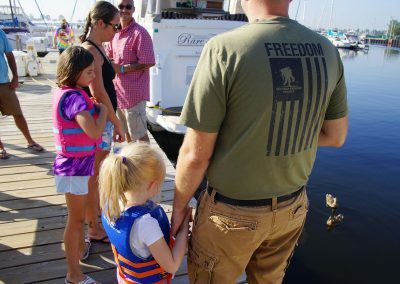 It was a way to help everyone forget, at least for a short time, all the issues they had to deal with on land. 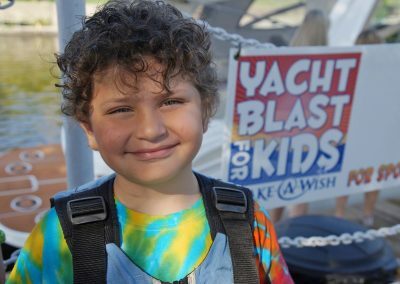 One of the participants, Seth Bayles, received his wish four years ago. 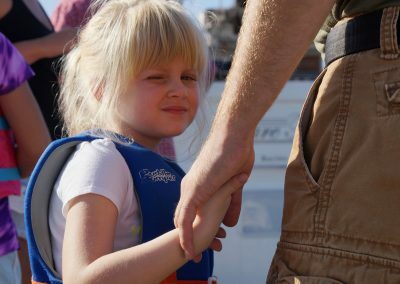 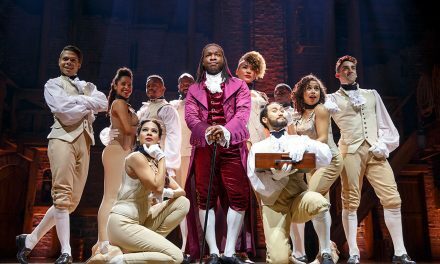 He was able to travel to the Grand Canyon in a twenty-six foot RV with his family, and then go white water rafting on the Colorado River. 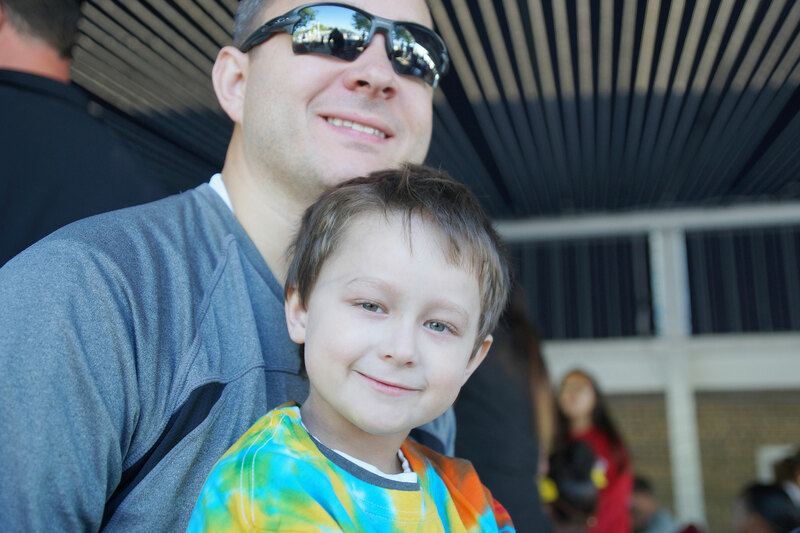 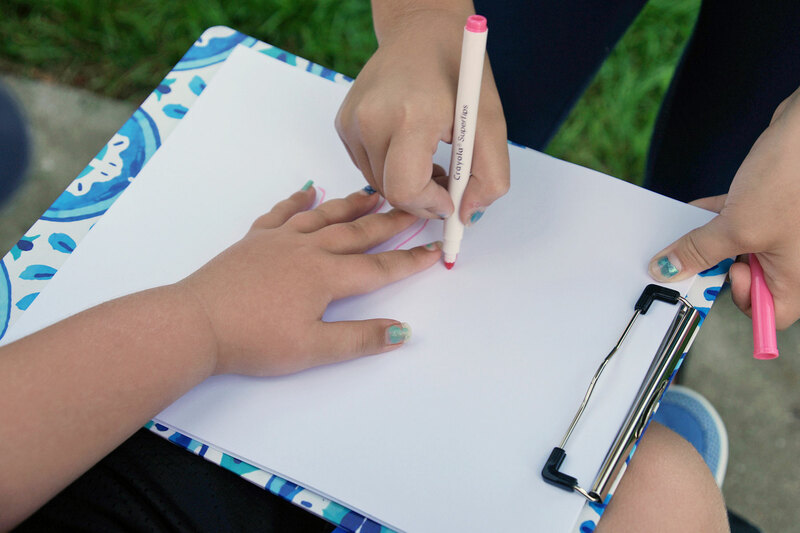 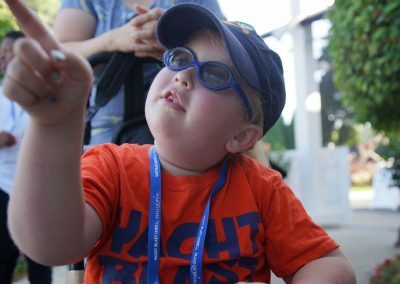 A wish experience affects the mental and emotional well-being of the child, it can help improve the quality of life, and result in an improvement in the child’s overall physical health and strength. 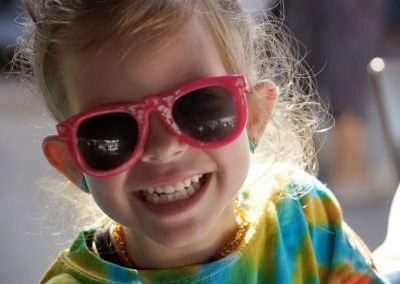 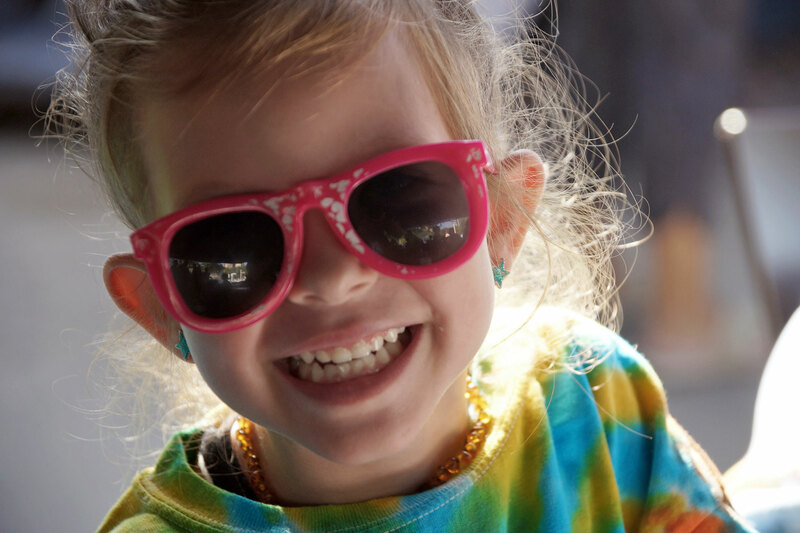 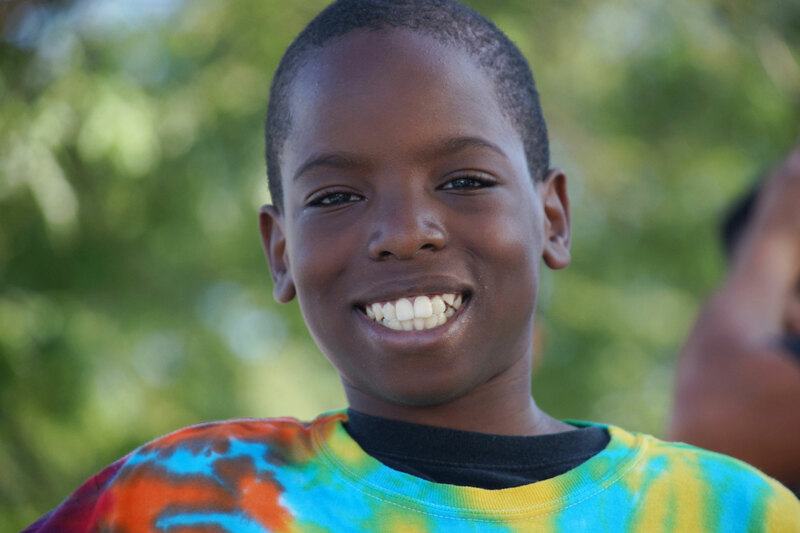 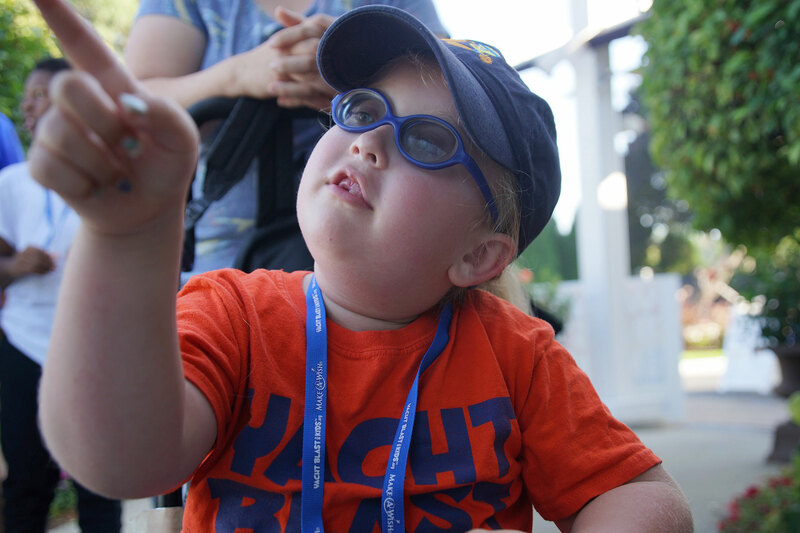 A wish is empowering to a child. 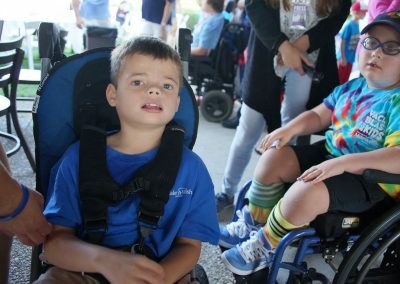 It gives them a feeling of control and provides them with a sense of being normal again. 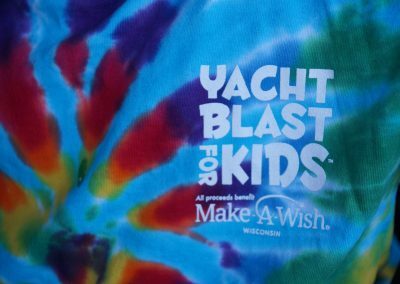 Laura Rohde first found out about Make-A-Wish and the kindness of their charity program from her workplace. 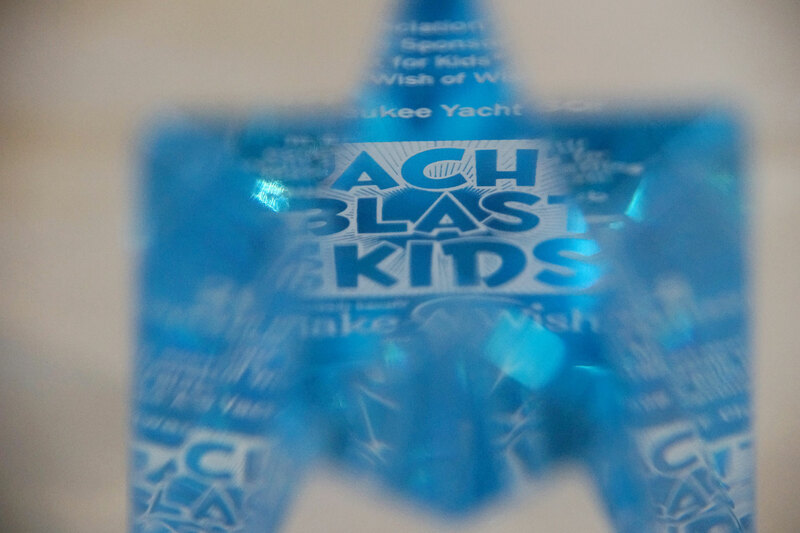 She felt that her daughter Ashley needed to experienced the healing power of a granted wish. 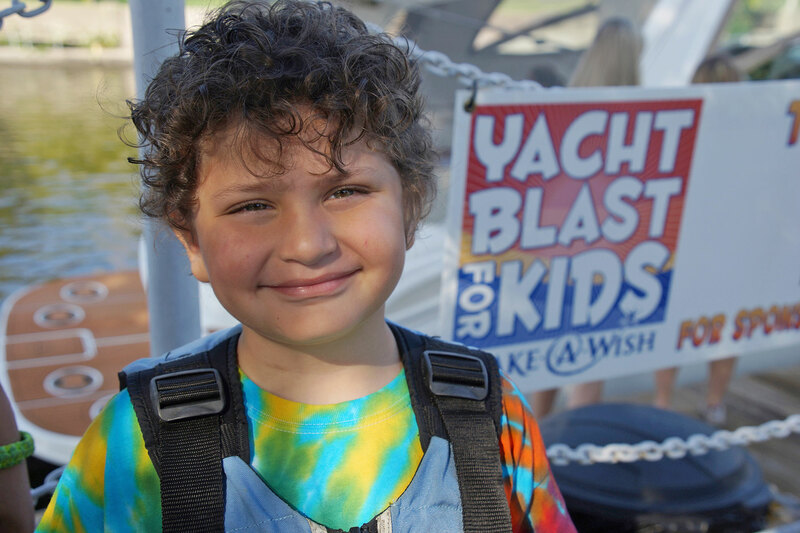 Due to her health and many visits to the hospital, Ashley had her wish postponed. 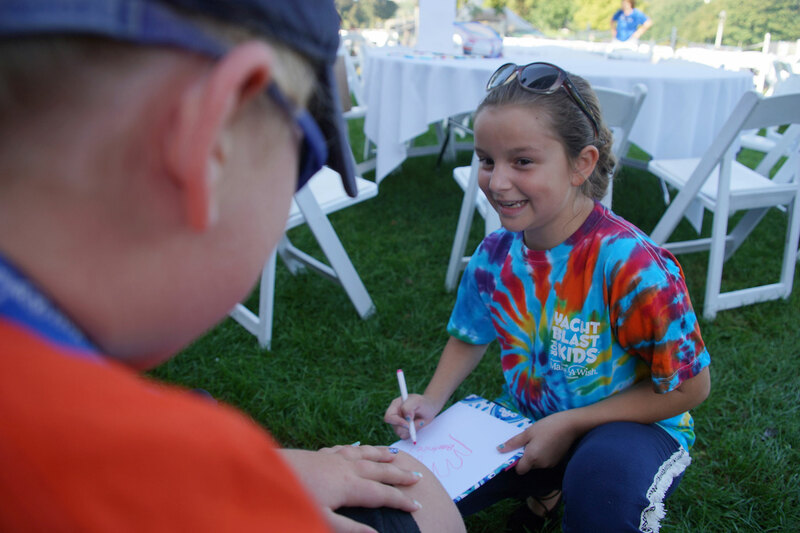 Her medical team had to approve the logistics of her wish, but Ashley’s wish was granted. 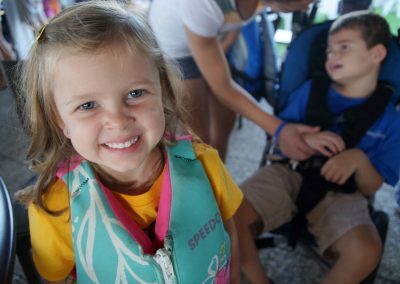 She and her family are preparing for a Disney cruise in December. 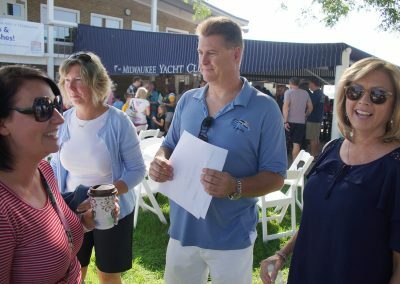 “Right now is the strongest she has ever been,” said Rohde. 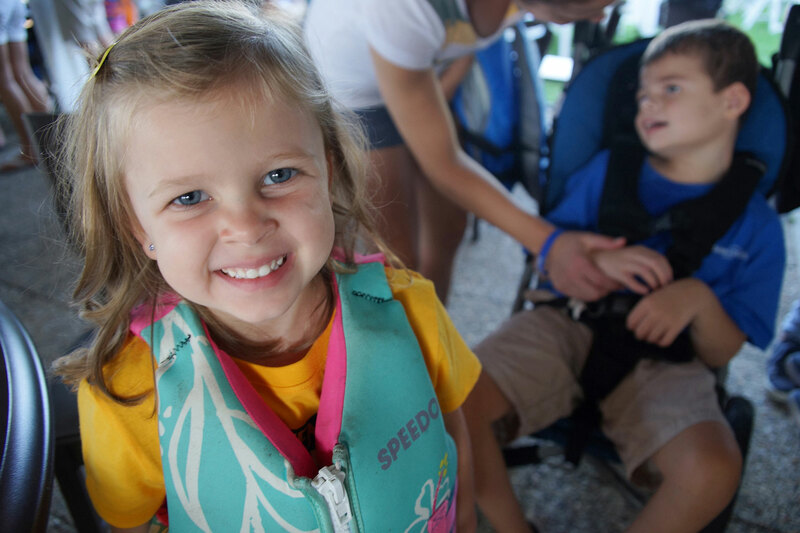 The second part of Ashley’s wish is to swim with dolphins. 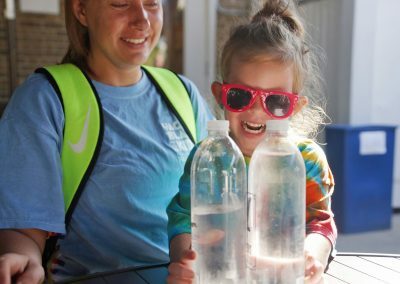 Just like any other child, she loves slime, asks her mom if friends can come over “to help with homework,” and is very inquisitive. 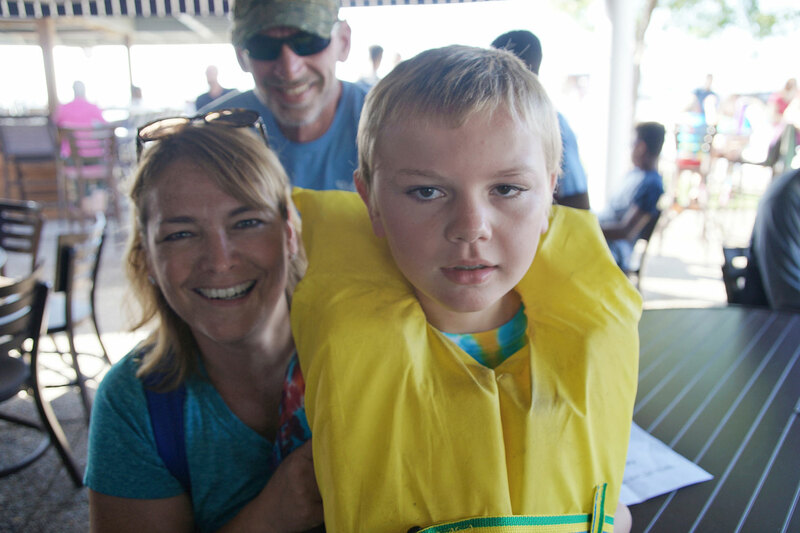 At first glance, it is not obvious that Ashley has a health condition. 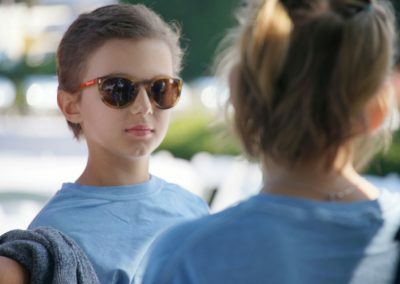 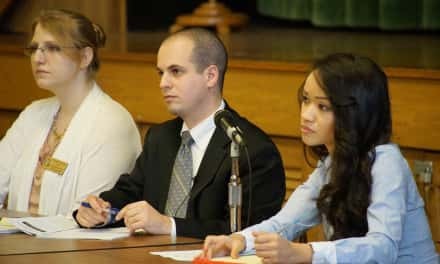 However, her family knows firsthand the battles they have overcome to get Ashley where she is today. 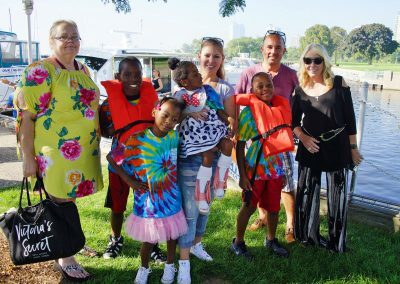 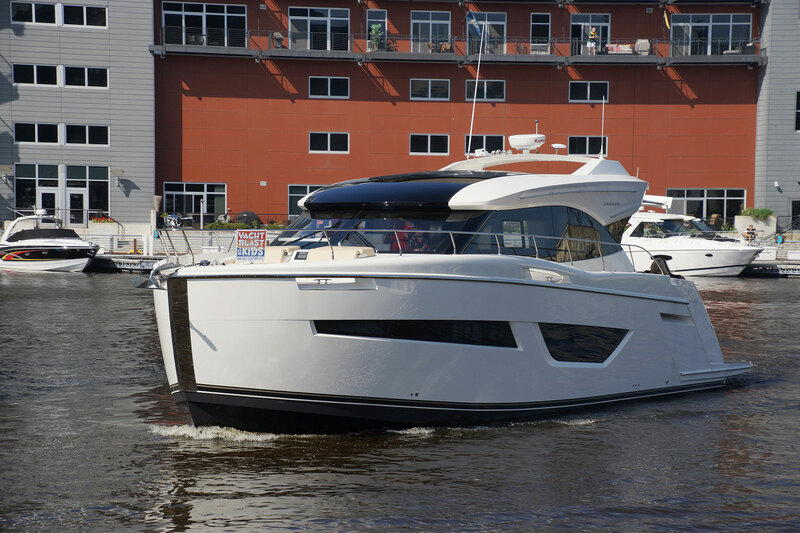 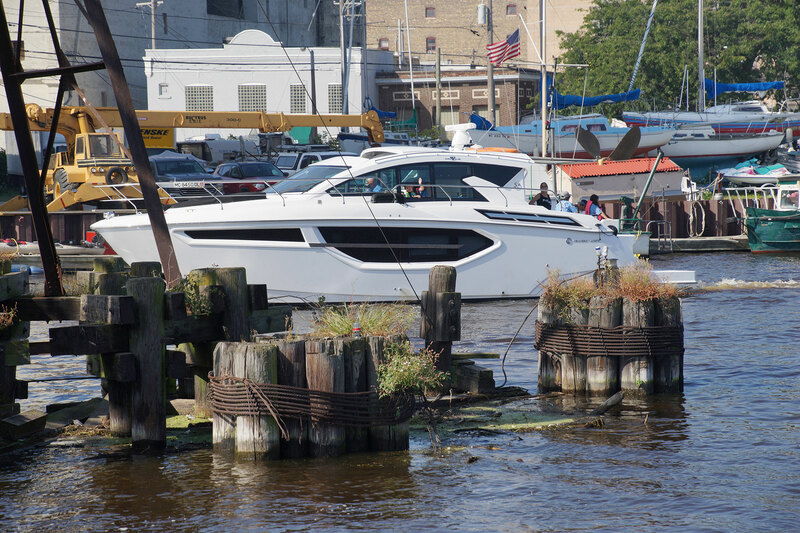 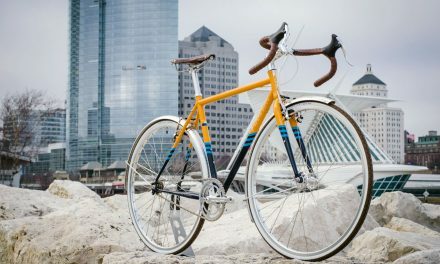 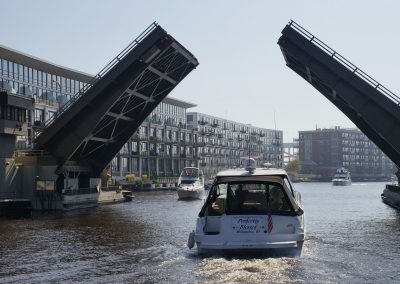 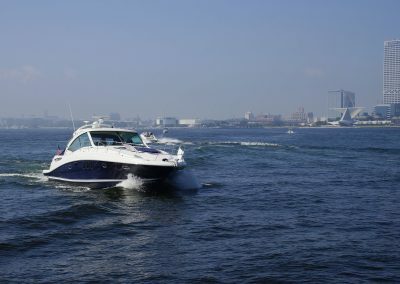 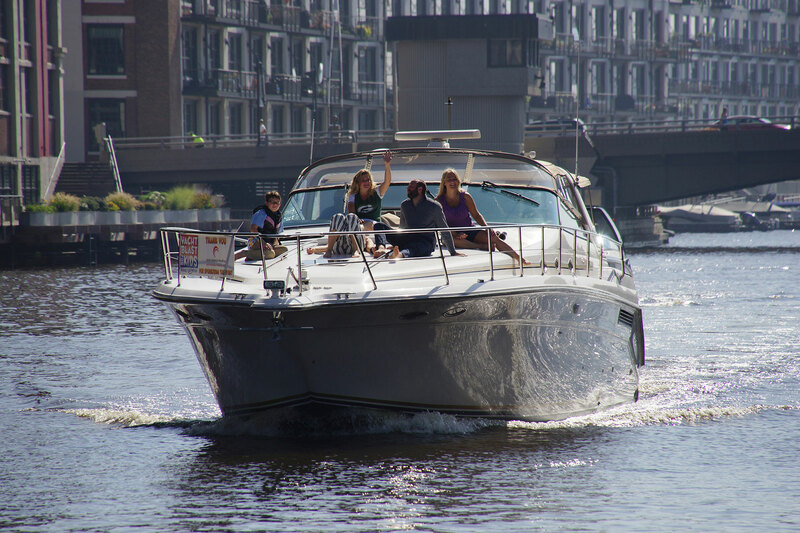 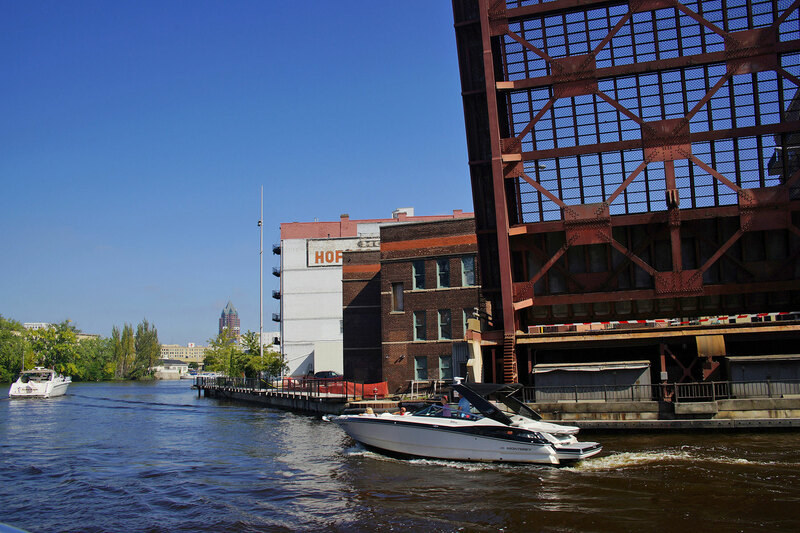 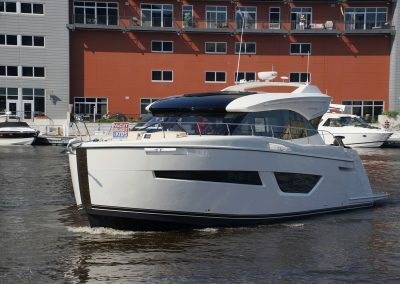 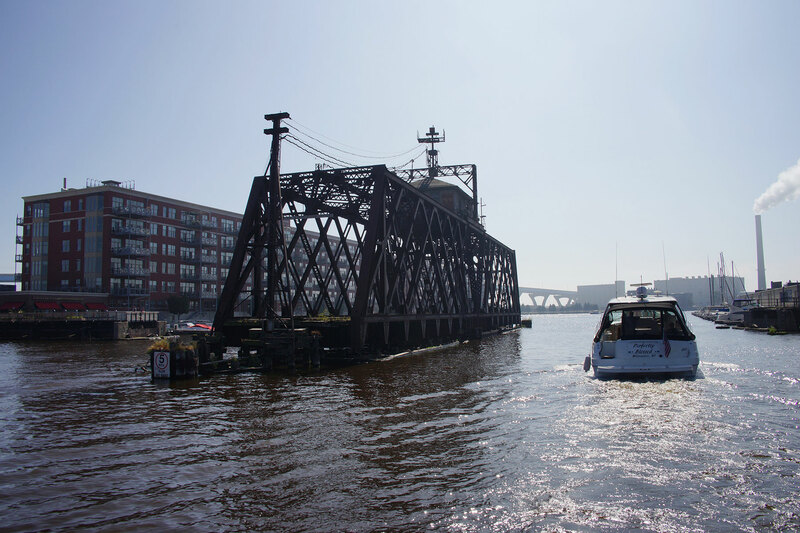 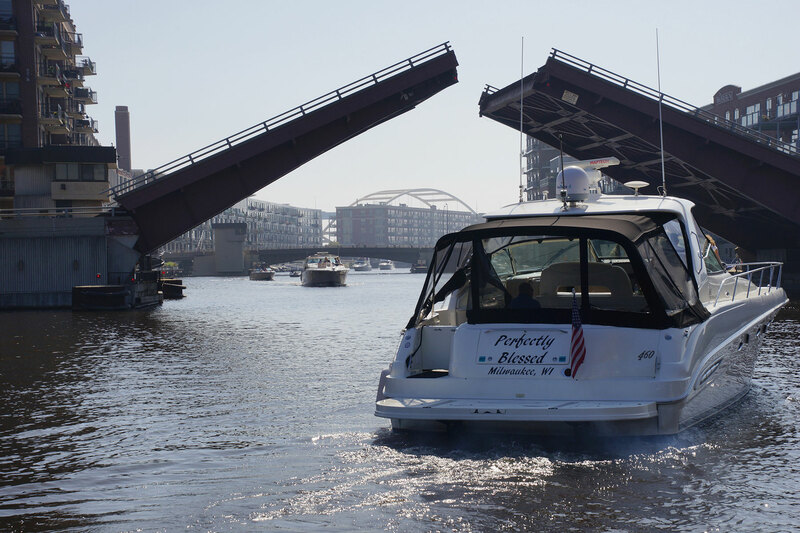 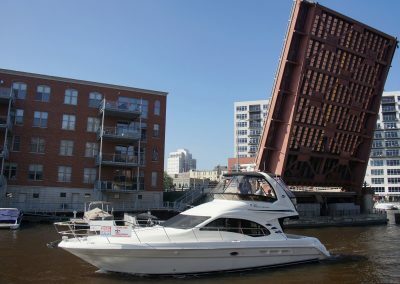 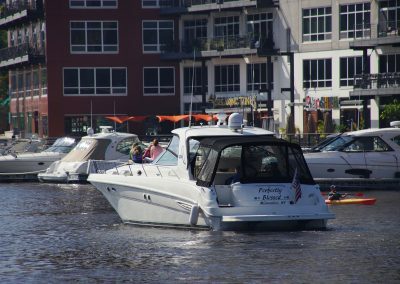 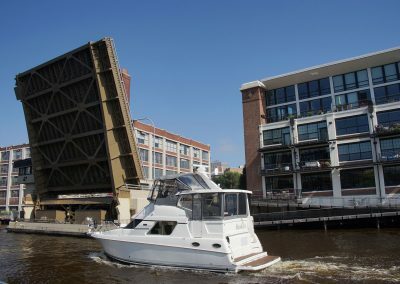 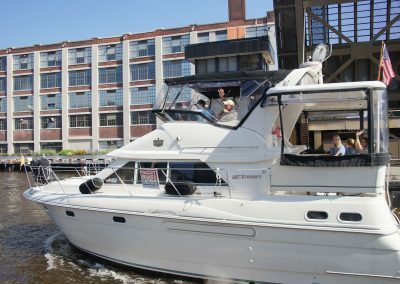 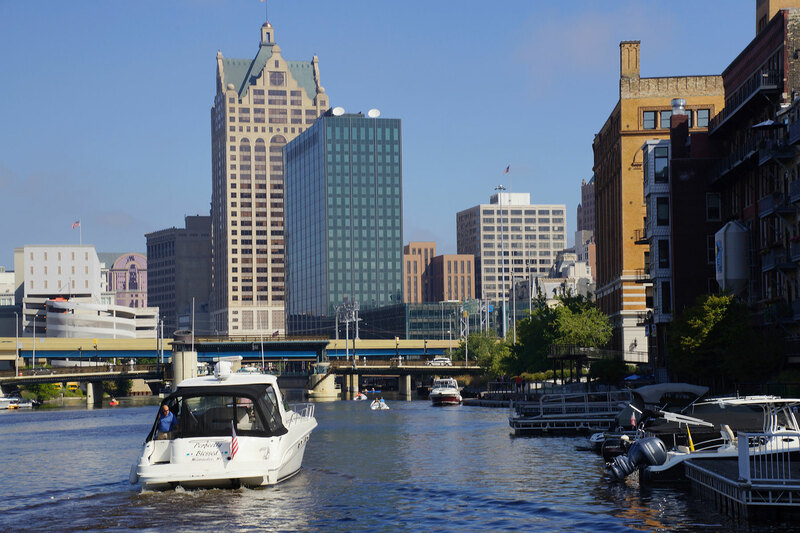 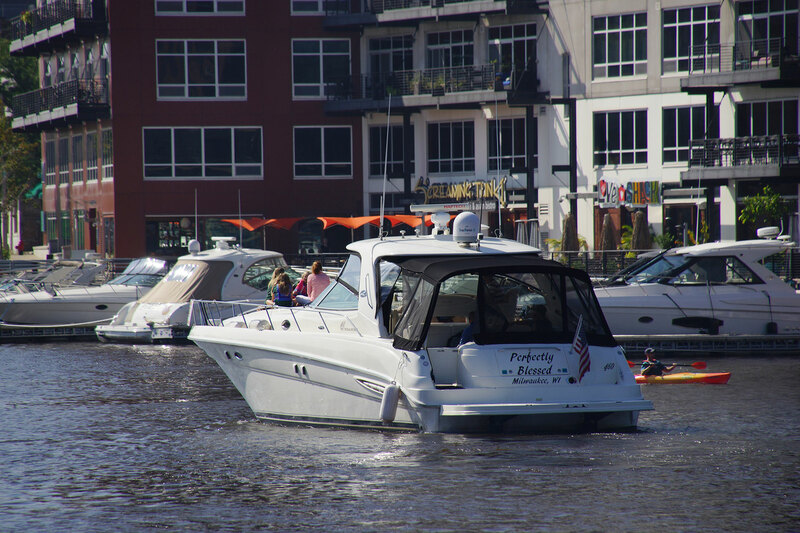 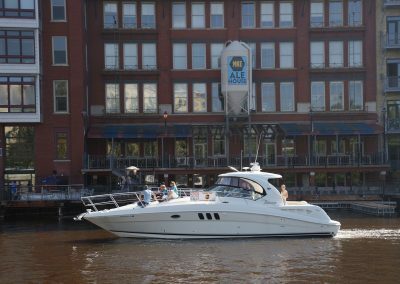 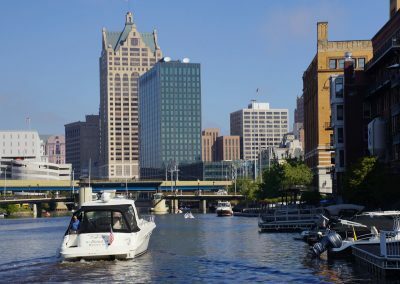 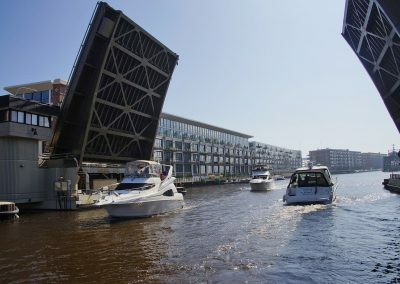 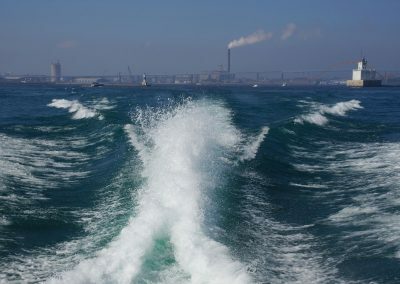 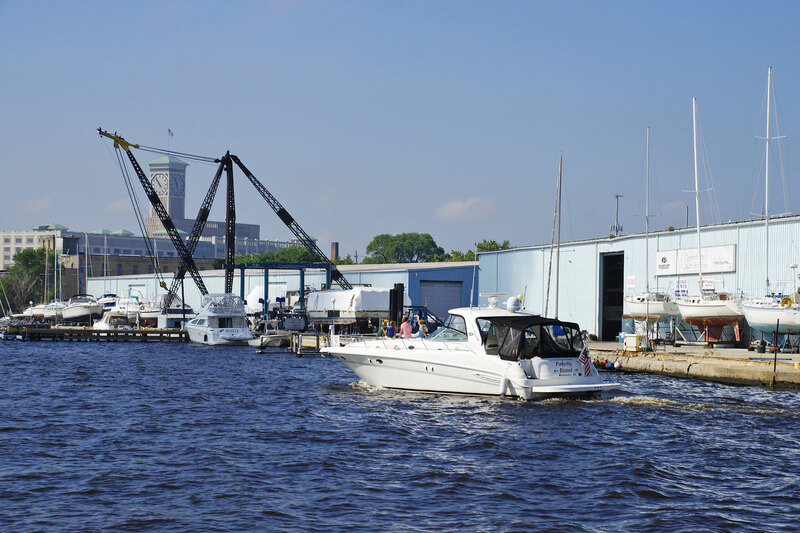 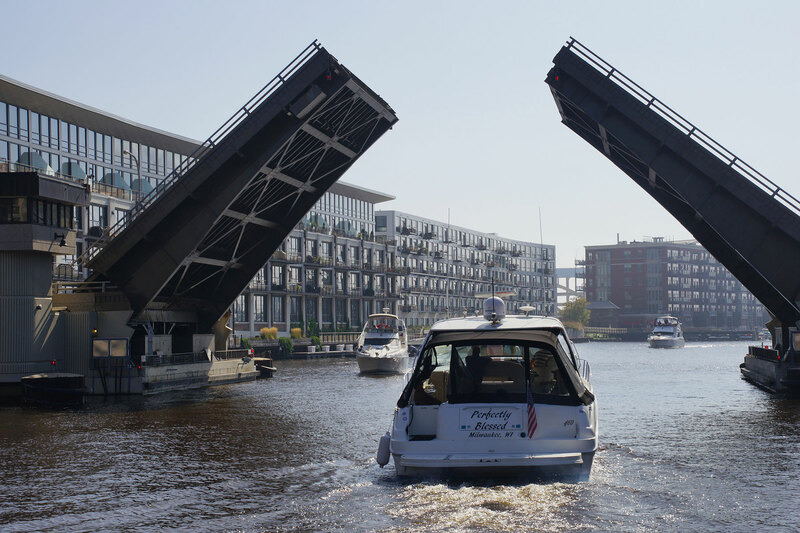 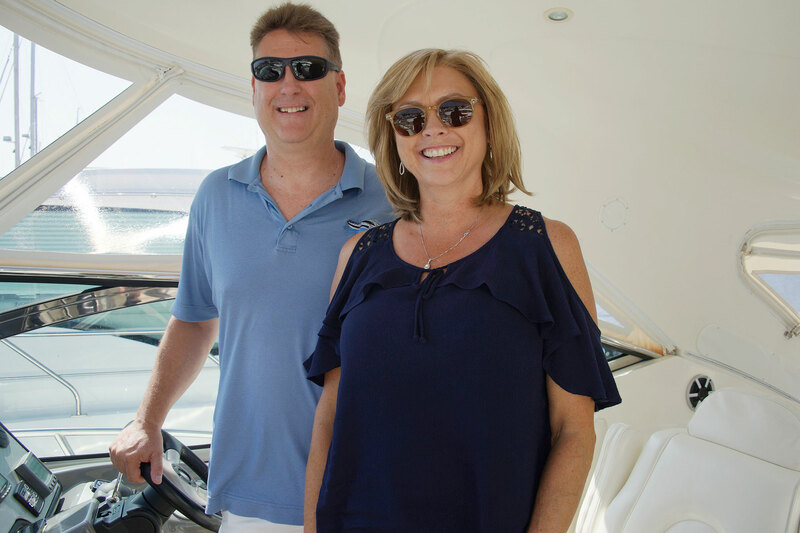 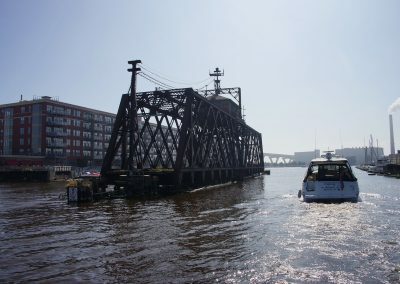 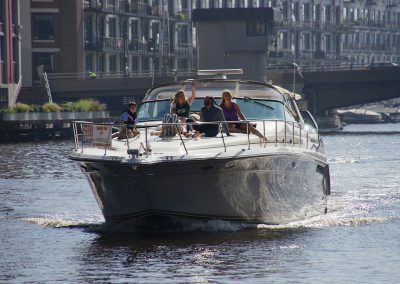 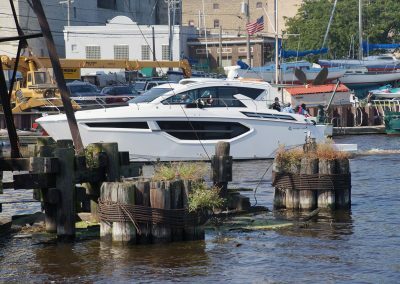 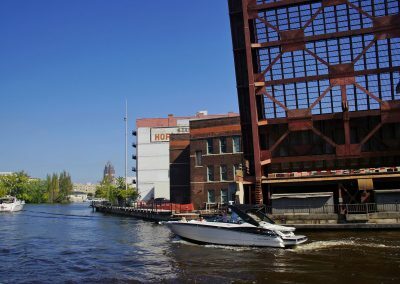 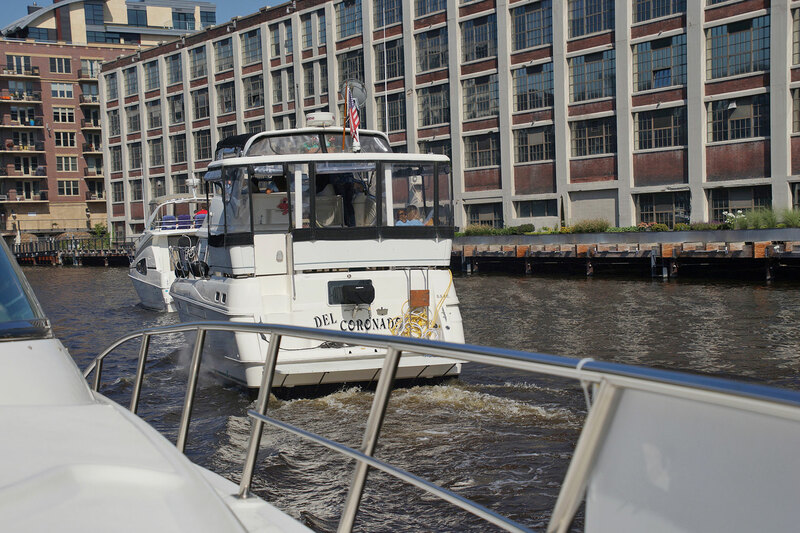 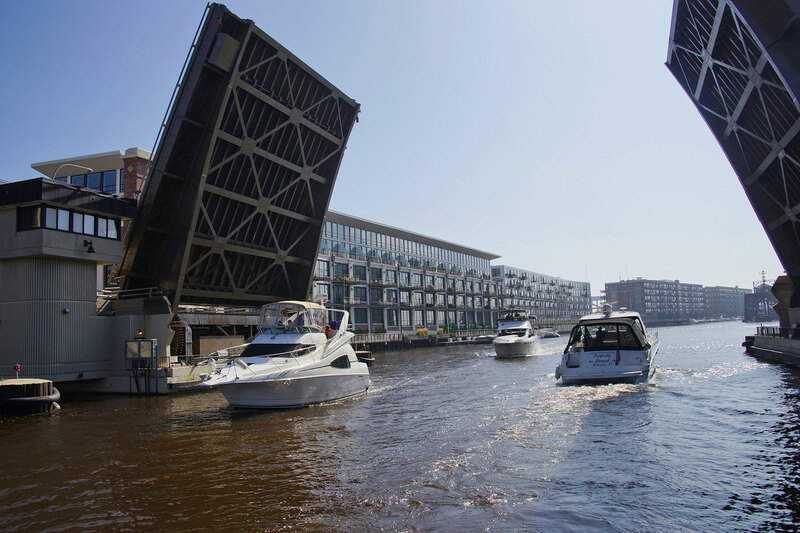 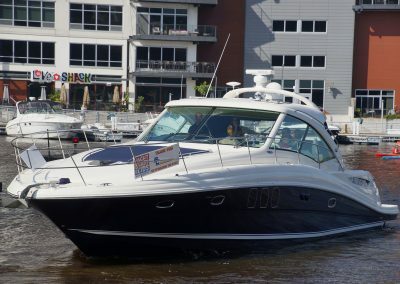 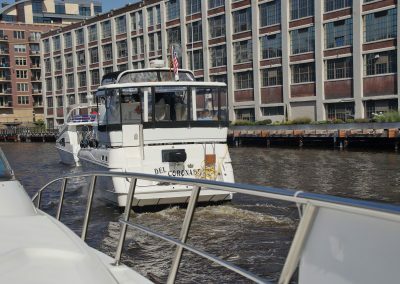 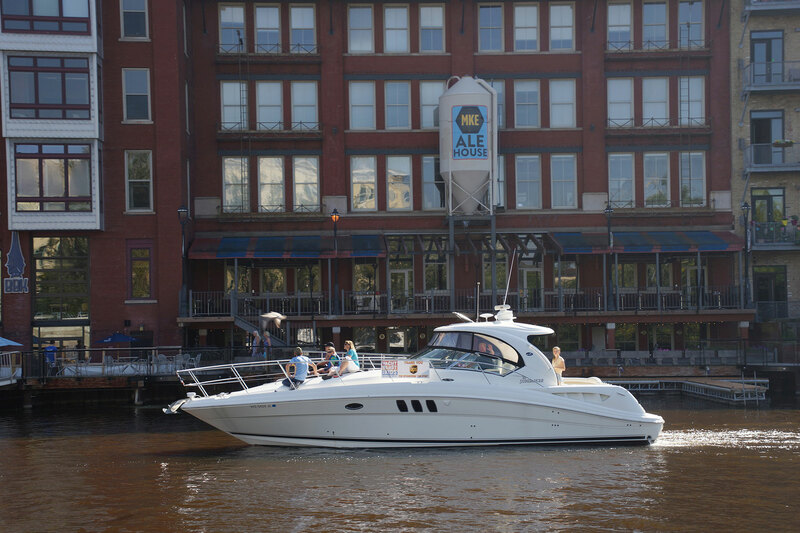 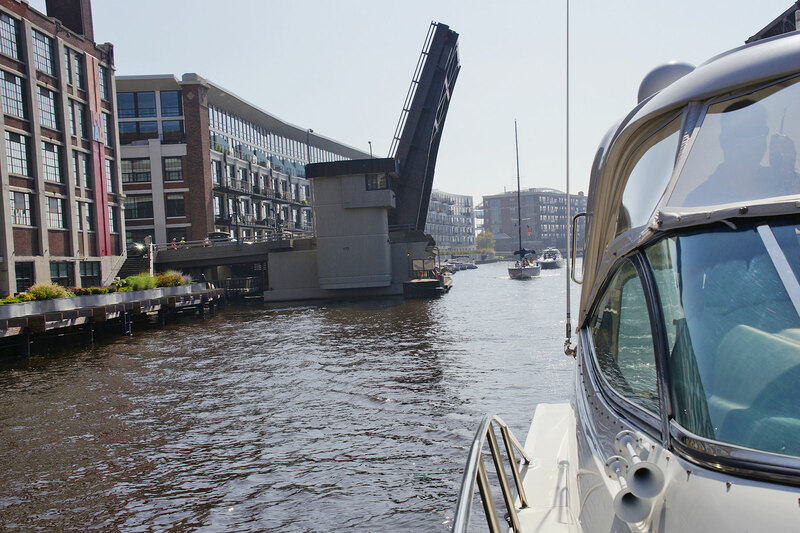 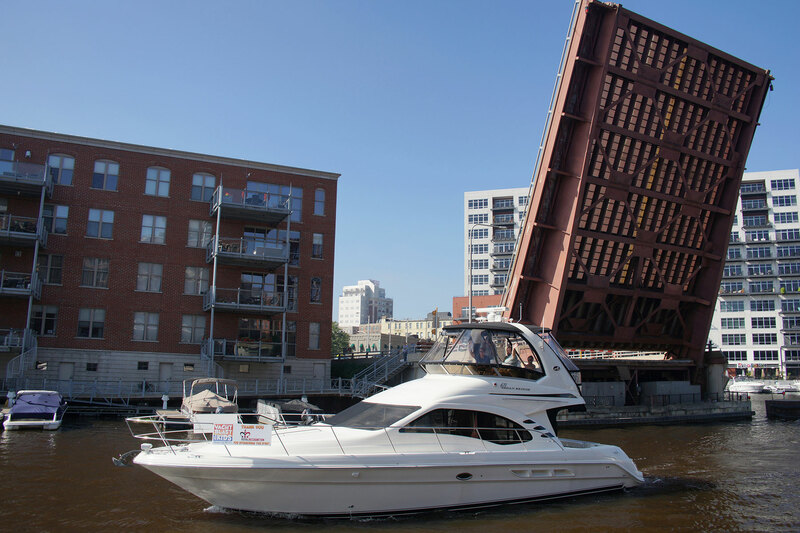 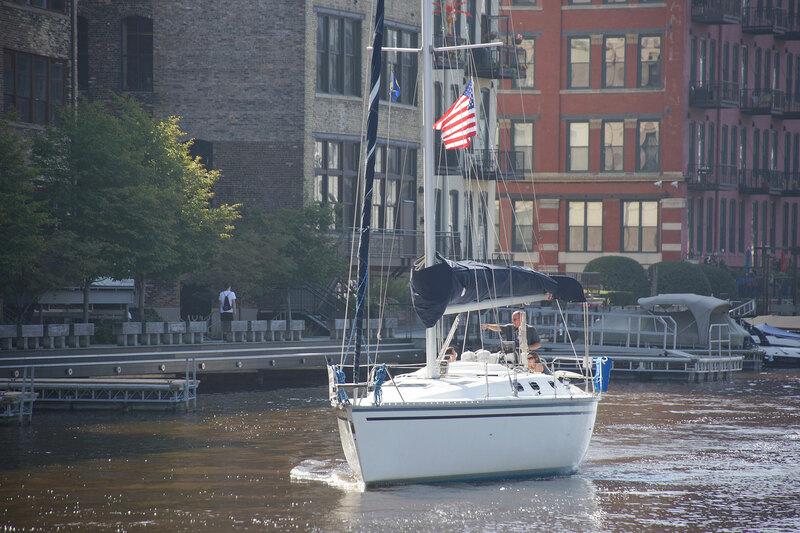 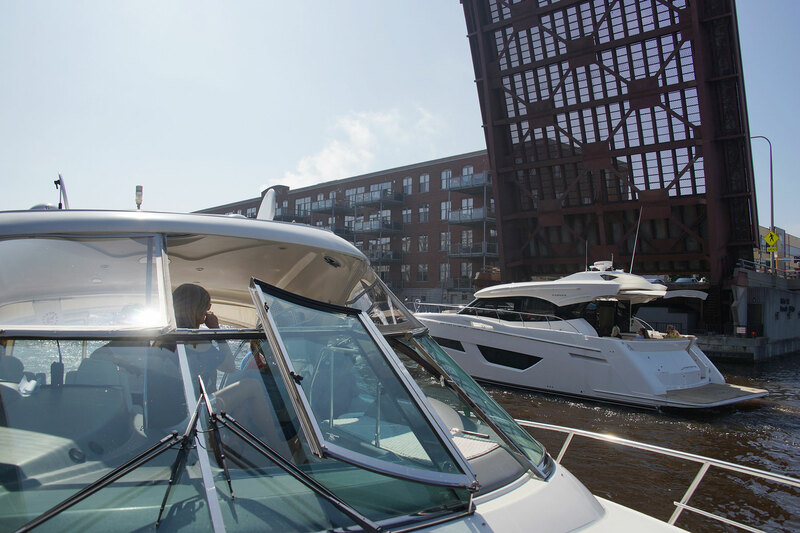 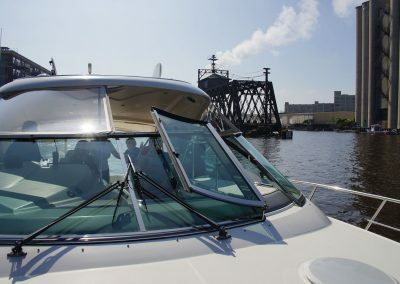 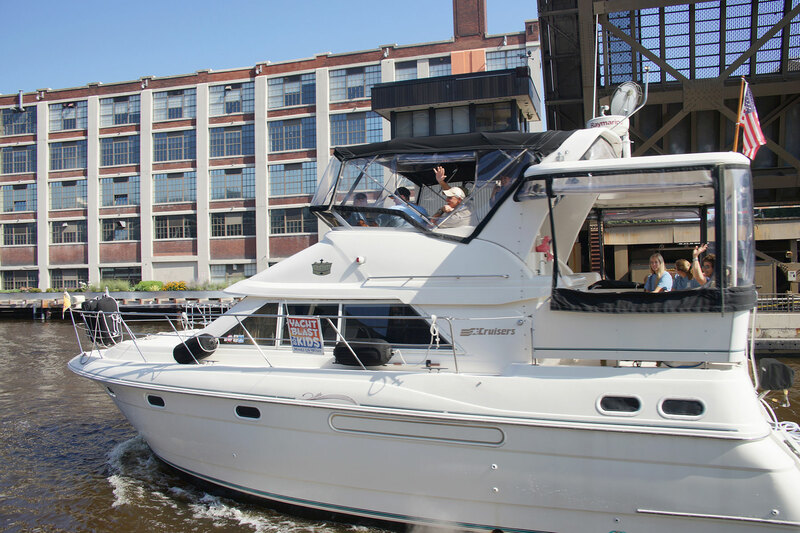 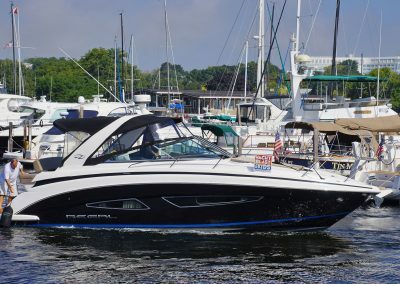 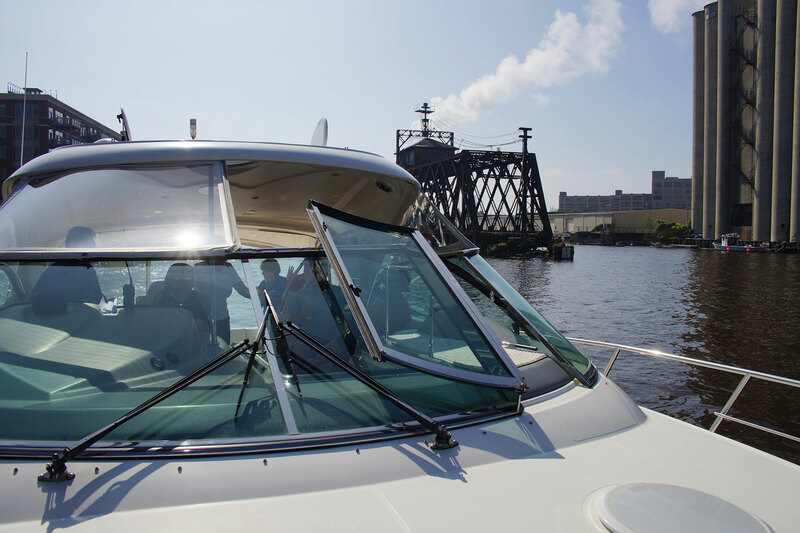 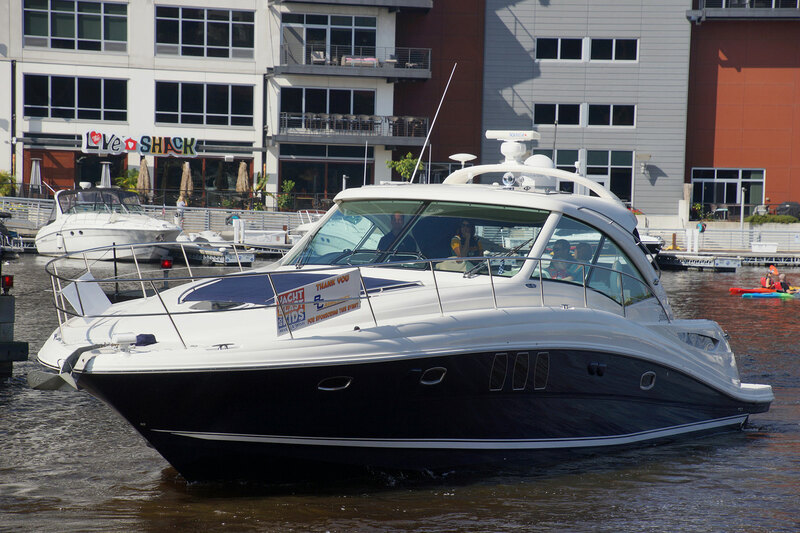 Ashley and her family were matched with yacht owners Robert and Debra Prah, and spent their time aboard the “Kampai” (the Japanese expression for “cheers”), soaking in the sights along the Milwaukee River and holding on for a full blast of speed out in the Lake. 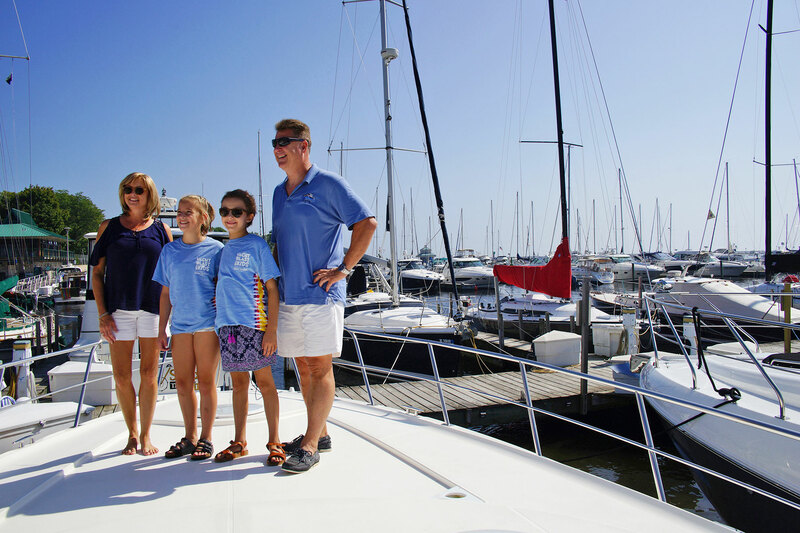 Robert and Debra have hosted families for all ten Yacht Blast seasons. 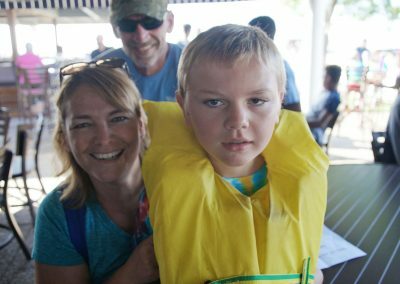 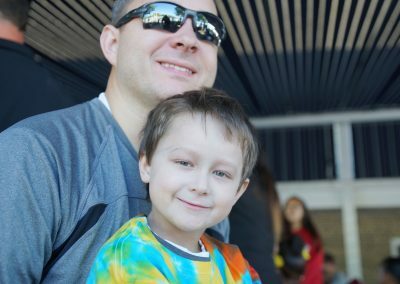 They have enjoyed seeing different families, but also having some come back each year shows that the wish kids are surviving their illness. 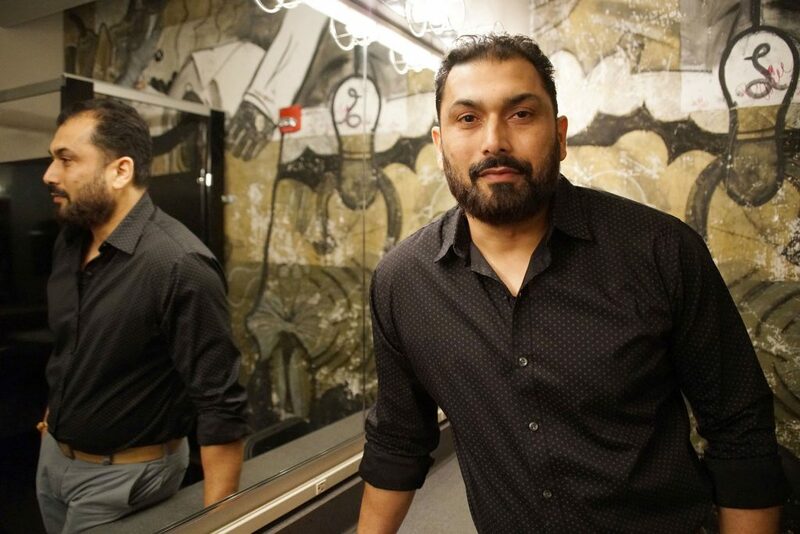 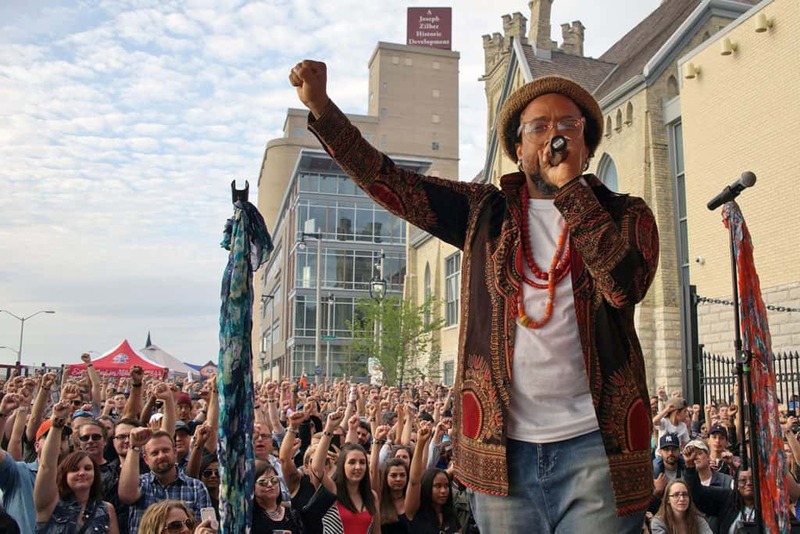 “It’s been a great experience. 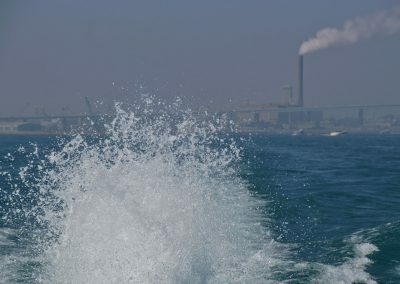 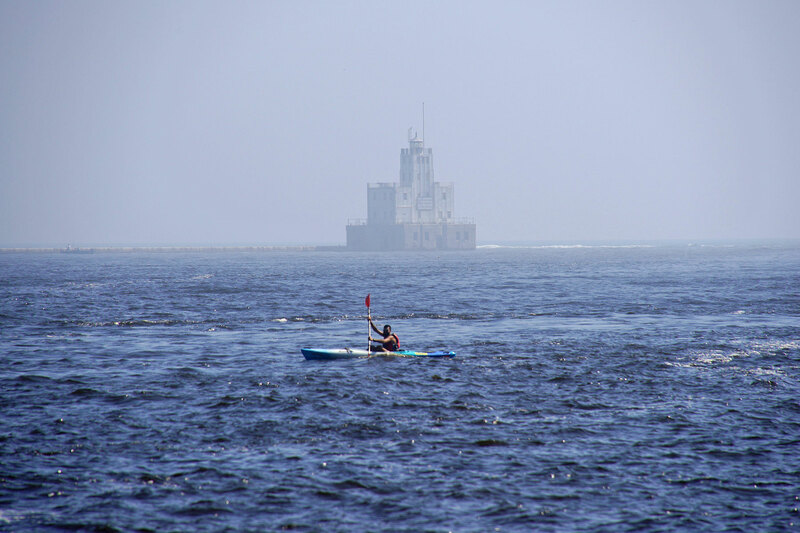 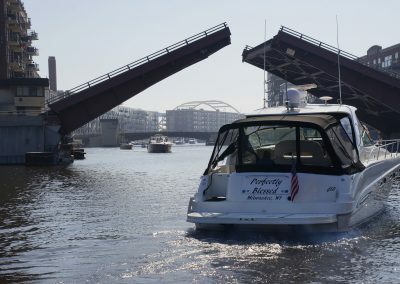 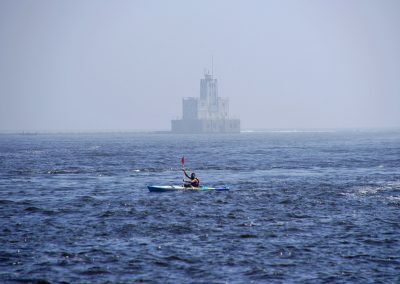 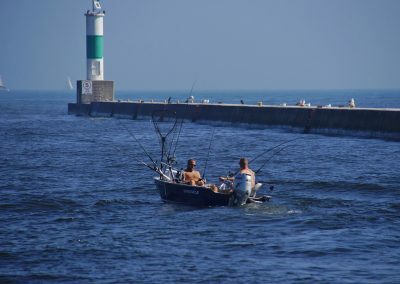 The kid’s like it, and it’s rewarding for us to to be able to take them out and give them a nice day on the water,” said Prah. 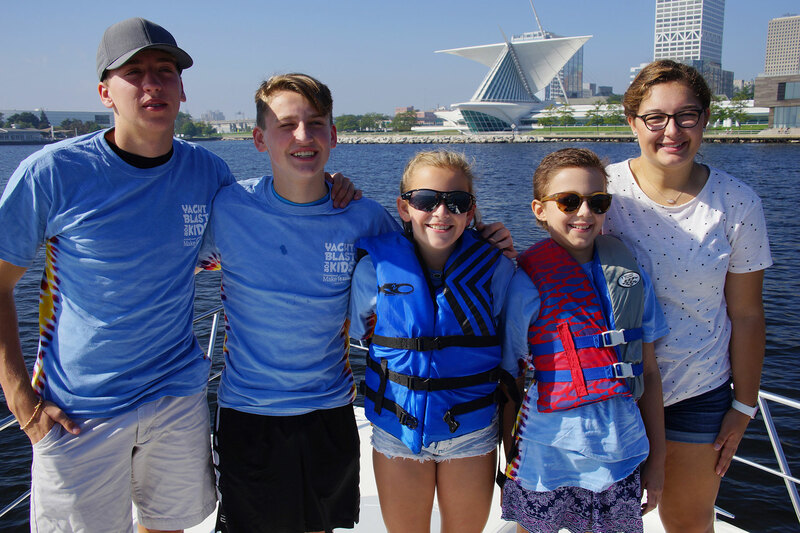 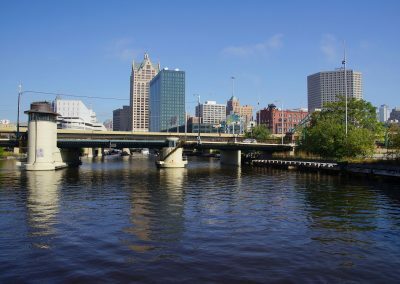 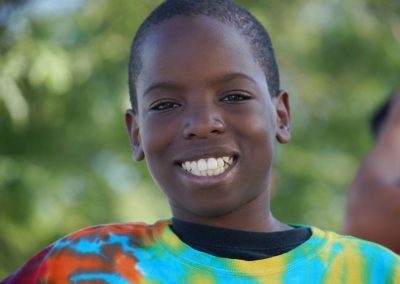 For 2018, Make-A-Wish Wisconsin has granted more wishes than ever before, with 400 wishes through charitable donations. 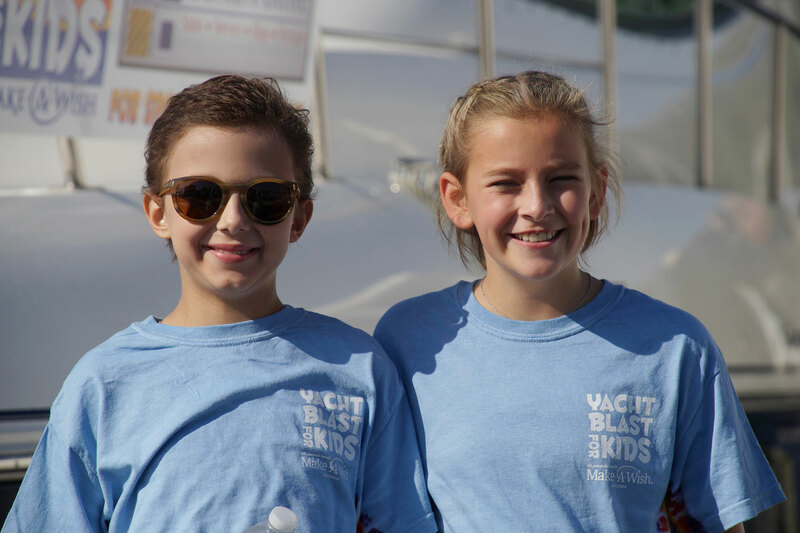 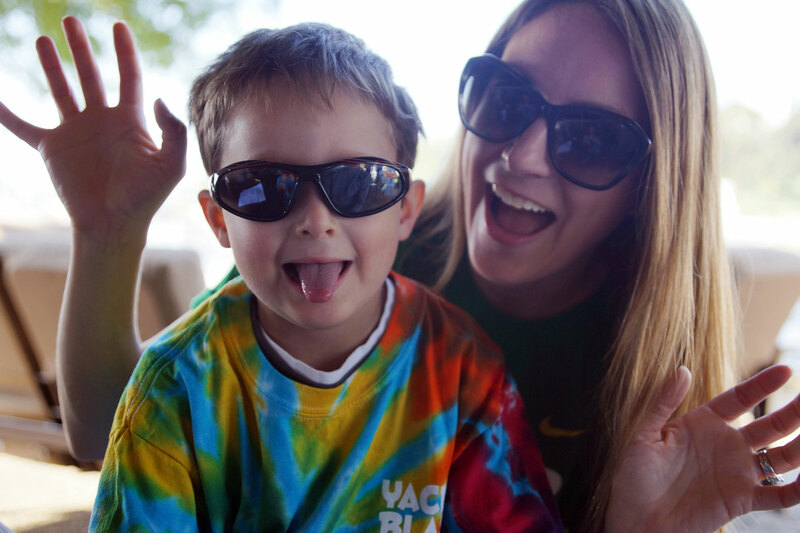 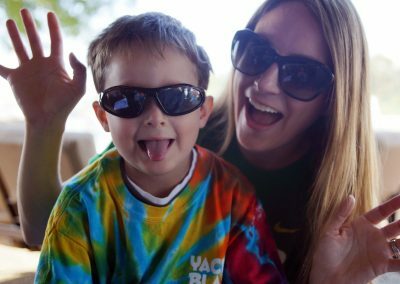 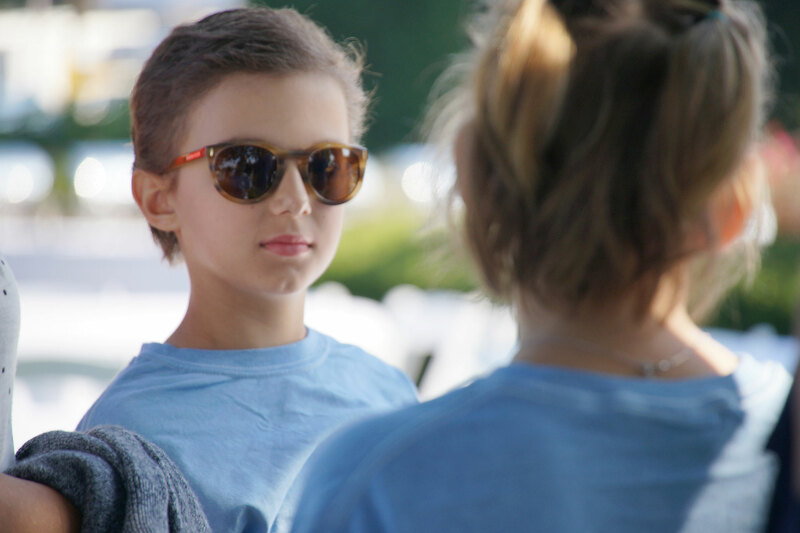 Events like Yacht Blast for Kids help support wish kids like Ashley and Seth, providing them and their families with a day of fun and hope.